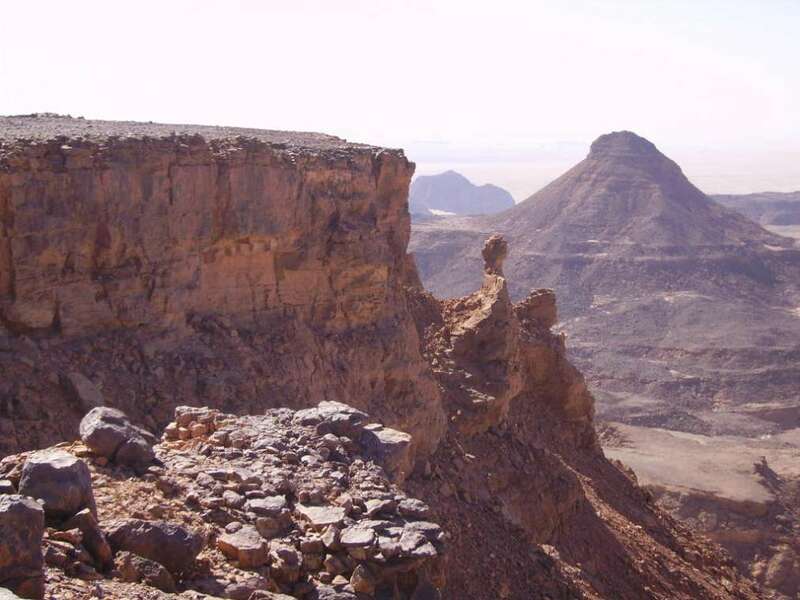 In 1926, when Prince Kemal el Din Hussein makes the expedition to Jebel Uweinat, he saw a "great plateau", and called it "Gilf Kebir" (Great Barrier). 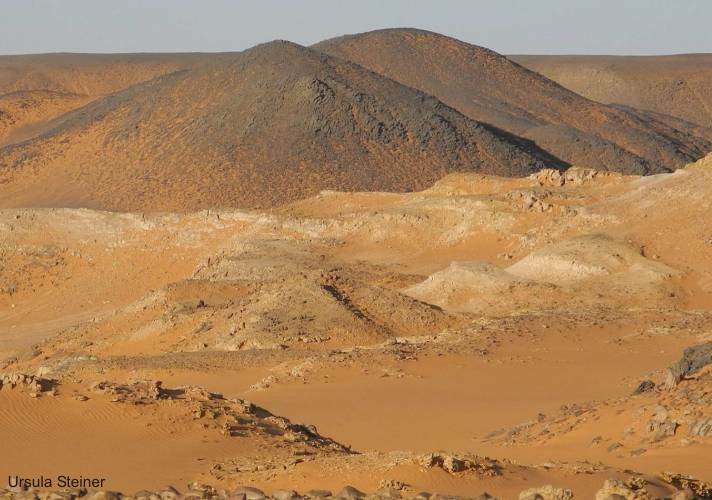 What he could not know that the Gilf Kebir is a vast plateau of Paleozoic sandstones with a length of about 260 km in the NW-SE direction. 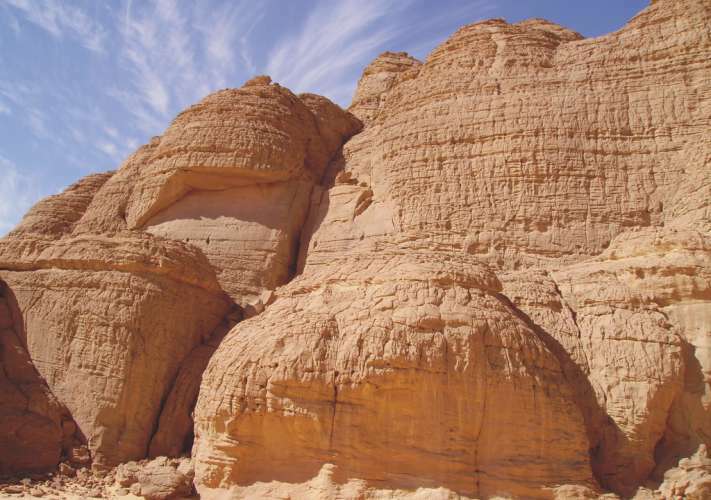 The more than 500 m thick sandstone sequence lies as that of Jebel Uweinat directly on outcropping Precambrian basement. 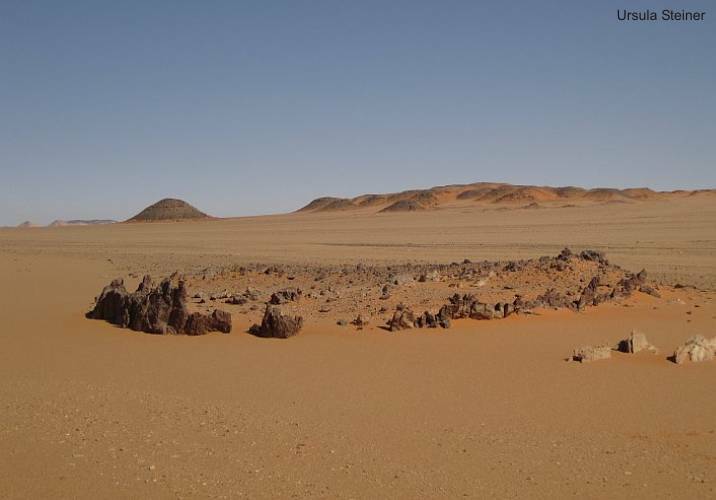 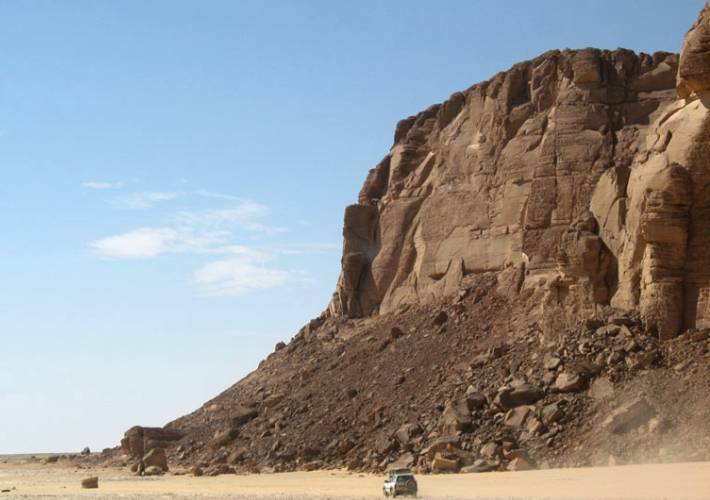 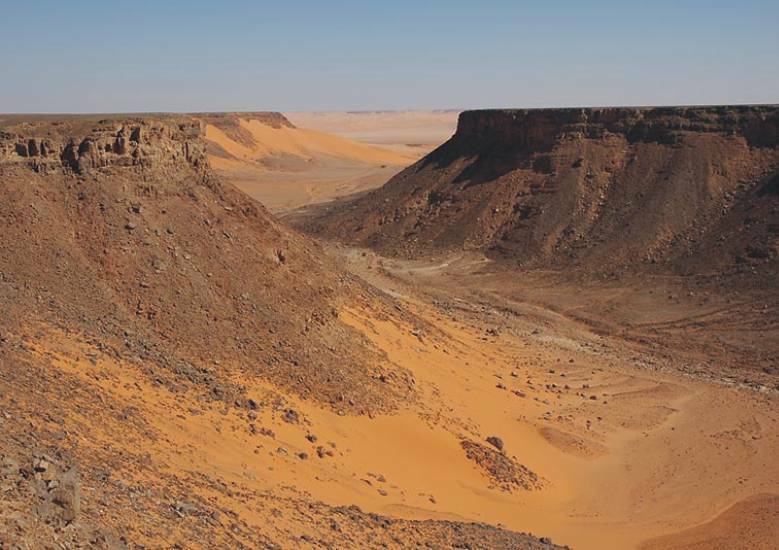 The entire sequence is part of a between 2000 and 3000 meters uplifted structure on the eastern edge of the Kufra basin, which extends up to Libya and southern Sudan extends (Howar-Uweinat uplift). 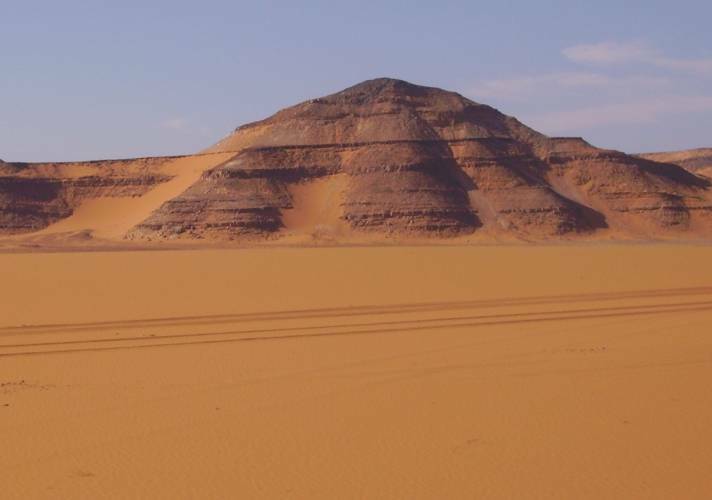 Geomorphologically, the Gilf Kebir can be divided into two parts. 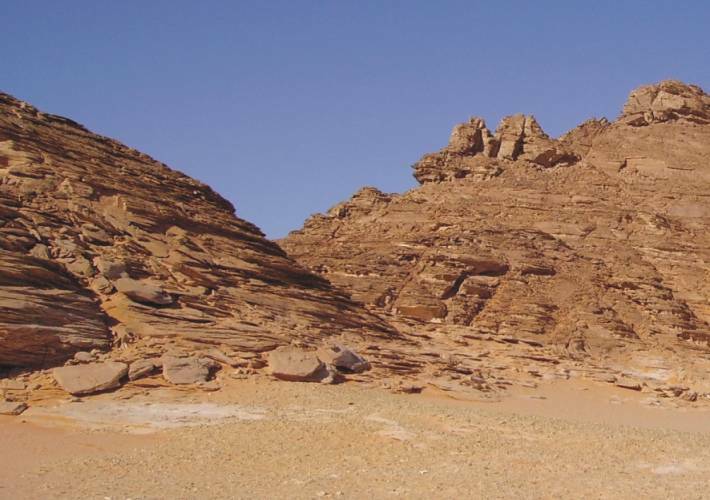 An offshoot of the Great Sand Sea, Wadi Assib (with the passage Aqaba) separates visually a northwestern part (Abdel-Malik plateau) from a southeastern part (Kemal-el-Din plateau). 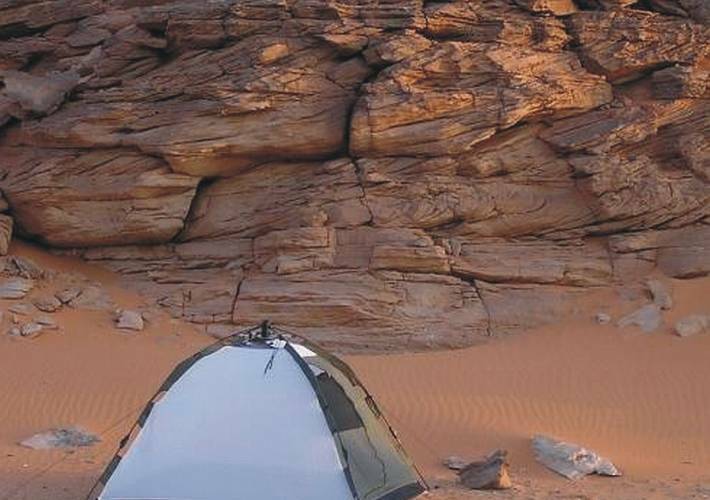 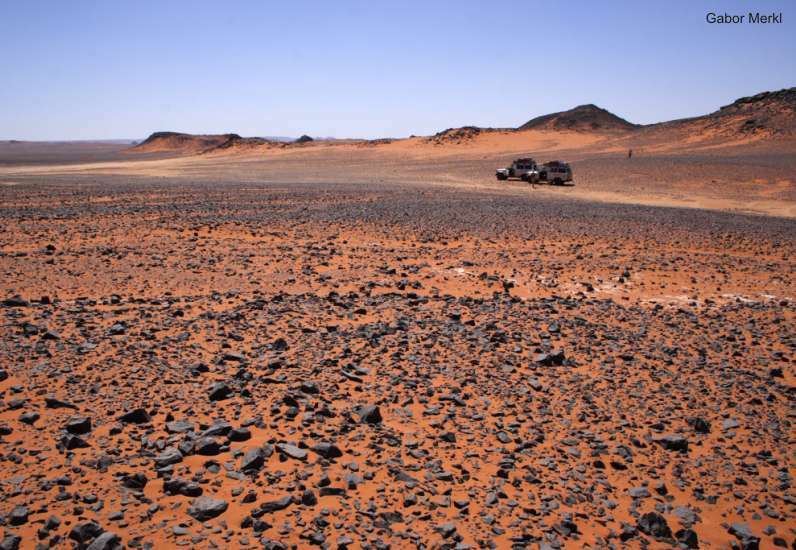 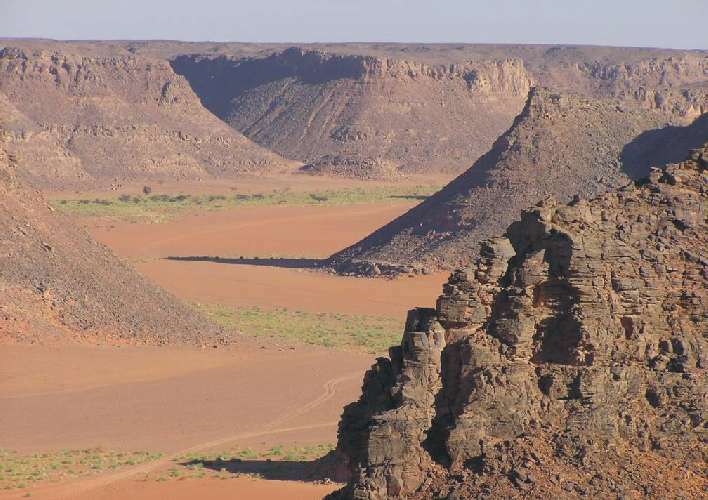 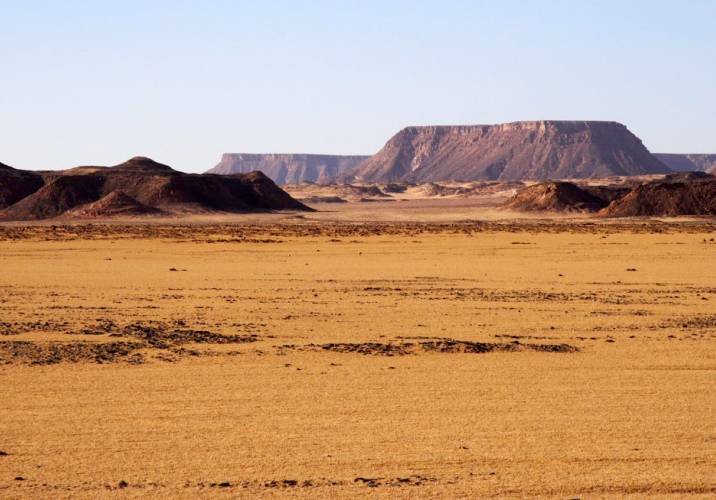 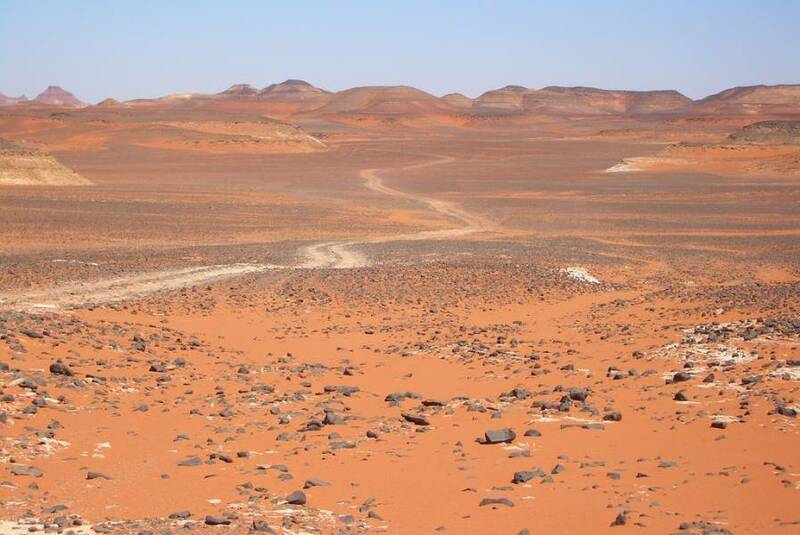 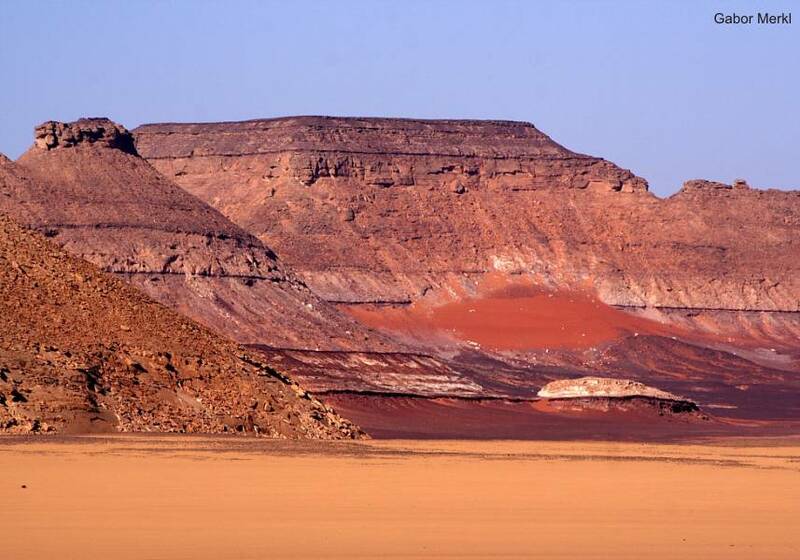 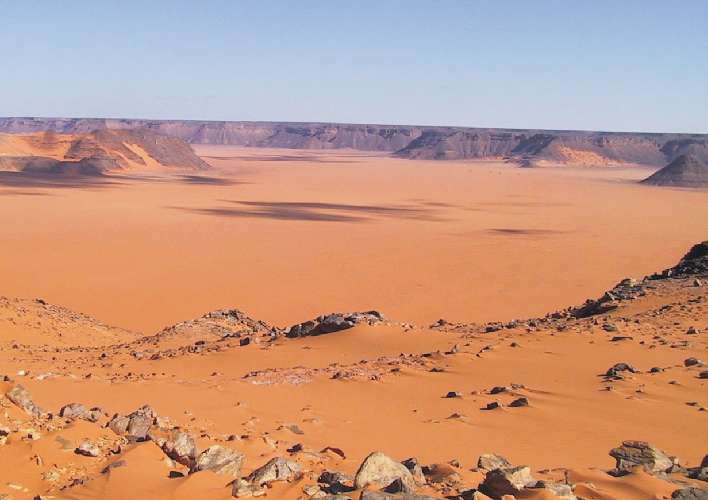 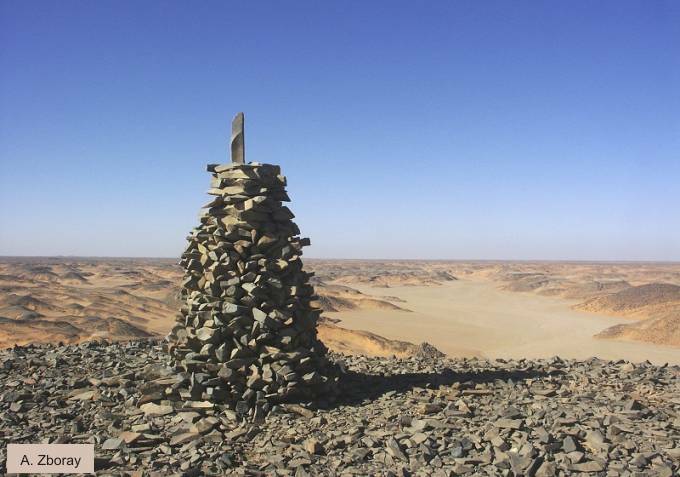 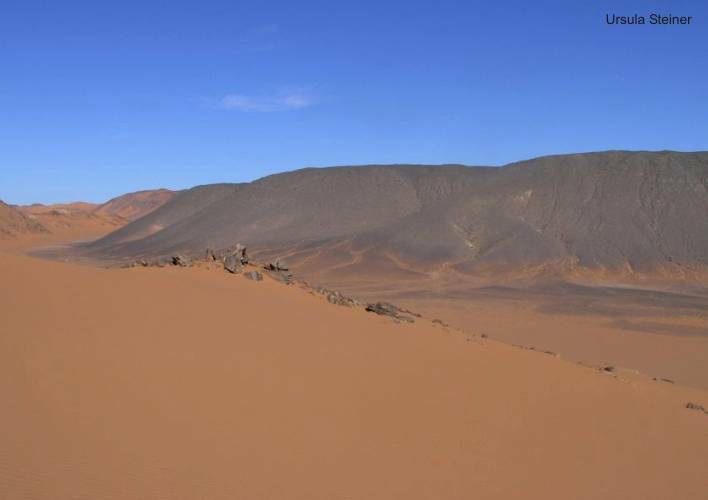 The Abdel-Malik plateau extends over 140 kilometers from north to south and about 40 kilometers from west to east. 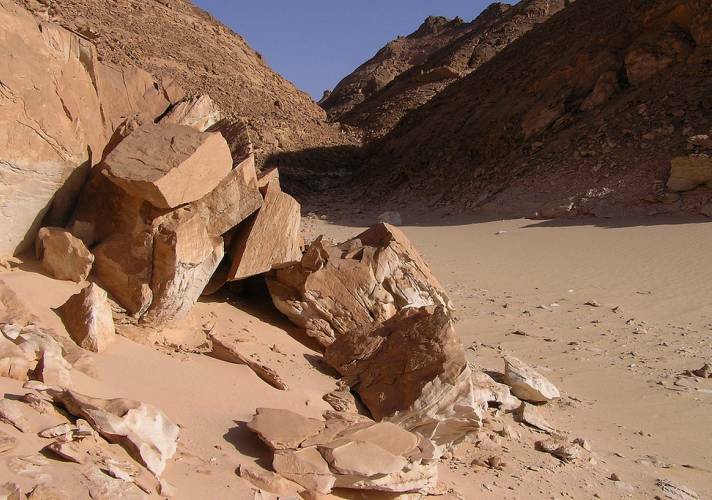 It is cutted by two gigantic wadis, the approximately 100 km long Wadi Abdel Malik and the Wadi Hamra. 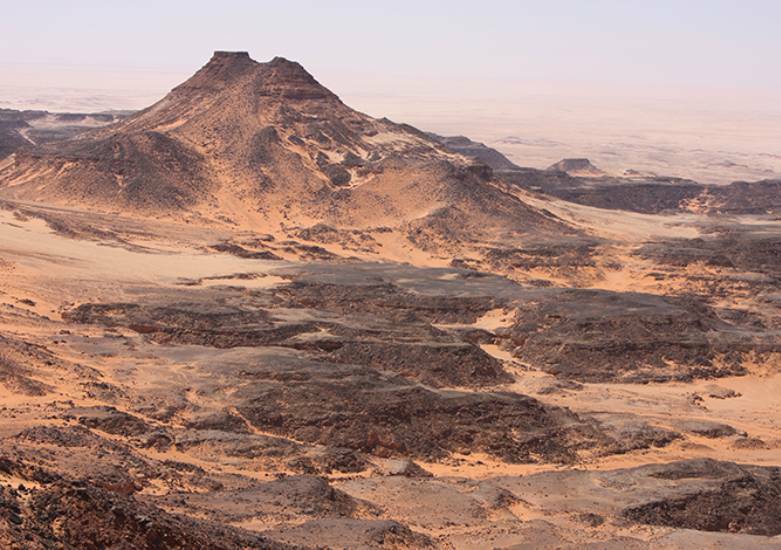 On the southwestern edge of the plateau continues to Libya (Jabal Um Ras, Jabal Rukn and Jabal Asba). 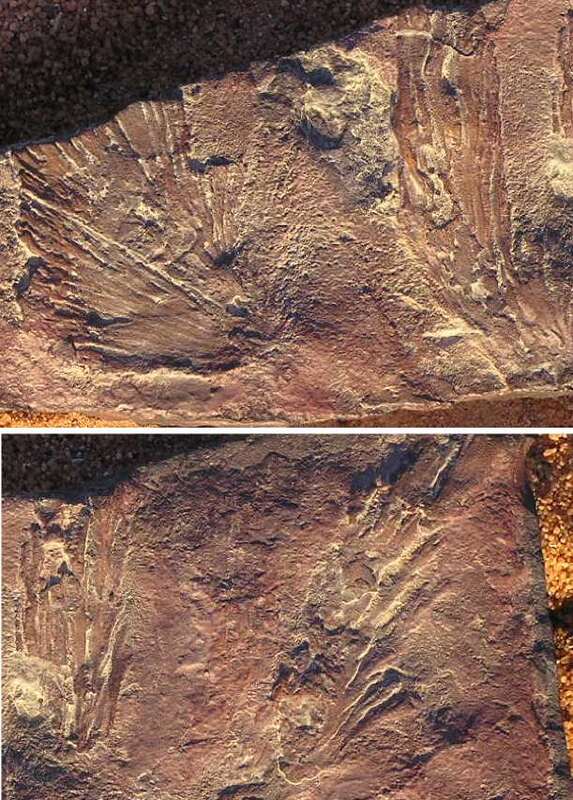 The morphological separation is effected by the Um-Ras passage. 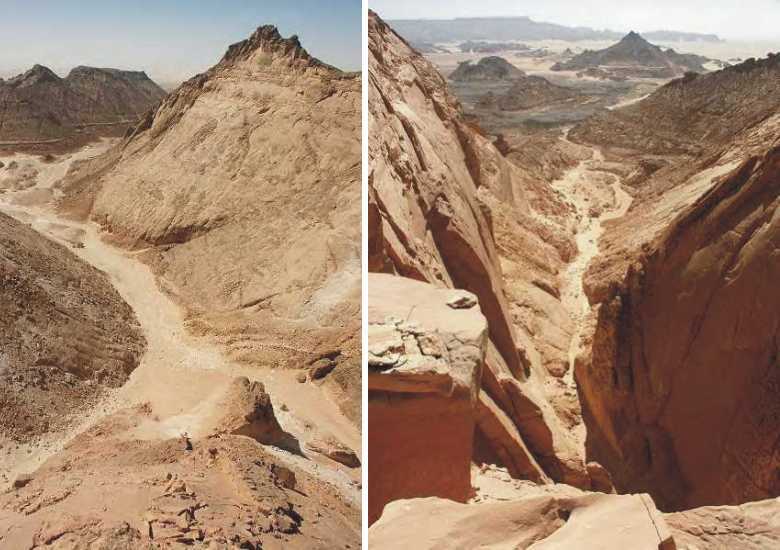 The mountains Um-Ras and Abu-Ras the passage overtop on both sides. 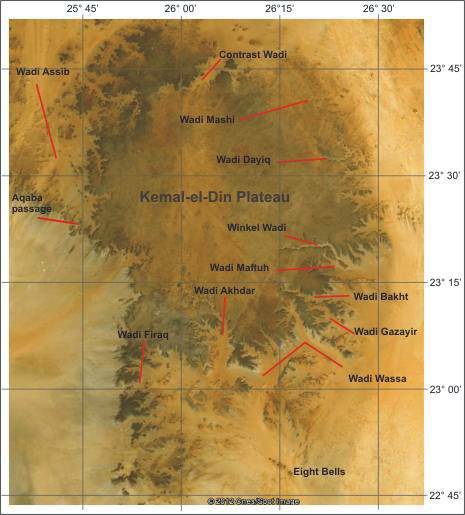 The Kemal-ed-Din plateau extends over 120 km in a north-south direction and 80 km in the east-west direction. 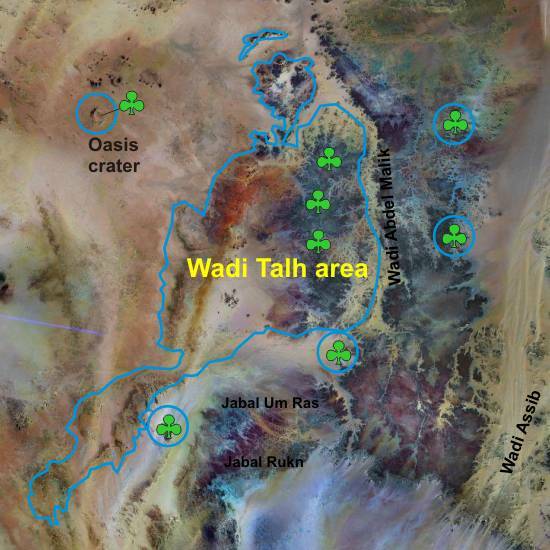 Many wadis cuts its east and south sides. 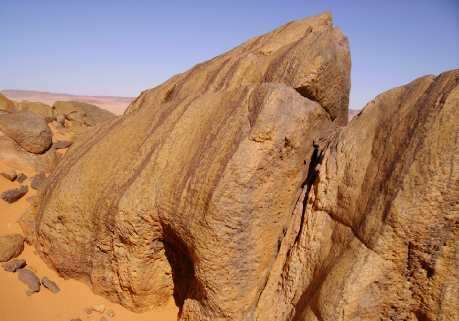 It are from north to south the named Wadi Mashi, Dayiq Wadi, Wadi Maftuh, Wadi Bakht, Gazayir Wadi, Wadi Wassa, Wadi Akhdar, Wadi Firaq. 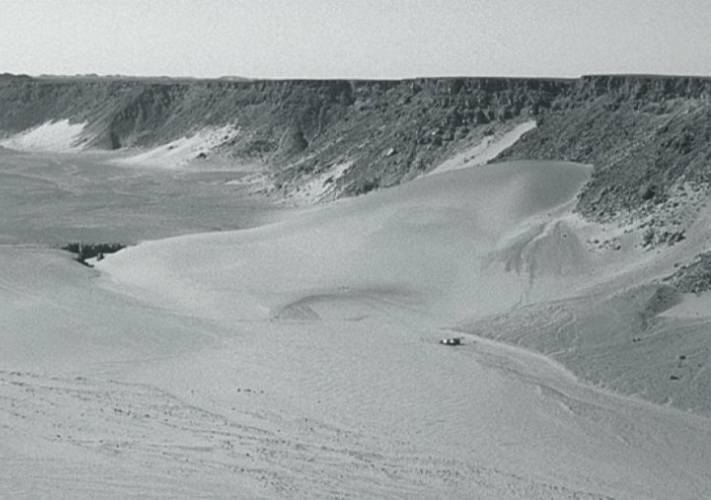 The geographical exploration of the Gilf Kebir began in the 30s of the last century. 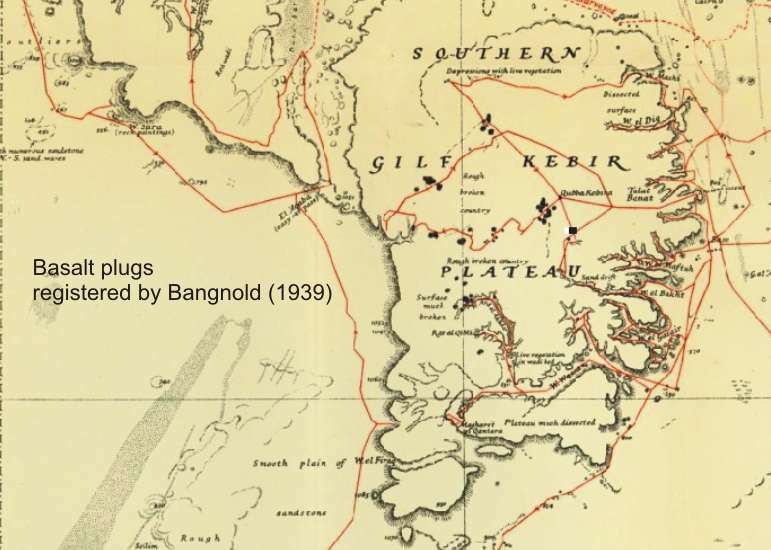 This were the Hungarian Laszlo Almasy and the four Englishman Sir Robert Clayton East, Penderel, Patrick Clayton and Ralph Bangnold. 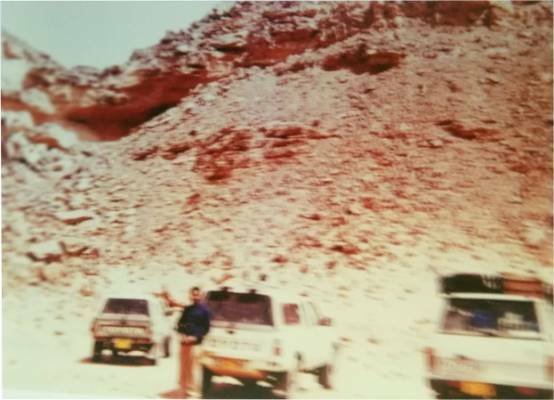 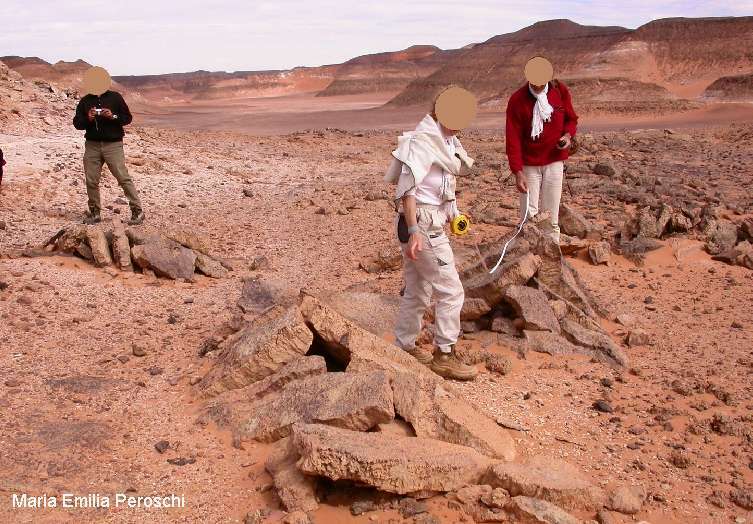 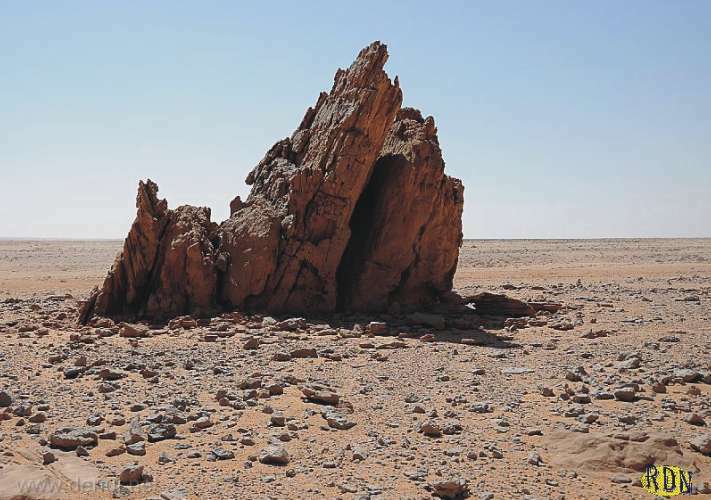 Despite some meritorious German-French attempts in the 70s and 80s of the last century to decrypt the previously unknown geological structure of the Gilf Kebir (Klitzsch, Lejal-Nicol, Wycisk), there is still no conclusive answers. 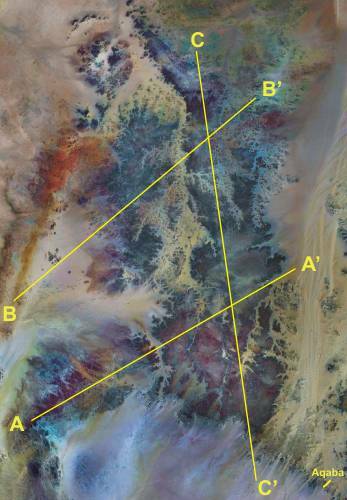 So could be the official geological map of the Gilf Kebir false. 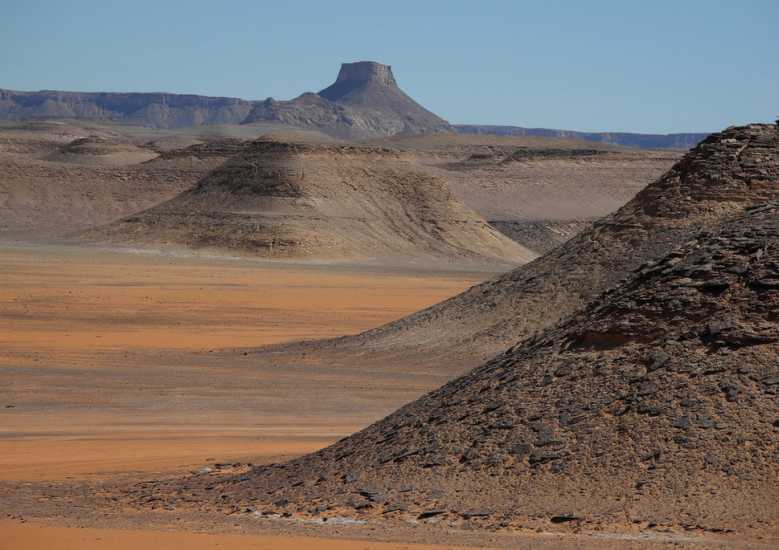 By new finds of plants imprints of the Carboniferous period at the edges of the Gilf Kebir are the postulated Cretaceous sediments within both plateaus put into question. 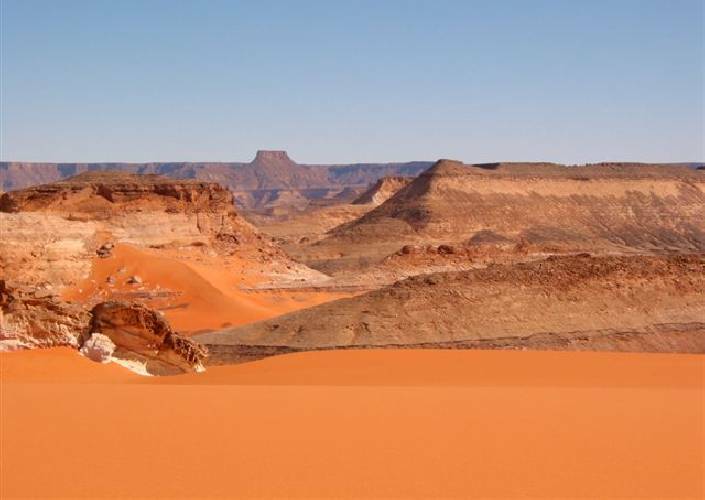 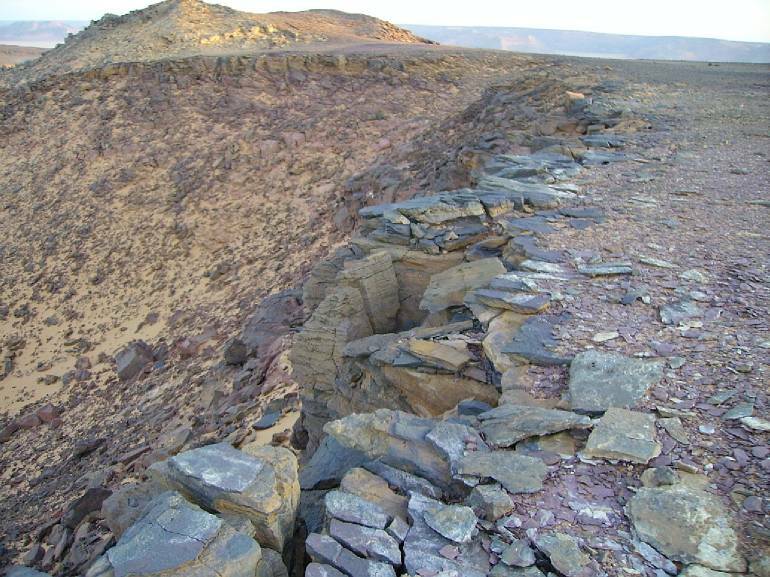 The Abdel-Malik Plateau is complicated structured and geologically difficult to decode. 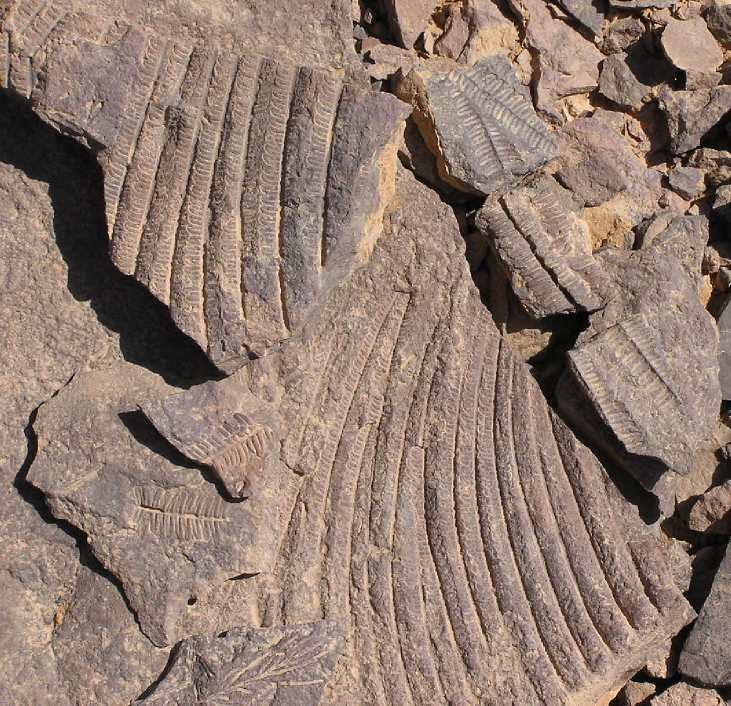 A special feature are marine Carboniferous deposits with plants imprints, which are widely spread in the so-called Wadi Talh, and probably above a heavily eroded relief of older Paleozoic sandstones lie. 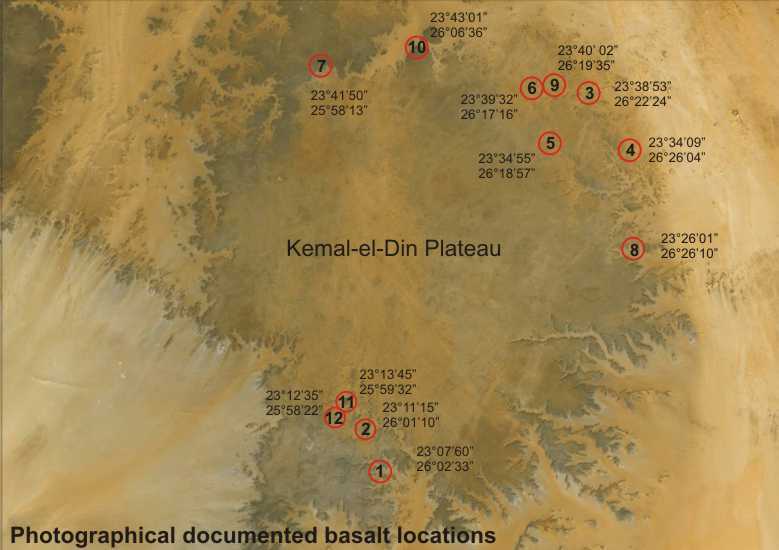 The Kemal-el-Din Plateau has a simple structure, but has a subvolcanic overprint that also spread is in the surrounding ranges (eg Clayton Craters and Gilf Kebir Crater Field). 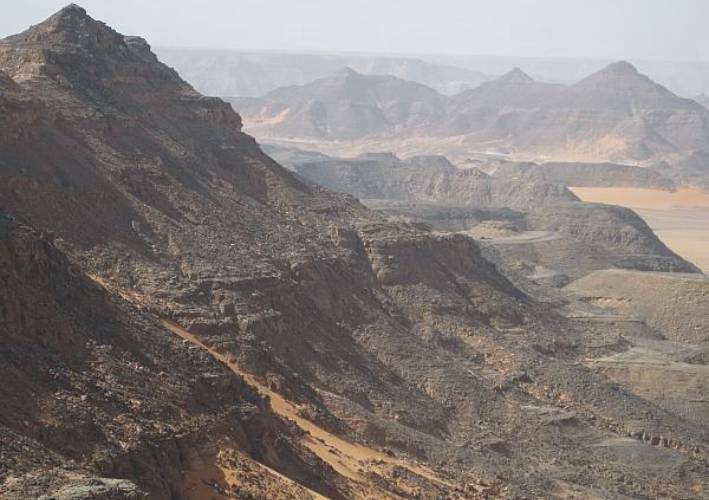 In the Abdel-Malik plateau, of about 100 km in length, an eponymous Wadi separates two different structural-geological units. 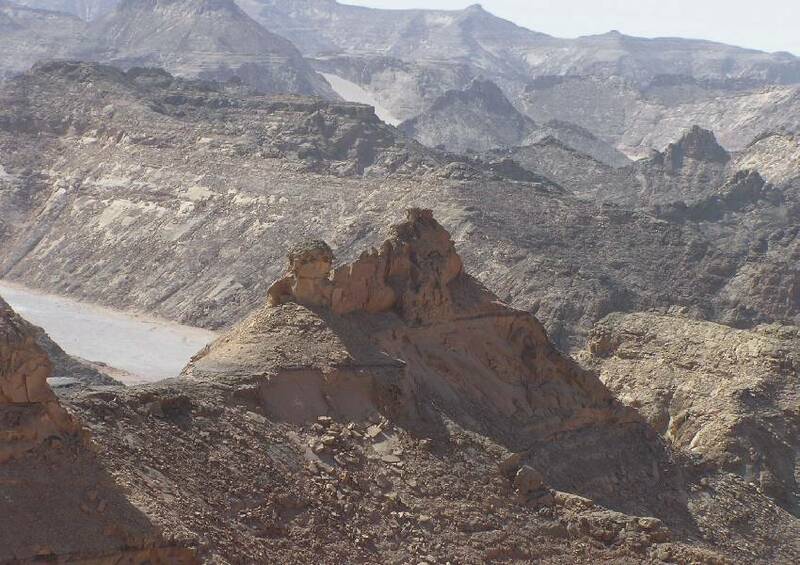 The western part, the so-called Wadi Talh area, is dominated by shallow marine Carboniferous deposits (Wadi Malik formation in sense KLITZSCH), which were deposited on a relief of heavily eroded older sediments. 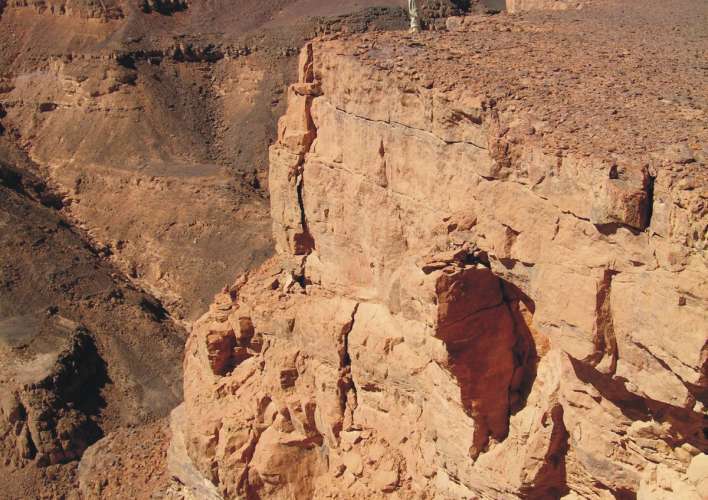 The eroded layers include the time of Devon and Silurian. 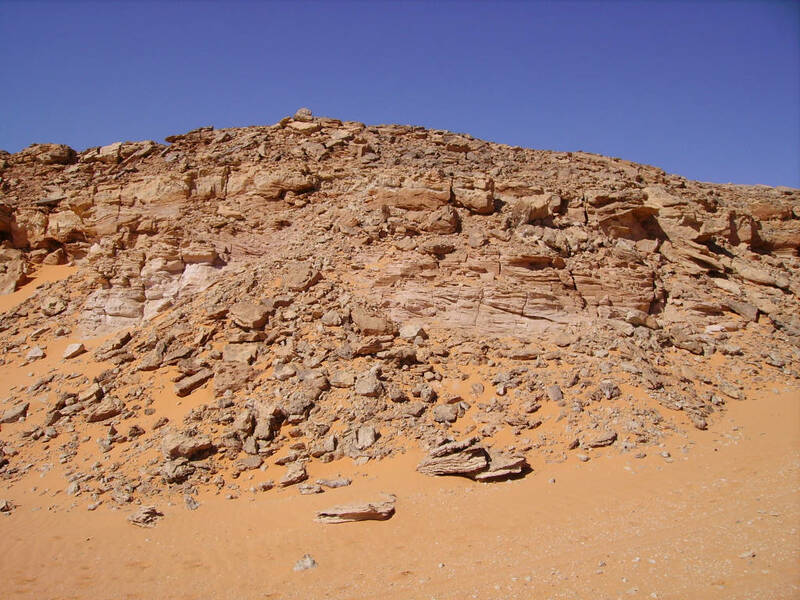 In contrast, the eastern and southern part is by thick, sometimes significantly cross-stratified sandstones dominated, which lie in an unconformity on in varying degrees eroded Ordovician sandstones. 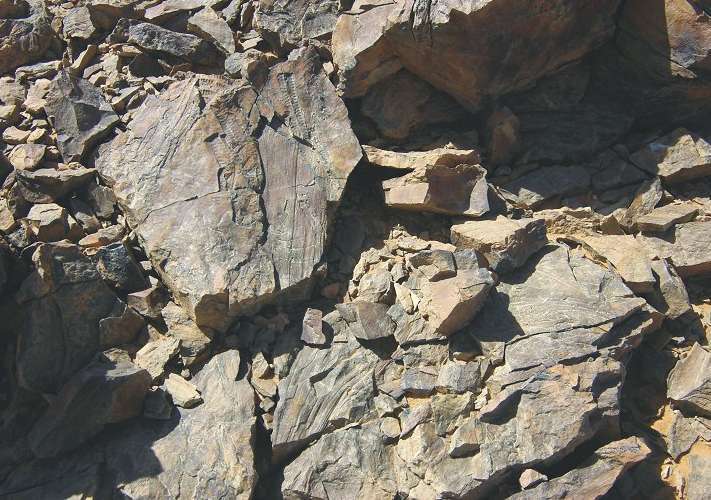 This unit includes deposits of Silurian and Devonian. 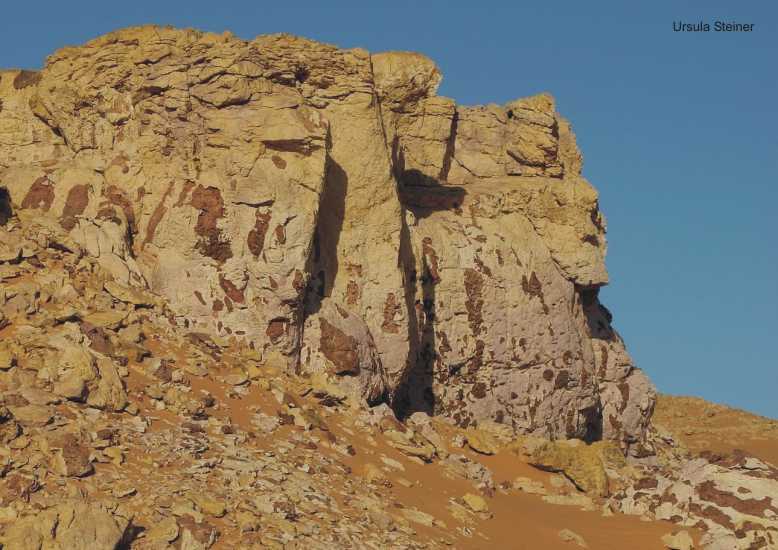 Separated by the Abu Ras passage is this about structural-geological unit to the SW in the Libyan Jabal Um Ras and Jabal Rukn away. 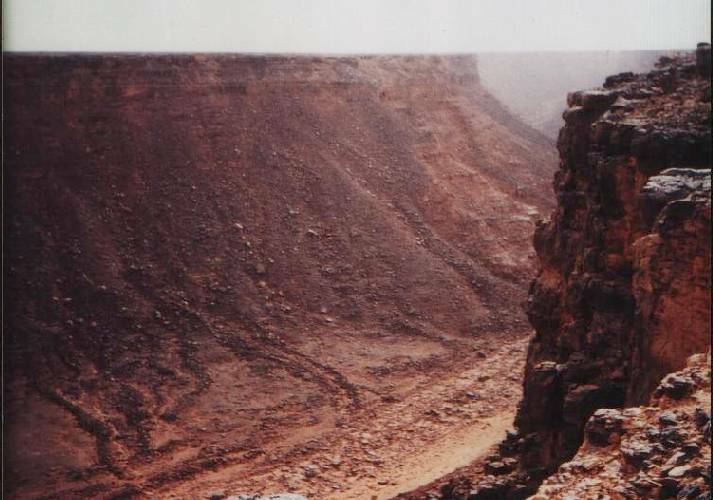 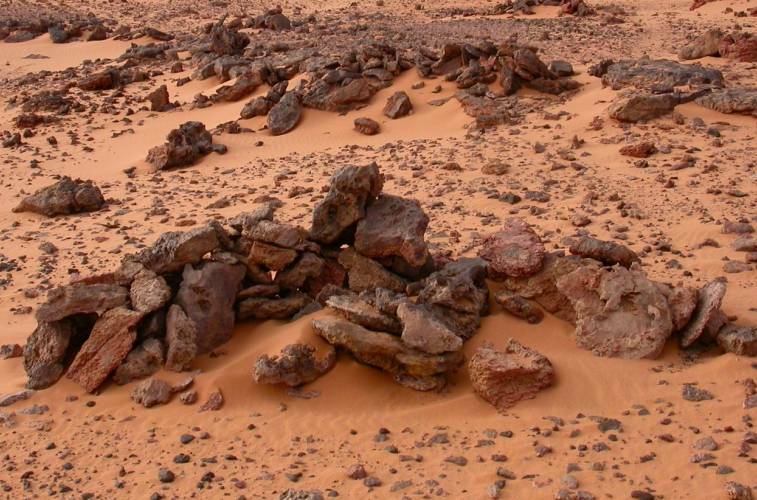 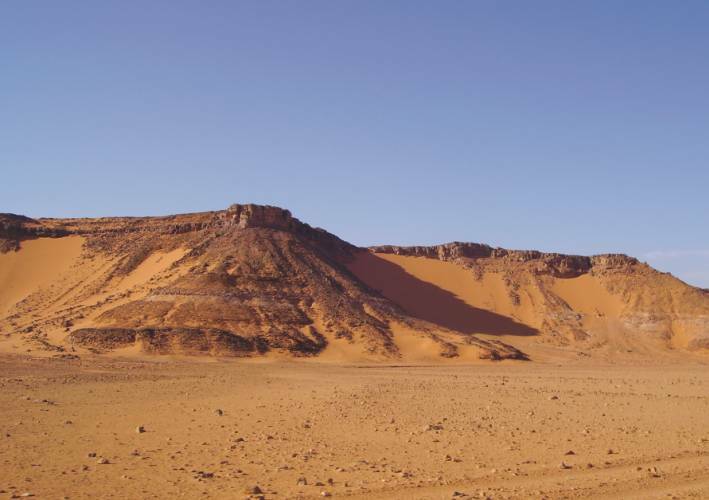 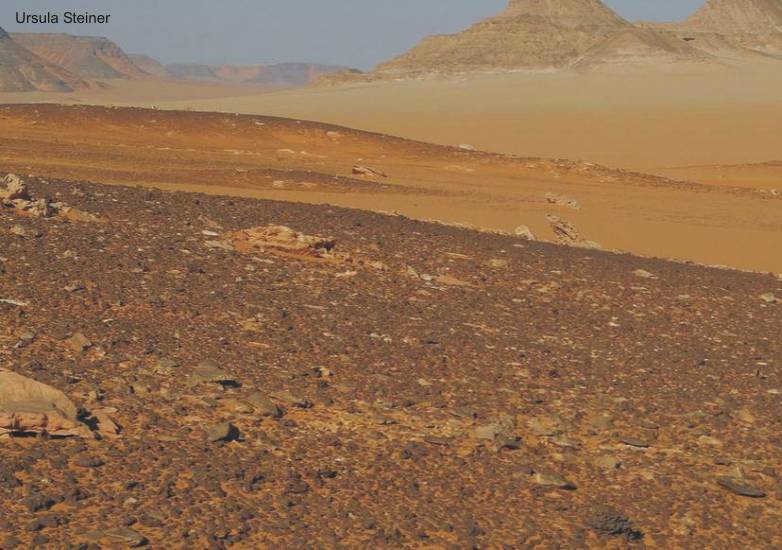 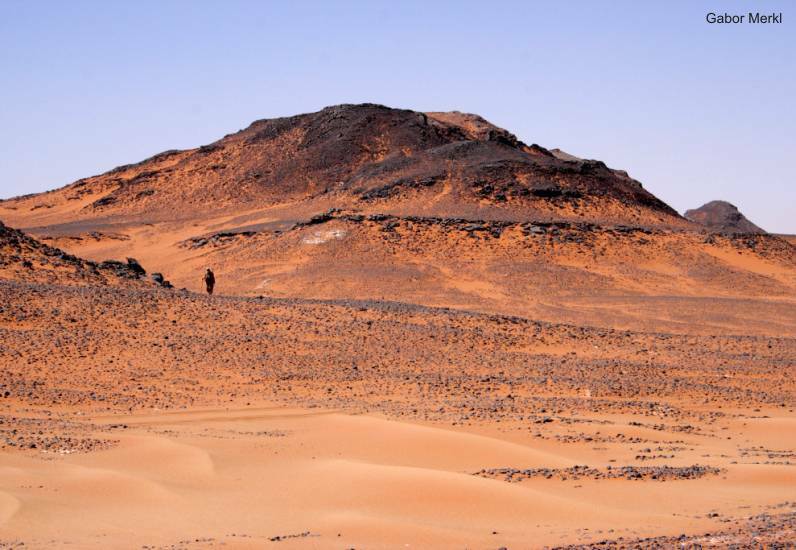 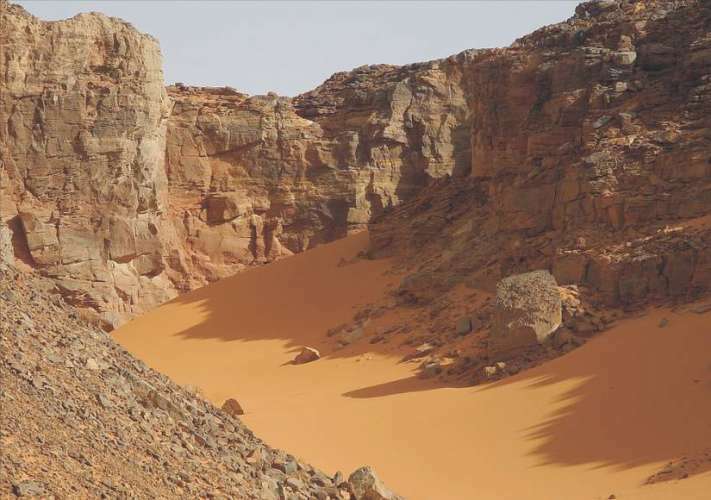 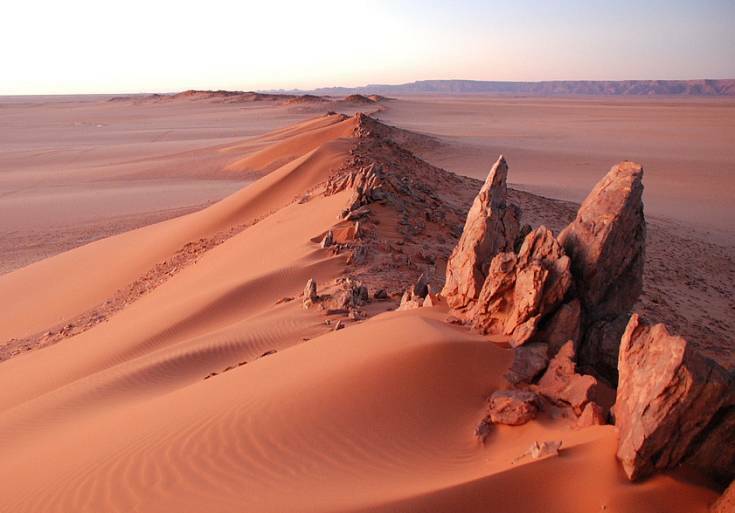 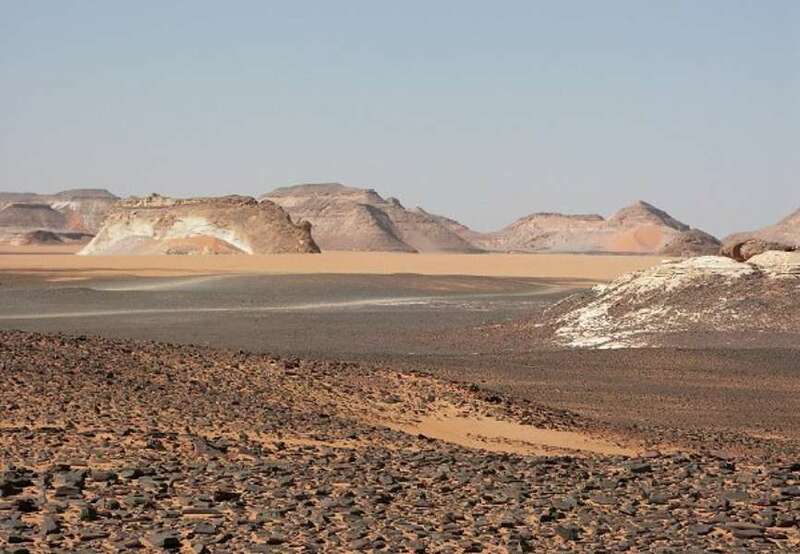 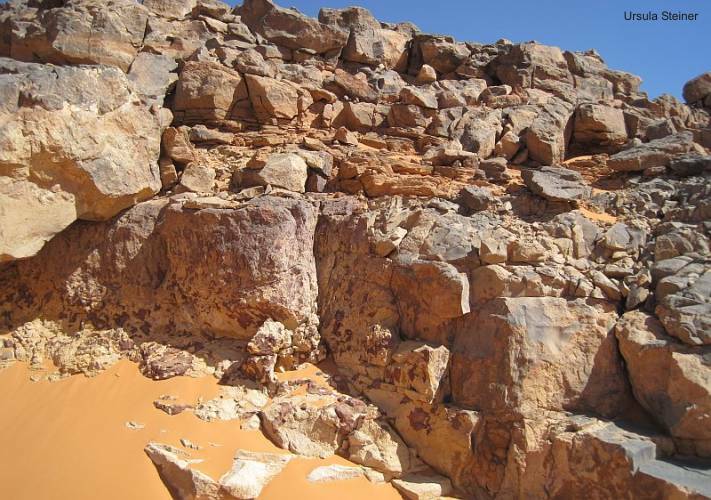 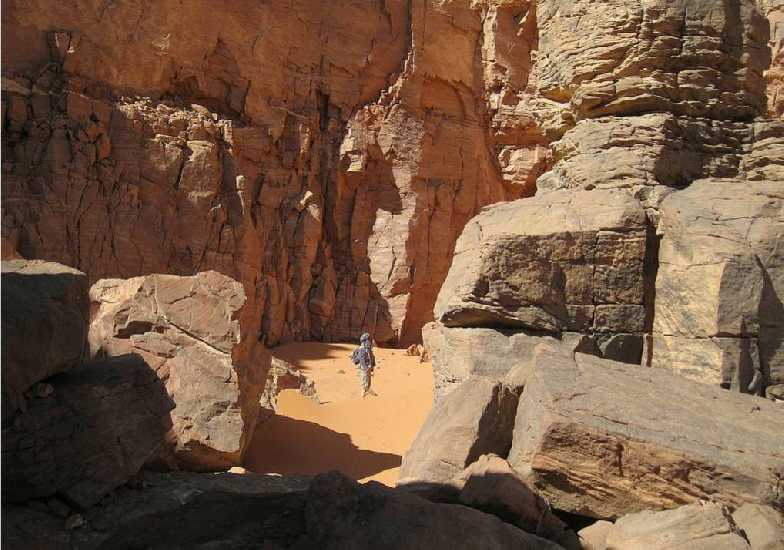 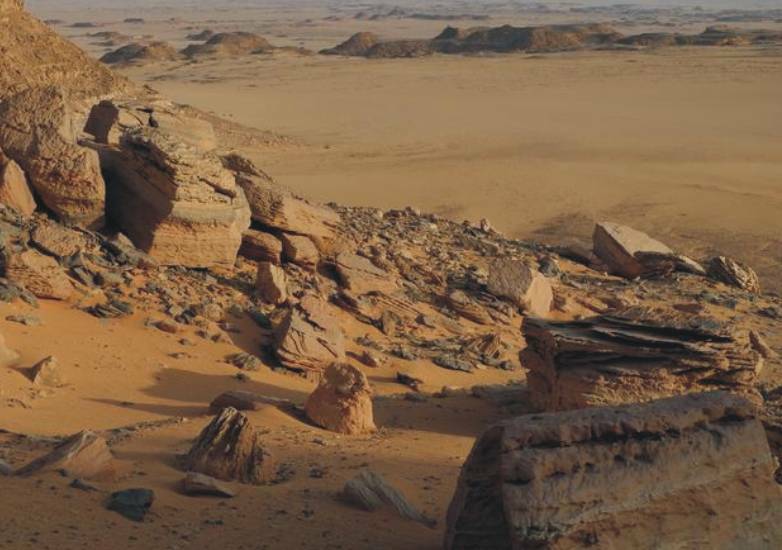 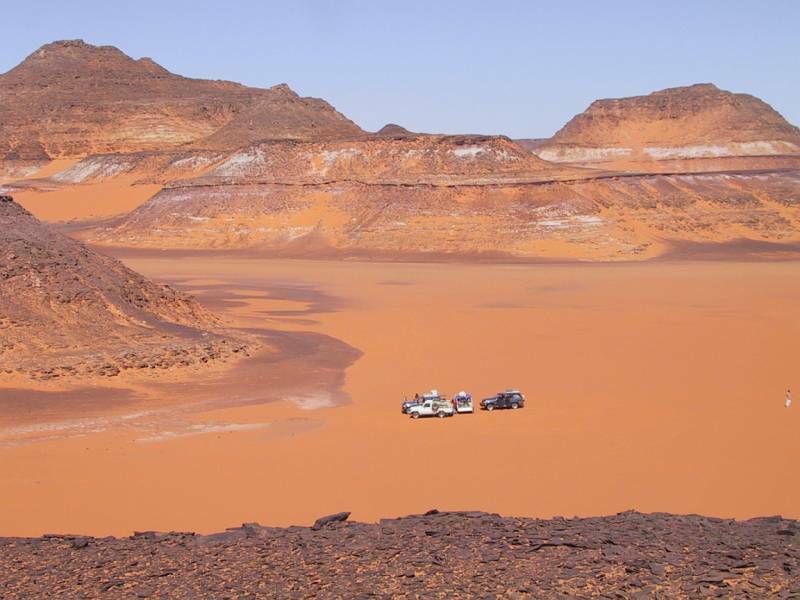 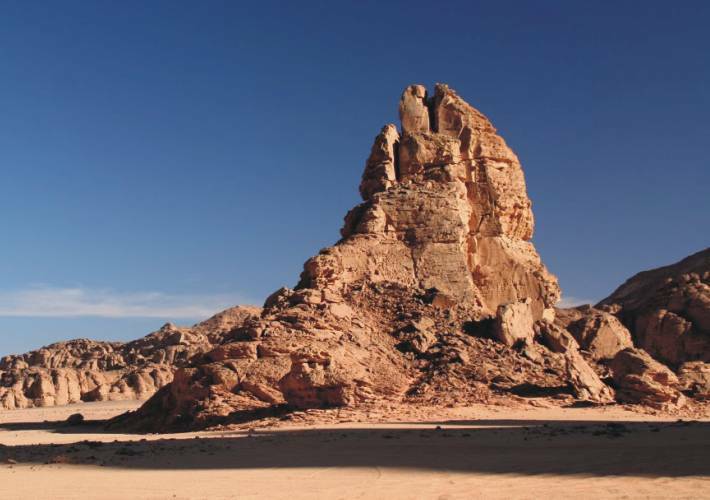 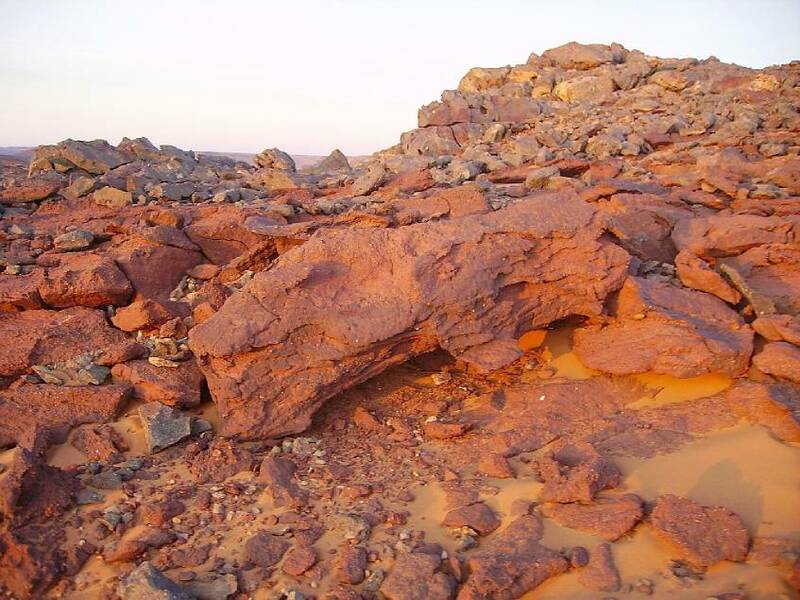 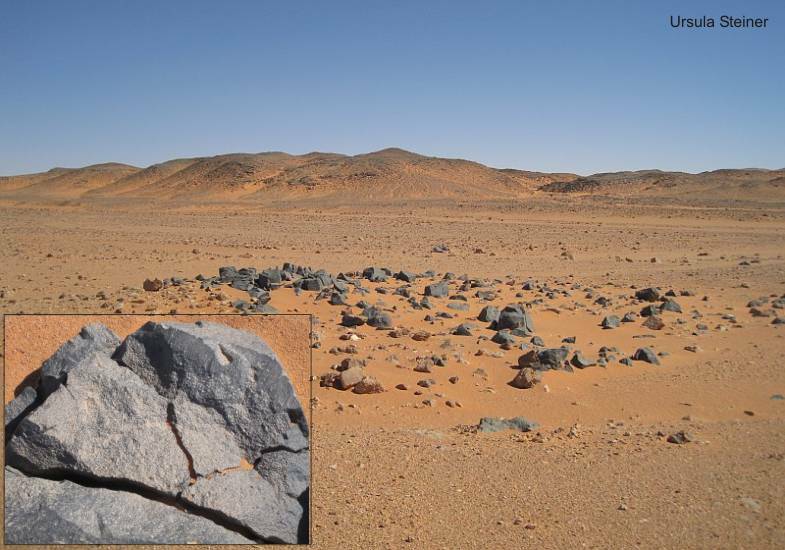 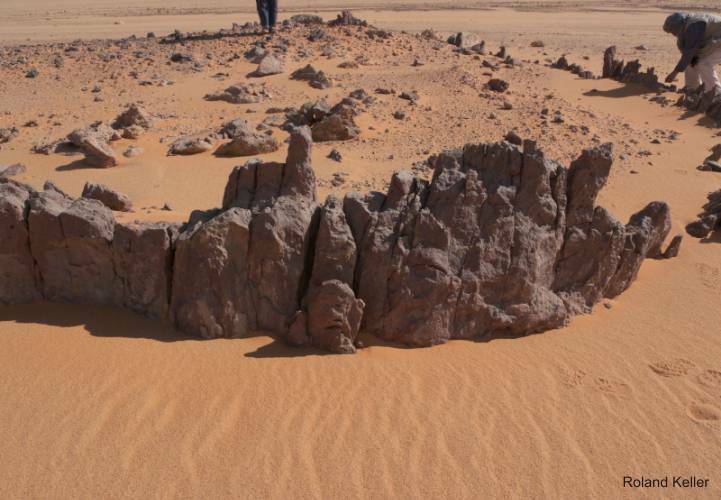 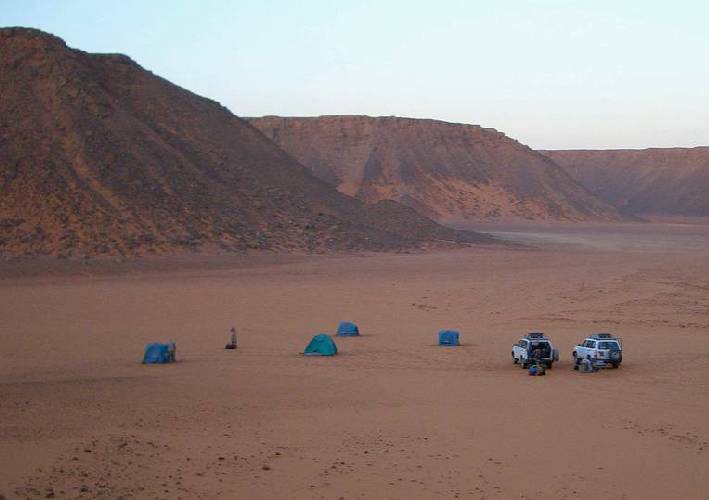 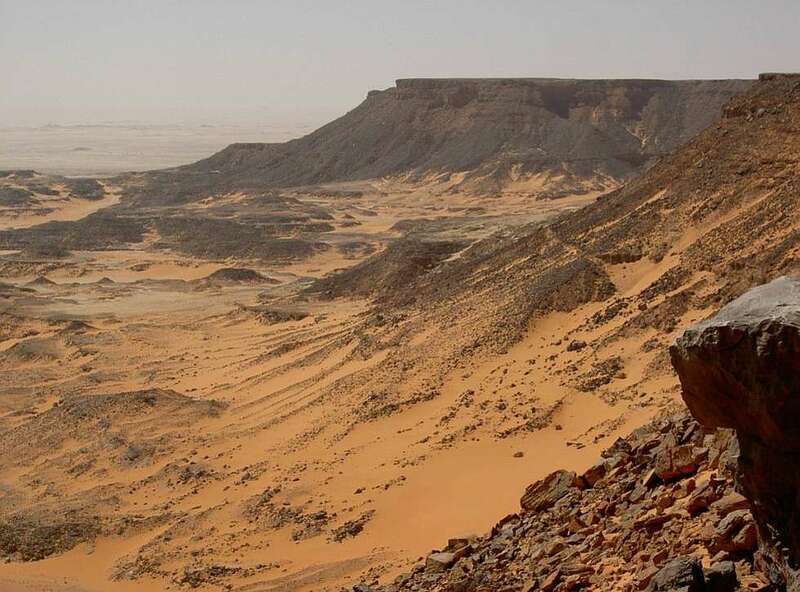 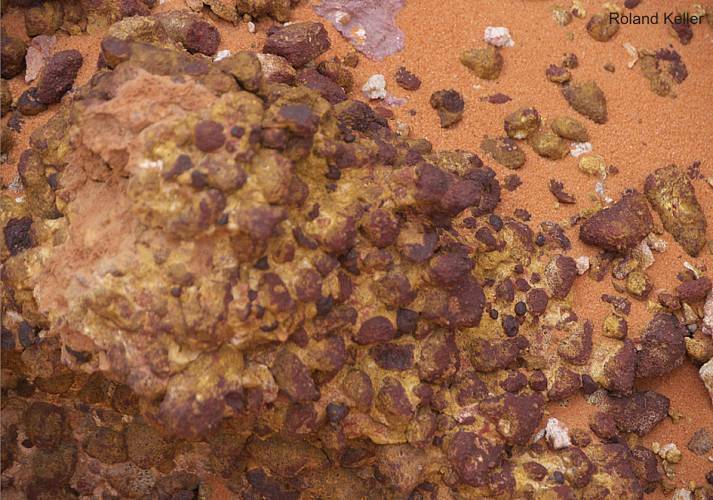 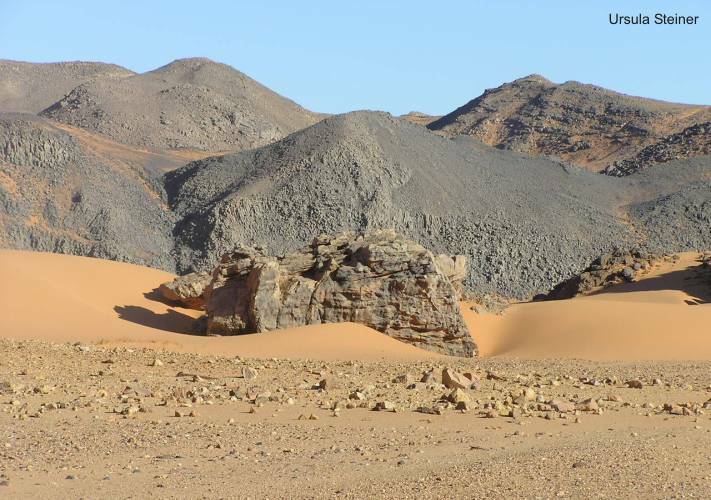 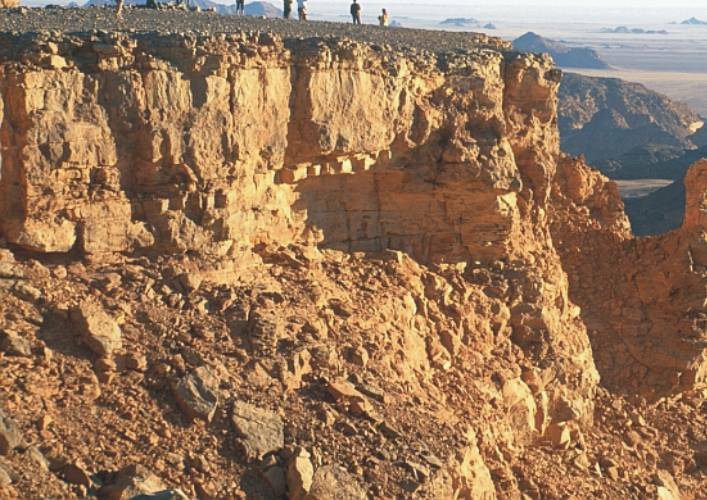 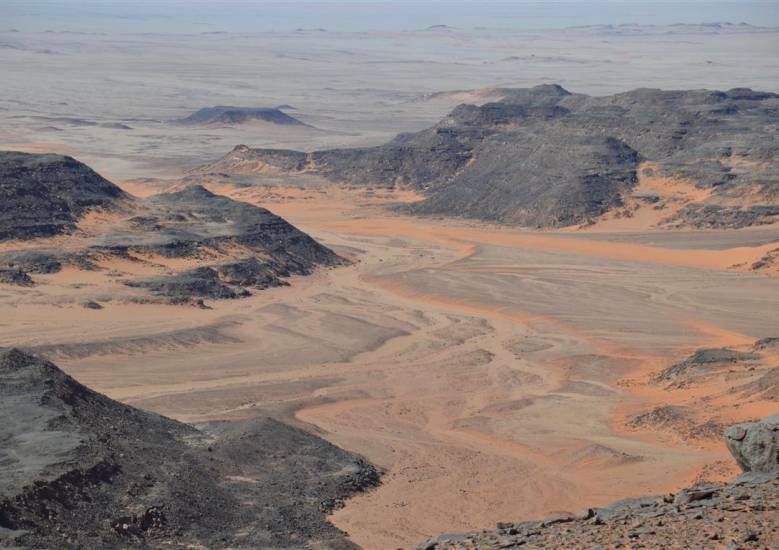 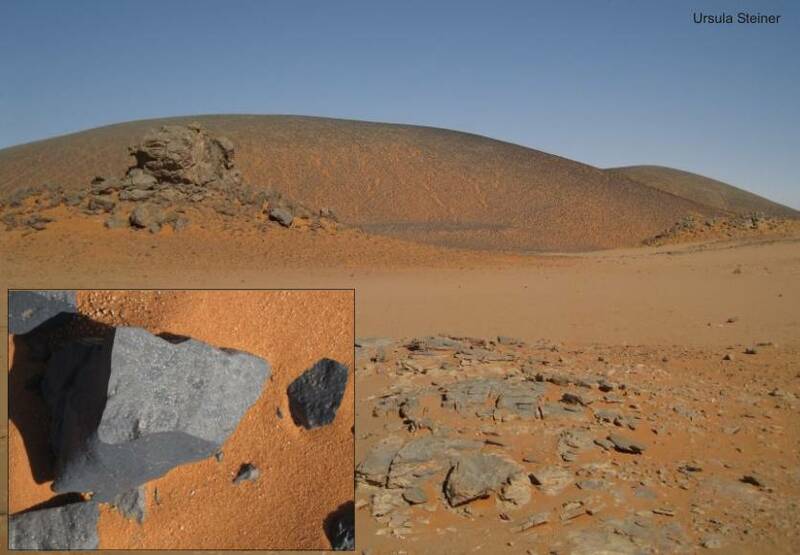 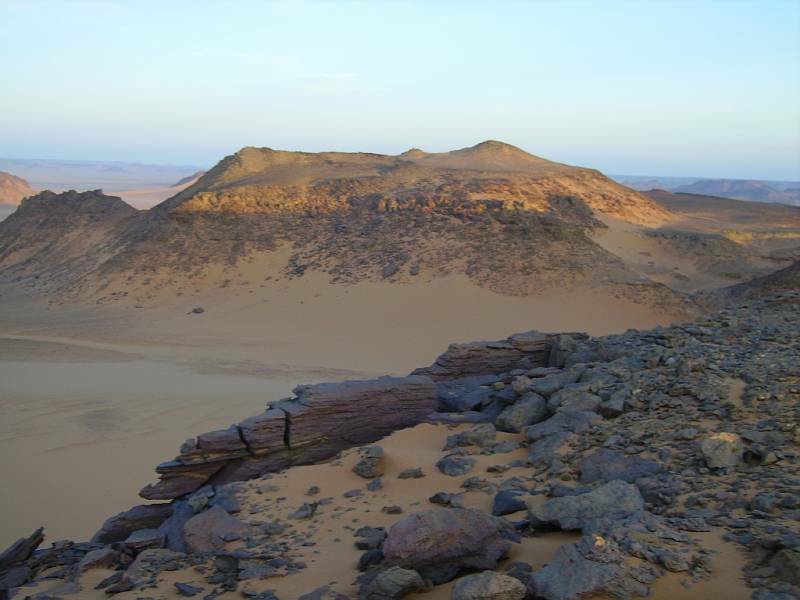 The subsequent Jabal Asba has in its structural-geological development of a special relationship between the Kufra Basin and the Howar-Uweinat Uplift. 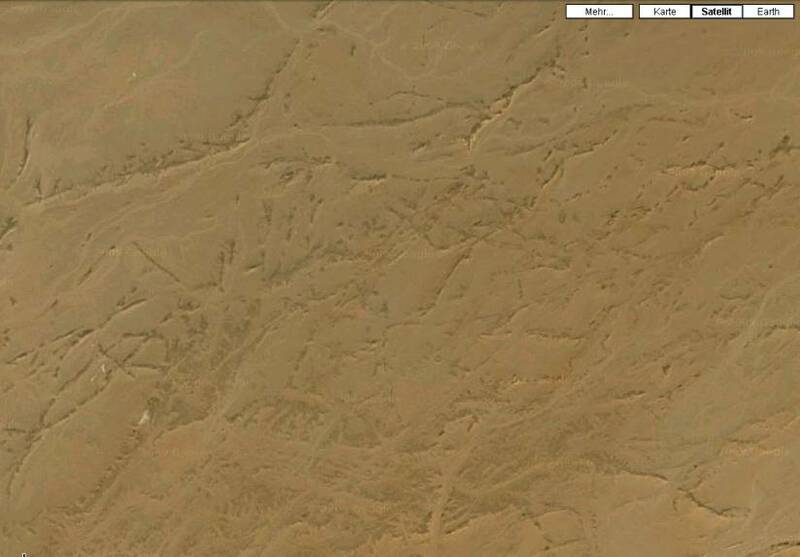 Striking is a much deeper level of the basement. 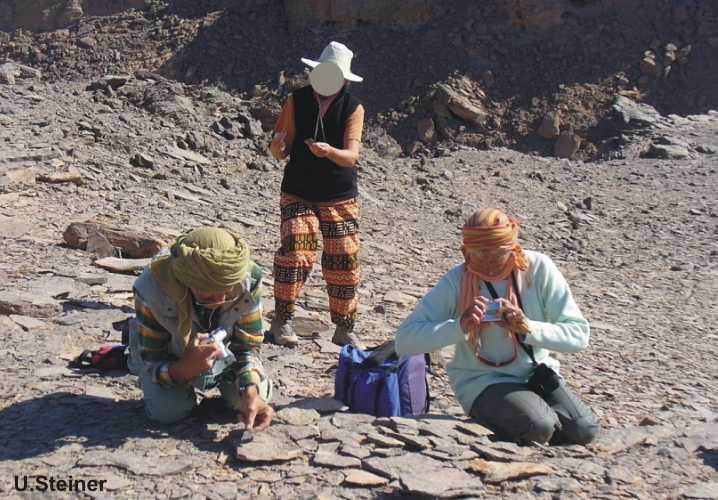 Here are to find also clearly open marine Silurian deposits. 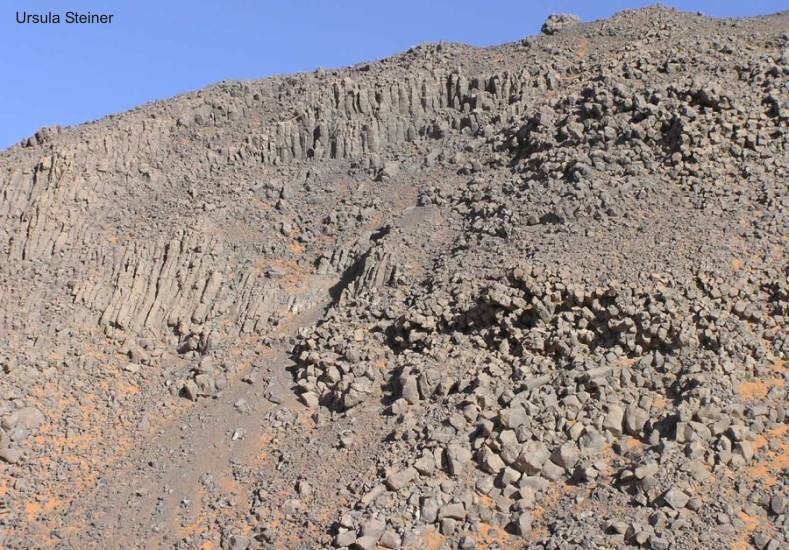 In the Gilf Kebir are this Silurian strata by a fluviale to shallow marine facies replaced. 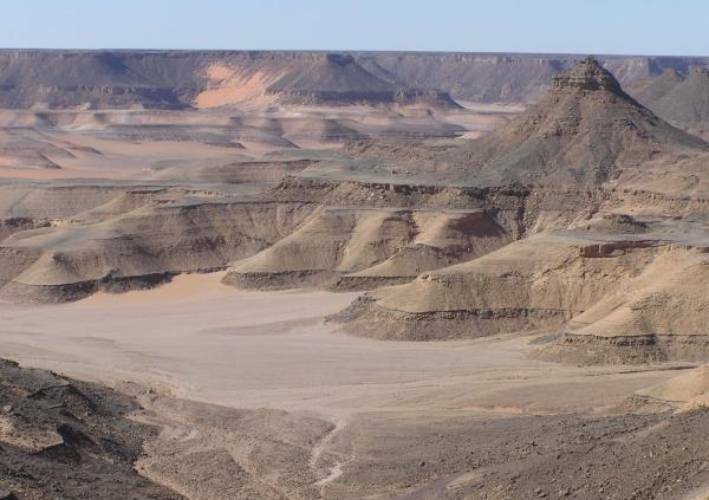 For a temporal allocation of the sediments in the Gilf Kebir, however, are only the Carboniferous strata secured. 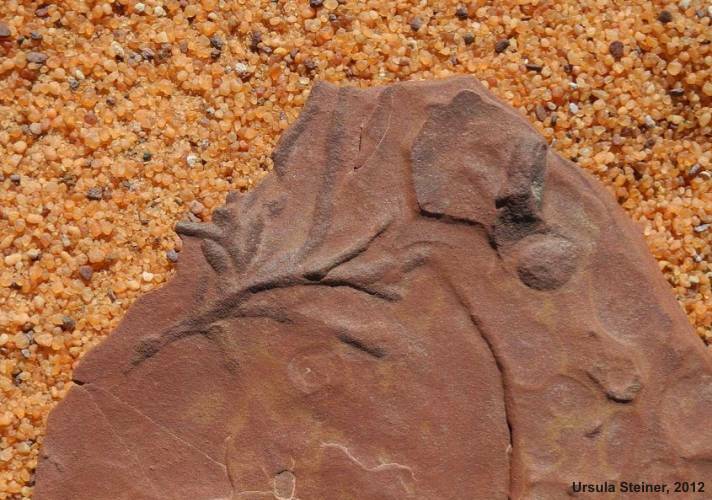 Plants prints and brachiopods are available. 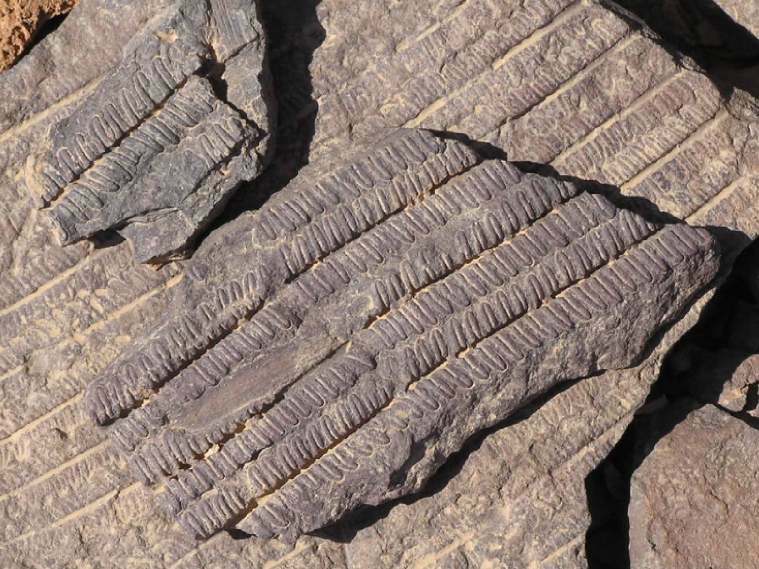 Without fossils it is difficult to distinguish Ordovician, Silurian and Devonian strata. 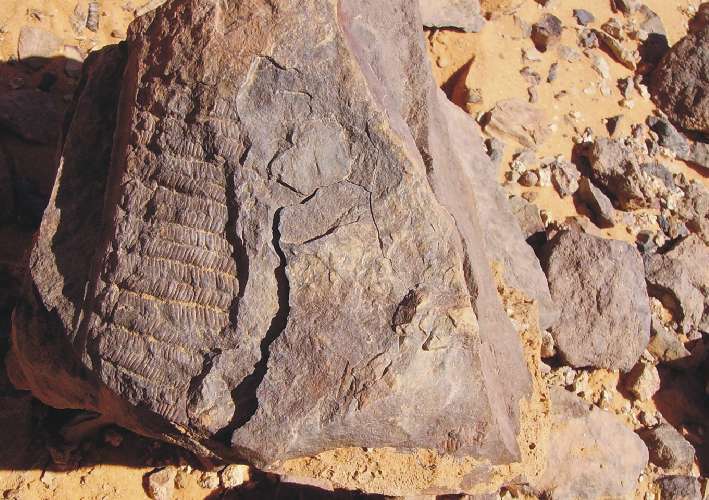 The presence of trace fossils (Scolithos, Cruziana, Arthrophycus or Harlania) in some sequences is not enough. 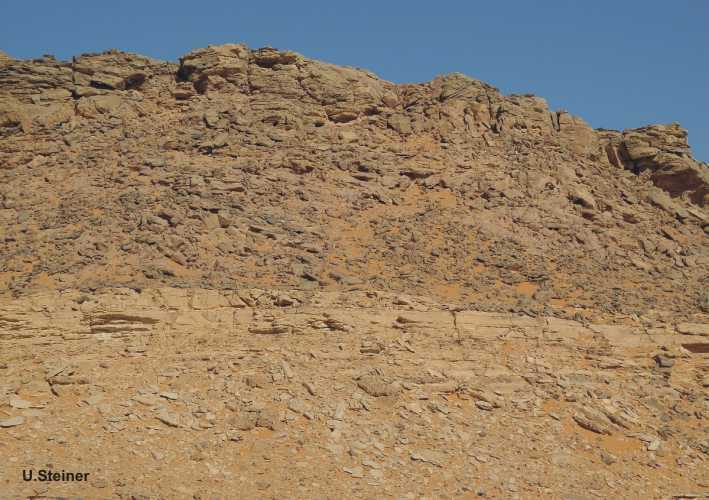 Characteristic, however, is a Paleosol-layer with rich Scolithos in all structures (Gilf Kebir, Jebel Uweinat and Jabal Asba). 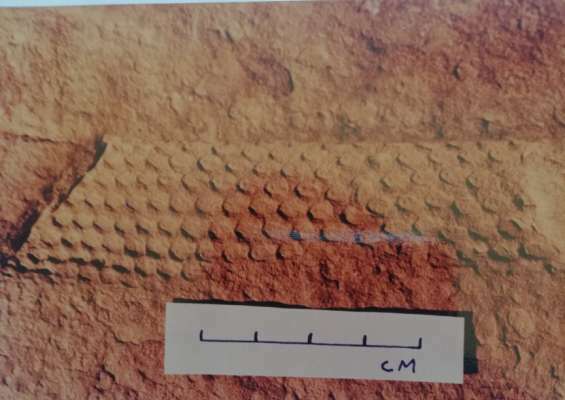 This horizon occur in the upper unit of a series of particularly compact sandstones above the basement, and should be used as a marker horizon between the Ordovician and Silurian. 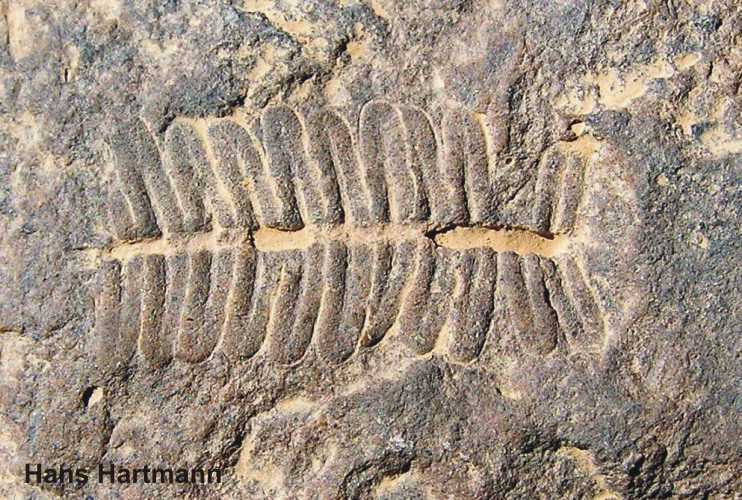 It follow Silurian strata with Arthrophycus and Harlania. 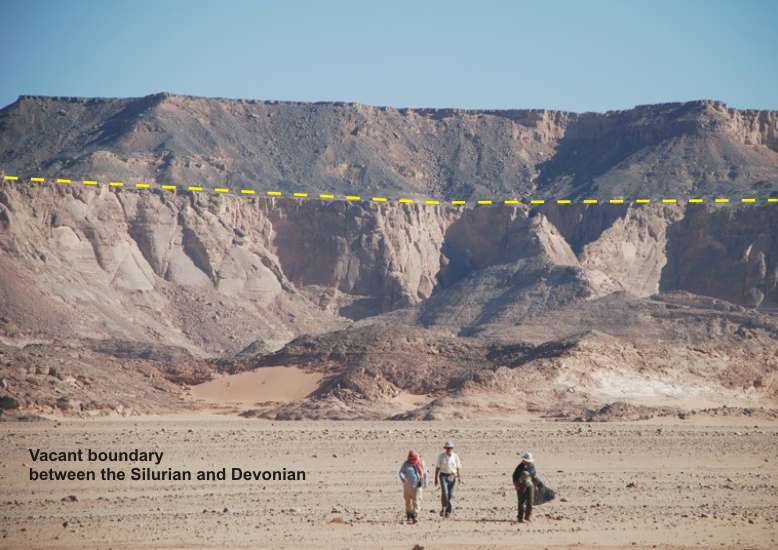 This sequence corresponds to the so-called Um-Ras formation (KLITZSCH), but without the lower part with the Scolithos-layer. 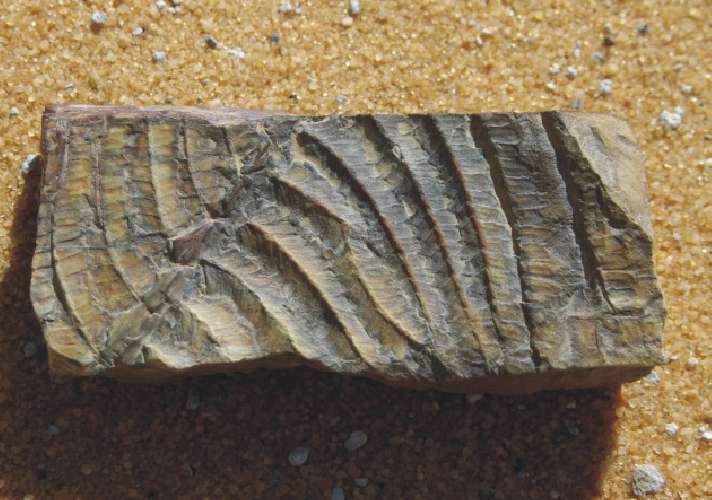 It corresponds to the Ordovician Karkur Talh formation (KLITZSCH) in Jebel Uweinat. 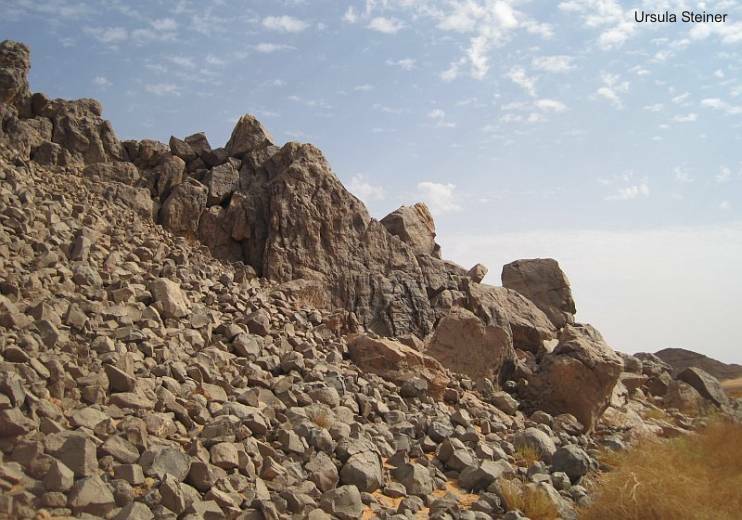 In the official geological map early Cretaceous sediments are widespread in the Gilf Kebir plateau. 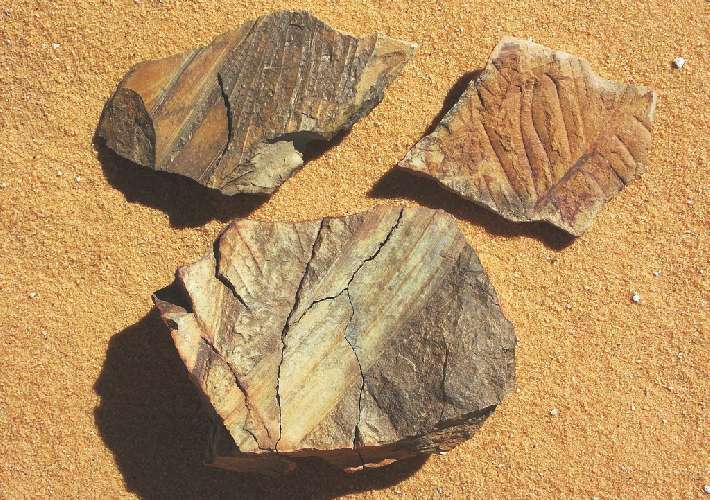 There are, however, no concrete evidence. 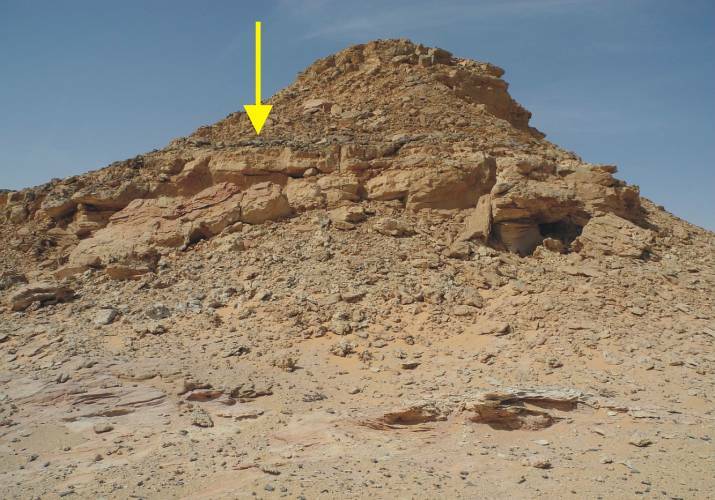 This assumption is probably based on an determination of a few poorly preserved plant imprints, not accurately localized by Anni Lejal-Nicol, in the Aqaba passage and in the northern foothills of the plateau were found.. 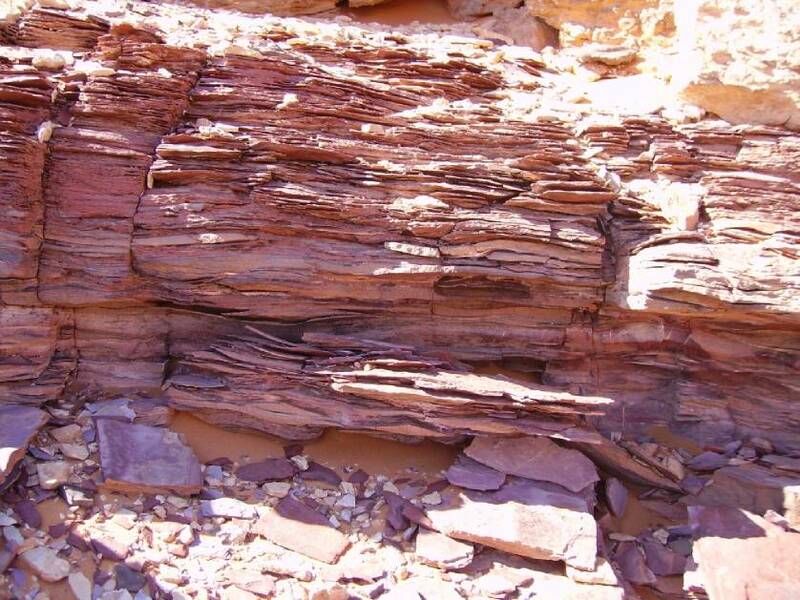 The associated sedimentary sequence is called "Gilf Kebir Formation". 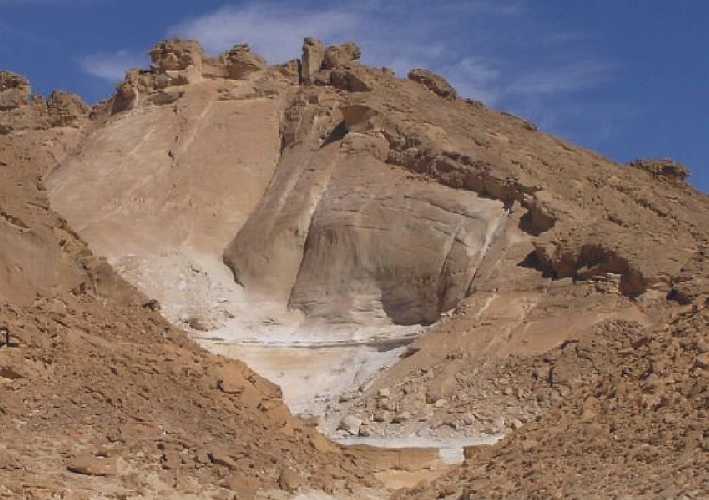 by hydro-volcanic activities during the Oligocene age (Gilf Kebir crater field, Regenfeld pipes, Libyan desert glass etc.). 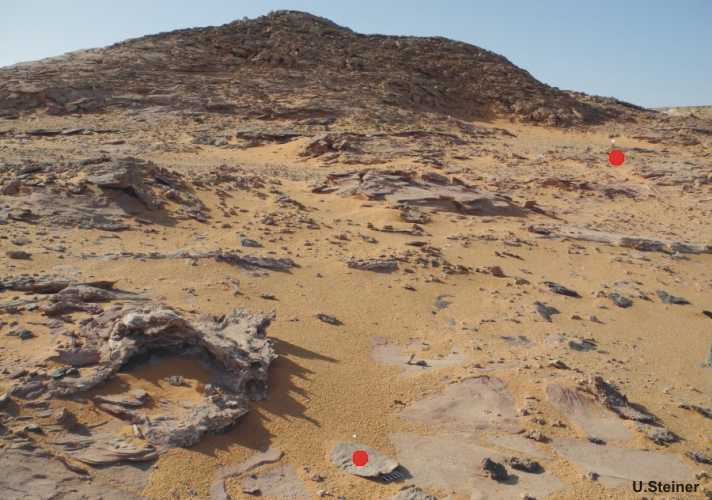 A striking feature is the "Red Spot". 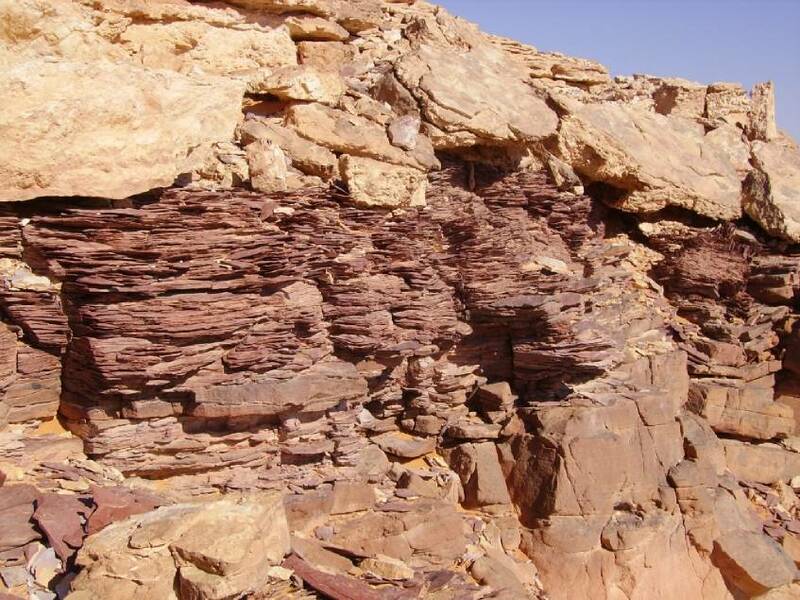 Here are the strata complete impregnated by iron-containing hot solutions. 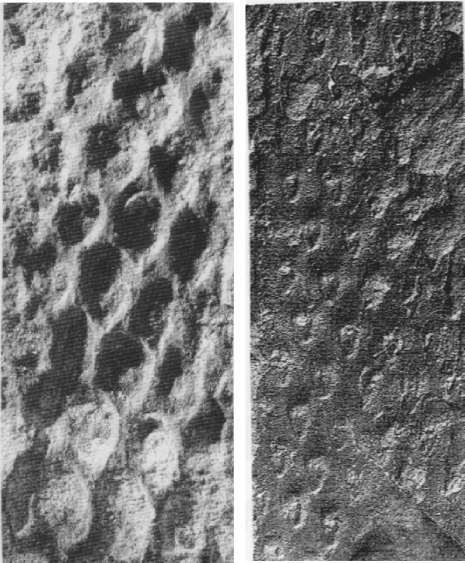 Locally it should be noted that these surfaces are covered with hardened ferruginous sandstone plates or detritus on alluvial plains. 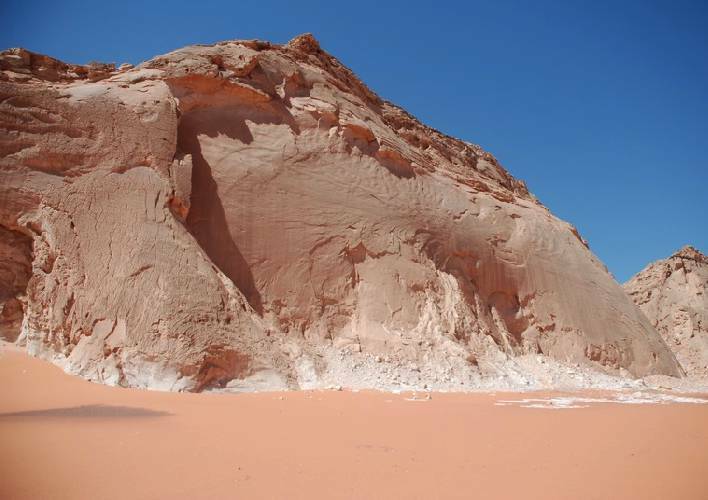 In the geological profiles of the hills and mountains in this region is also to observe a several changes of these red layers with white sandstones. 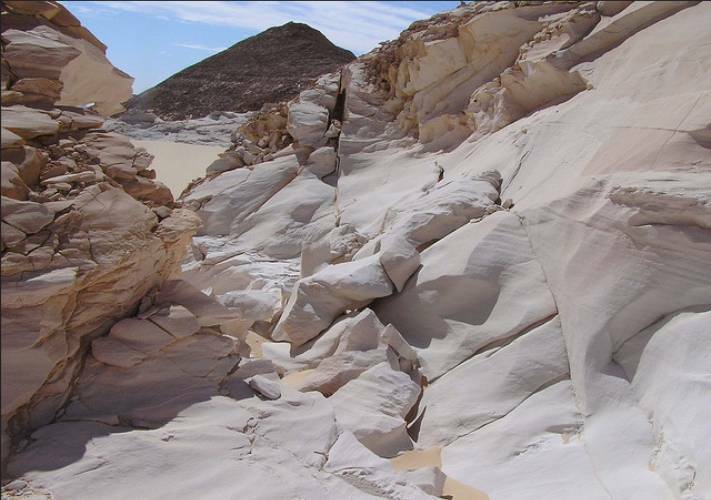 Such a change is not necessarily coupled to the bedding planes in the sediments.White sandstones also occur as clusters which break the stratification. 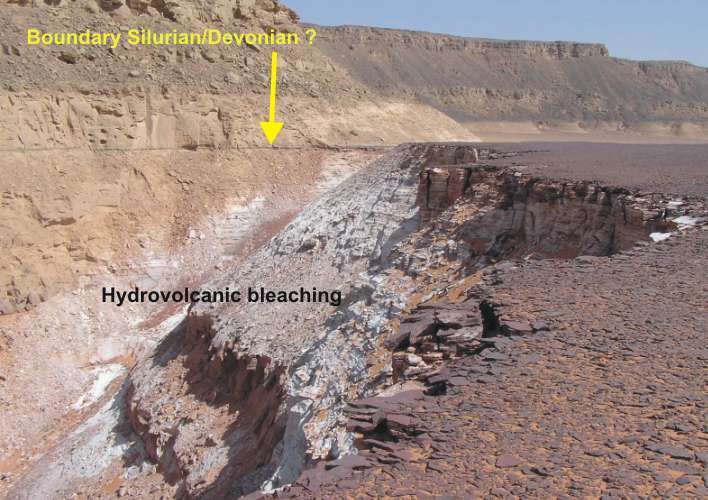 This is a clear indication of the predicted hydrothermal processes that have led to a bleaching of the sandstones. 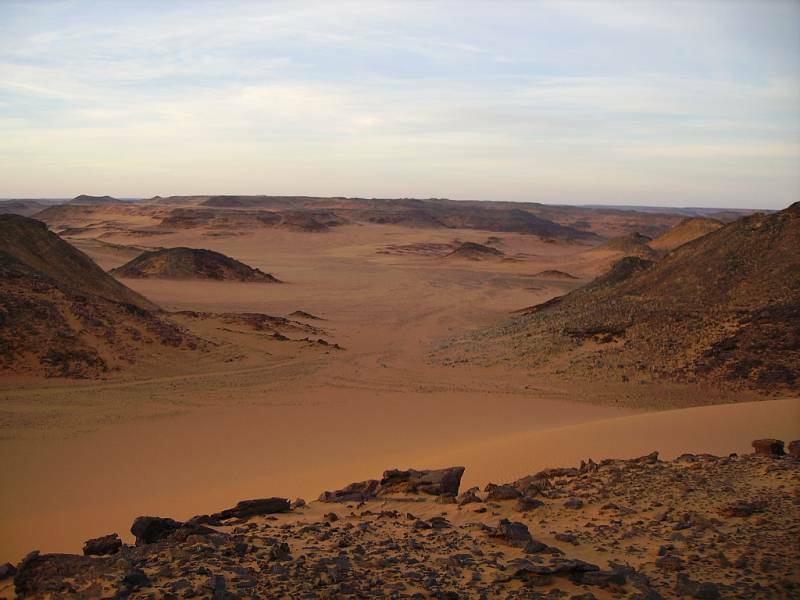 The possible chemical and mechanical processes are not explored. 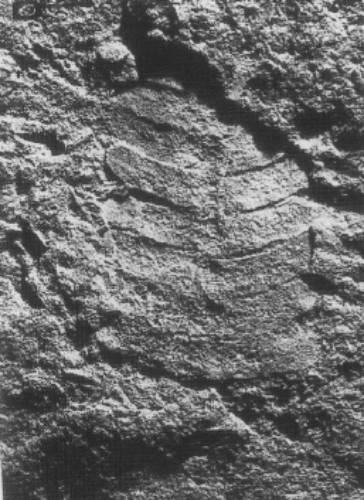 The Proterozoic basement is located very close to the surface. 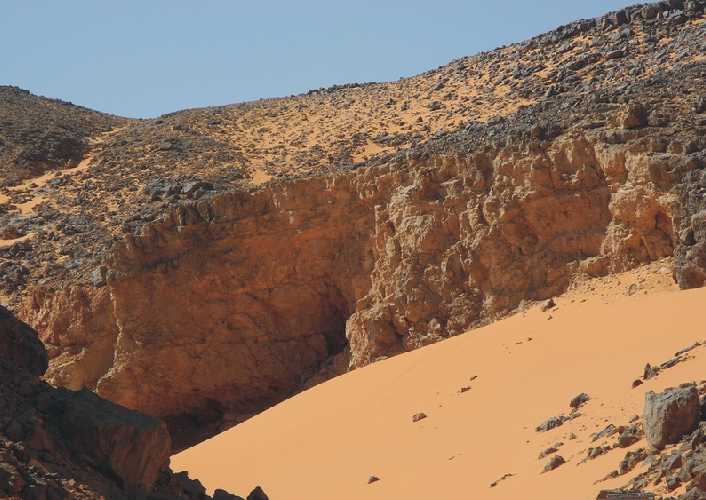 On the widespread erosion surfaces in the foreland but are outcrops very rare because they are covered by desert sand. 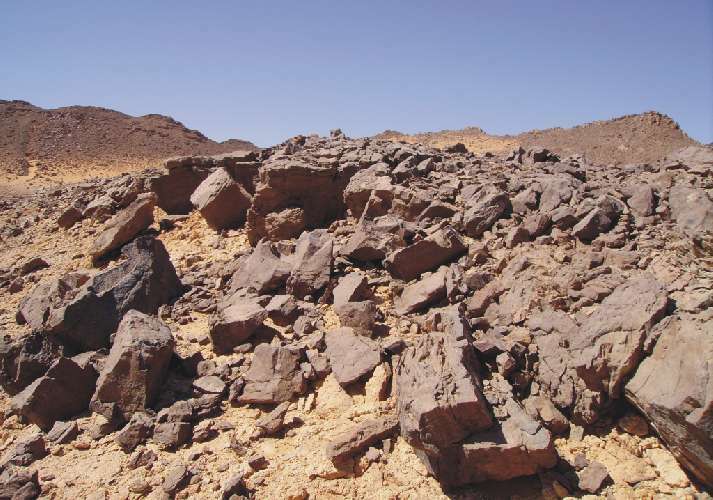 Debris of basement has the author found in the foreland of the Gilf Kebir plateau nearby the Aqaba passage. 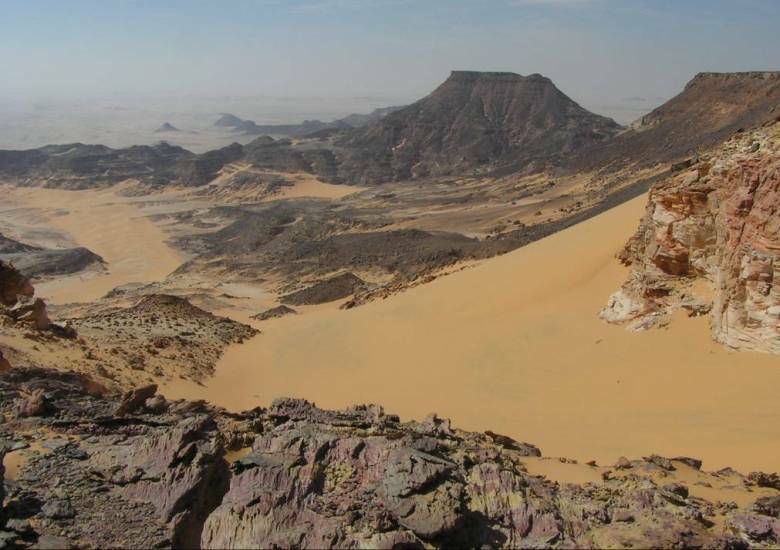 Along the southwestern ridge of the Gilf Kebir Plateau can be studied Paleozoic strata at many places. 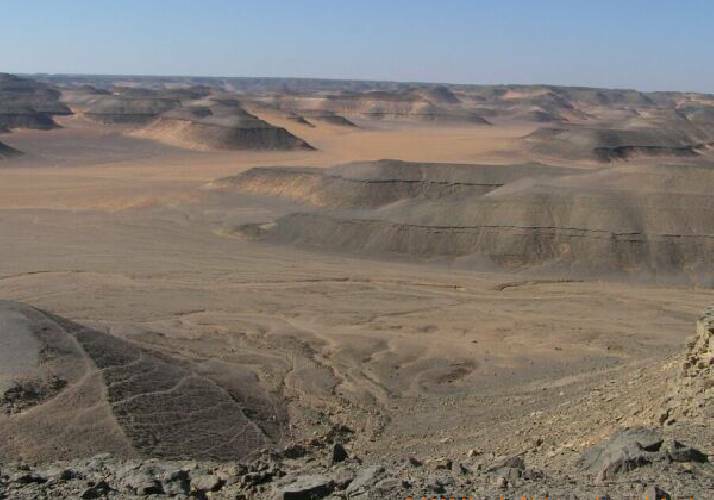 The Ordovician/Silurian Um-Ras Formation (in sense KLITSCH) reaches a thickness of 100 m between the Um Ras passage area and the southwestern slope of the Abdel-Malik plateau. 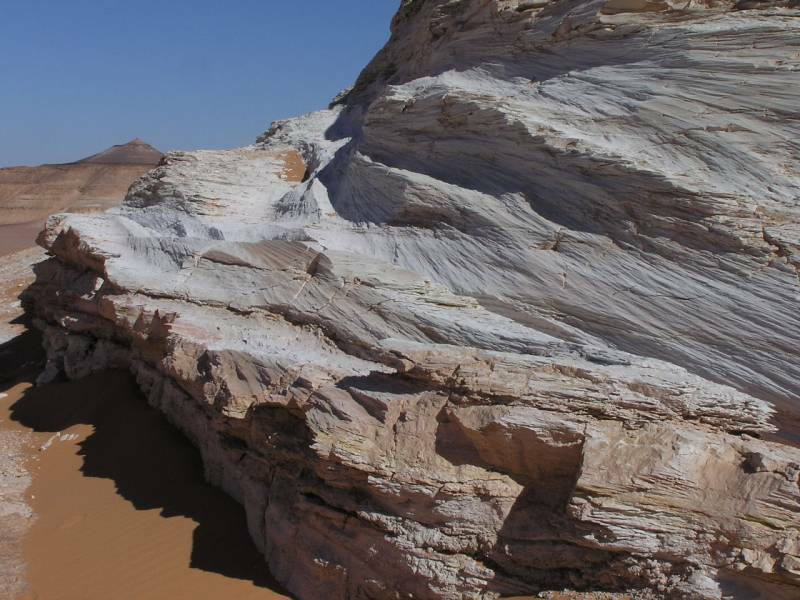 It consists mainly of fluvial and deltaic sandstone, intercalated with interbeds of shallow marine siltstone, some shale and burrowed sandstone. 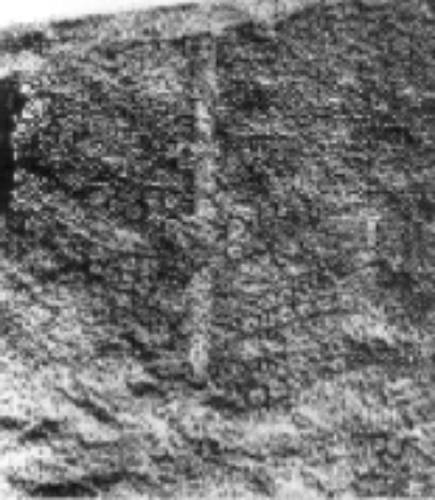 These beds contain Harlania harlani DESIO, Cruziana cf. 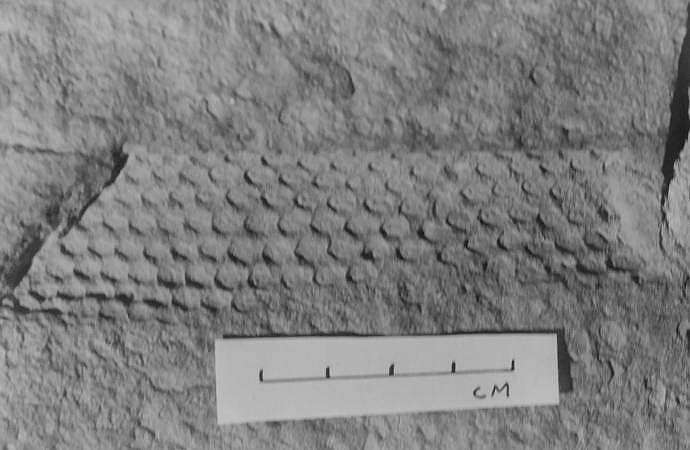 acacensis SEILACHER, Scolithos sp. 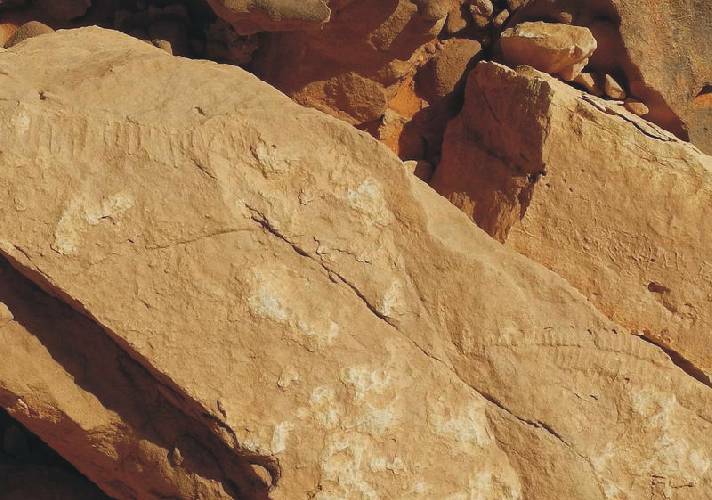 and other trace fossils at several levels. 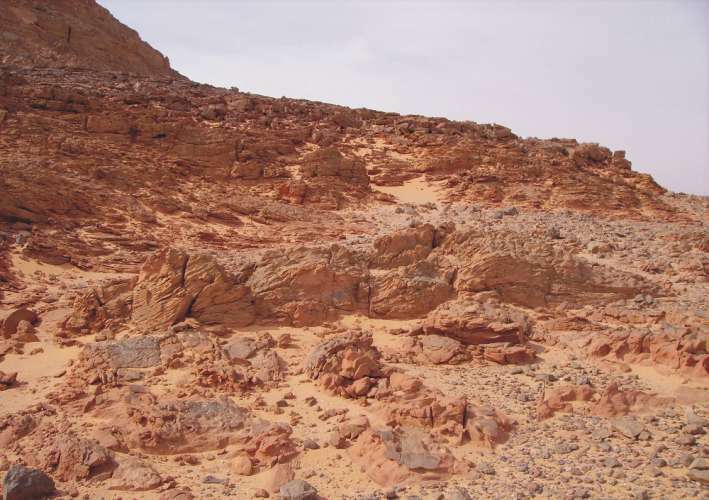 At the type locality, the Um-Ras Formation directly overlies Precambrian basement. 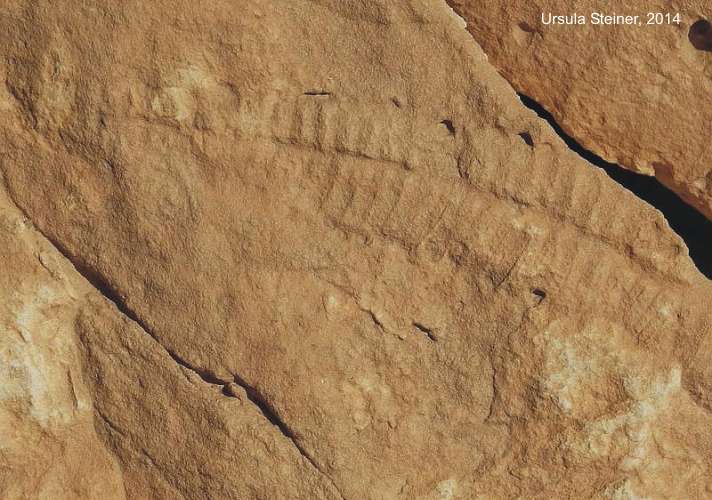 South of the Um Ras passage, the trilobite tracks (Cruziana) of Ordovician age occur only some meters above basement. 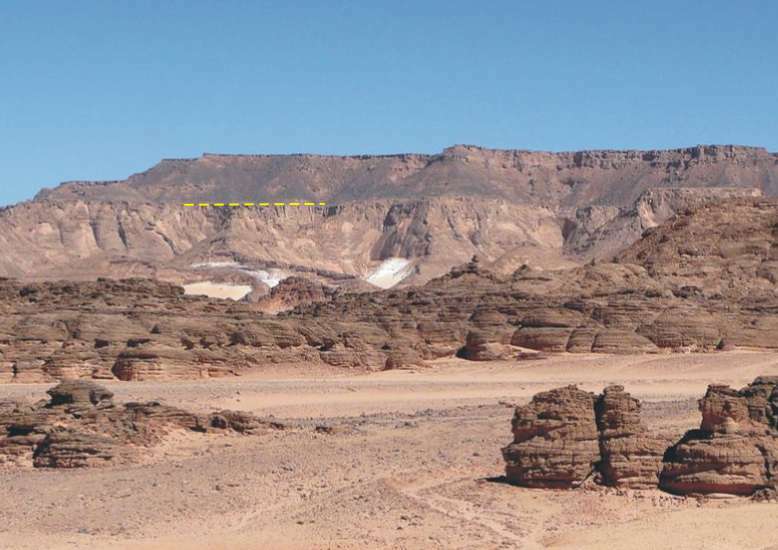 The Um-Ras Formation is overlain by maximal 300 m fluvial sandstone similar to the Devonian Tadrart and Binem Sandstone, are exposed at the escarpments of the plateau as well as in large wadis in the plateau. 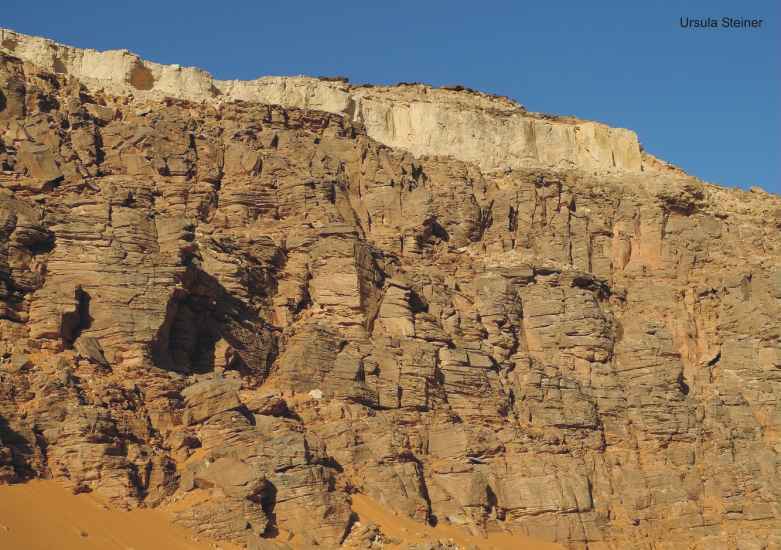 The Karkur-Talh Formation is represented by 30 meters of shallow marine and tidal sandstone. 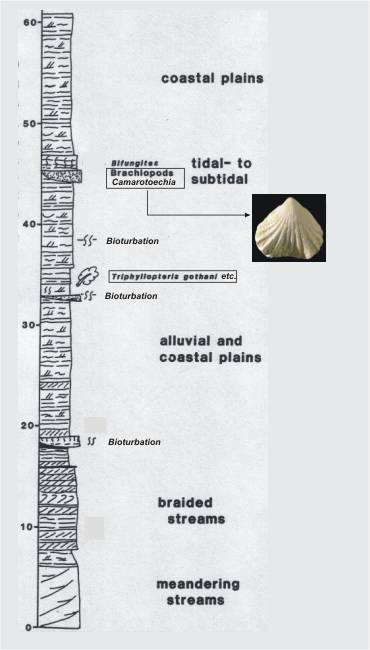 "The Formation can be interpreted as deposits of subtidal shoals and tidal channels. 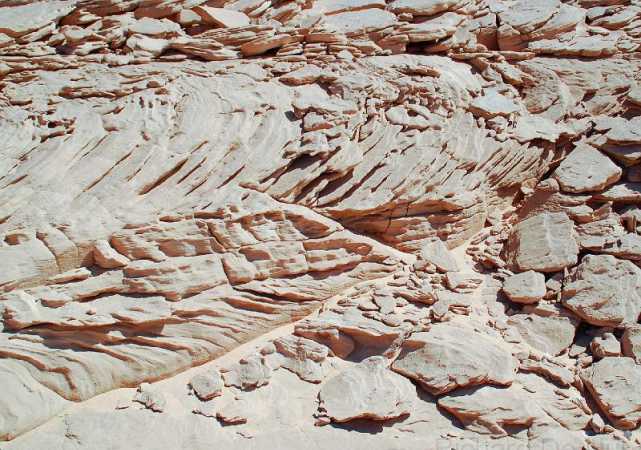 The coarsening-upward sequence at the lowermost part of the section is made up of interbedded laminated siltstone and fine-grained sandstone with wavy lamination and ripple cross-lamination. 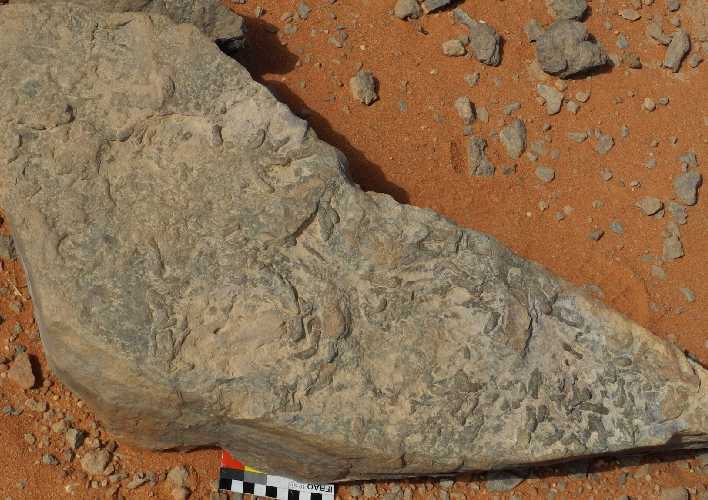 It contains trace fossils. 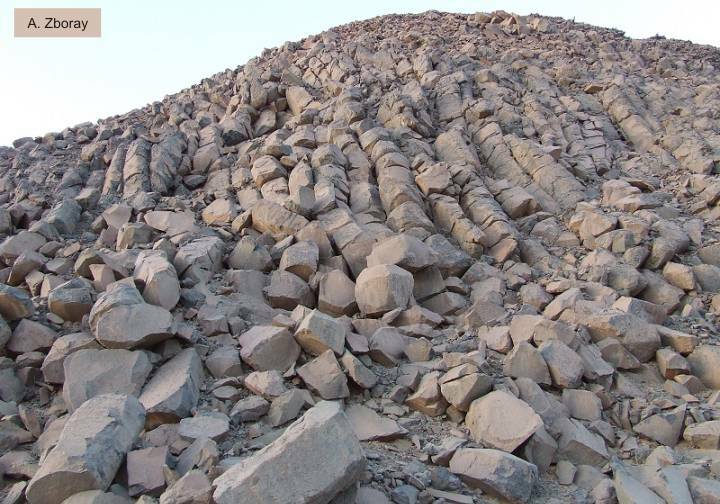 The upper part of this coarsening-upward sequence is made up of fine- to medium-grained destratified sandstone, containing abundant Skolithos-burrows. 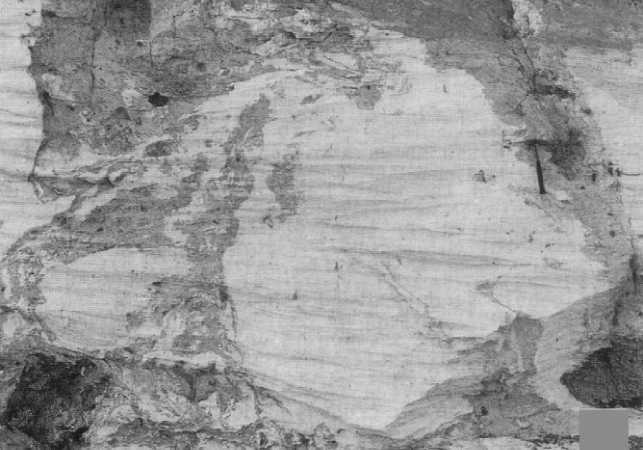 This Skolithos-sandstone of up to two meters in thickness is erosively overlain by tidal channel-sandstone, consisting of medium- to coarse-grained, trough and planar cross-bedding with intraformational conglomerates at the channel floor. 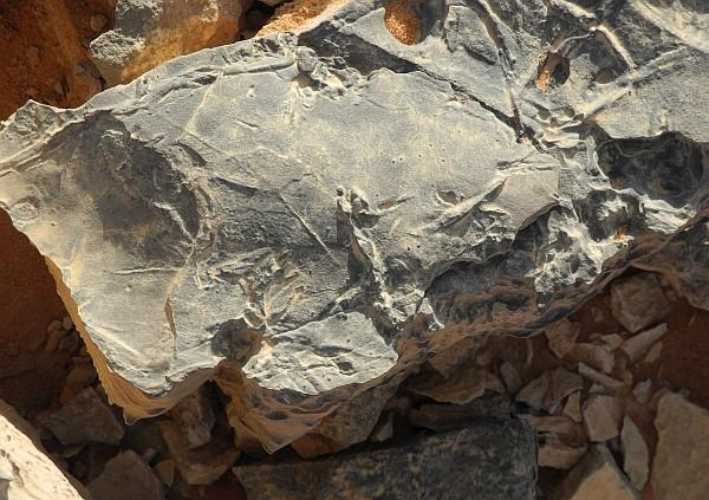 The uppermost part of this first shallow marine unit is formed by skolithos-baering, medium- to coarse-grained sandstone which is poorly defined cross-bedded and partly conglomeratic. 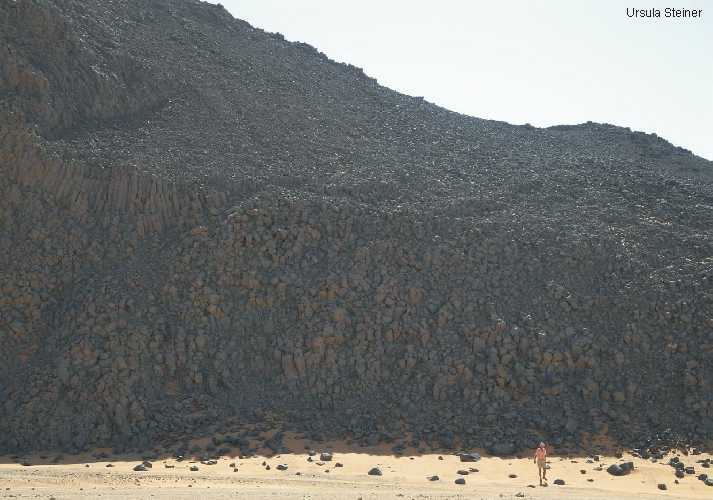 This unit can be up to 18 m thick. 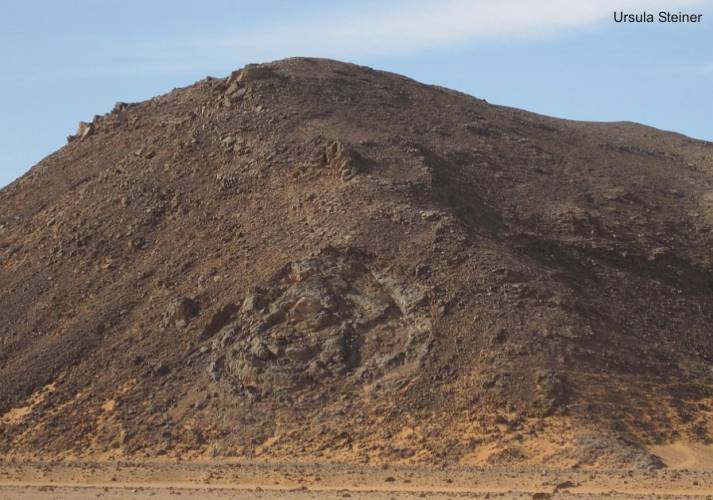 The density of the skolithos-burrows increases towards the top. 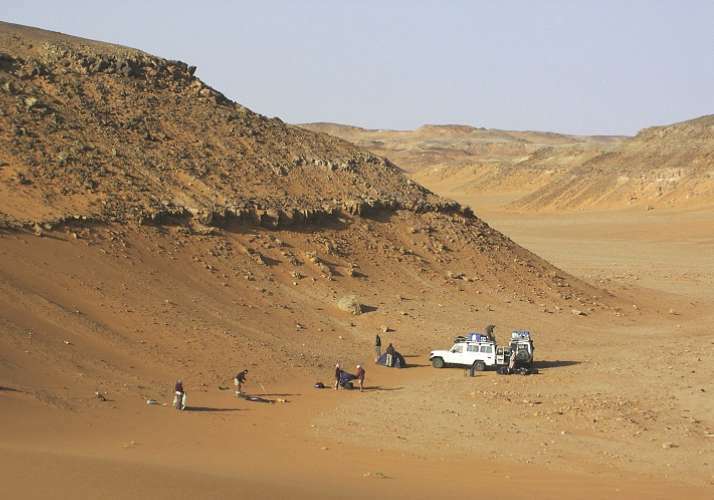 The environment of origin is assumed to have been subtidal shoals, produced during more rapid sedimentation. 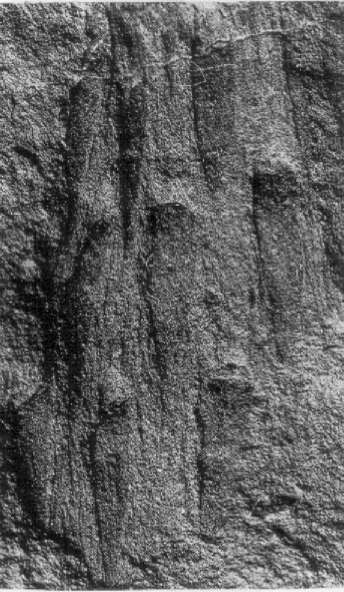 The second minor shallow marine intercalation in the upper part of the formation is only up to 5m thick. 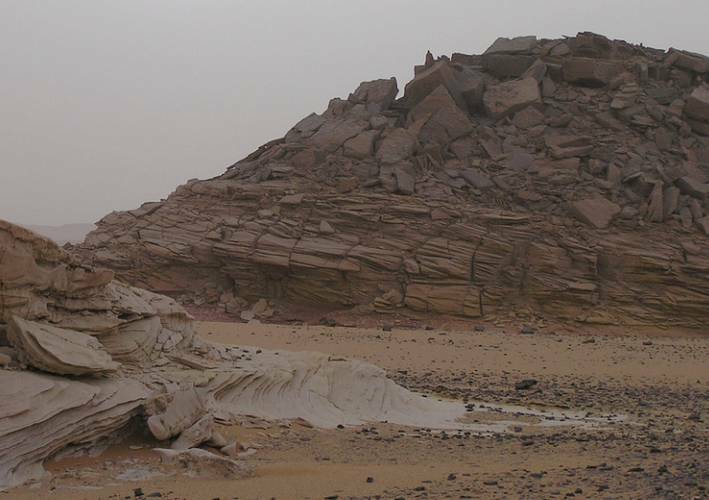 It is composed of a fining-upward tidal-channel sequence with trough cross-bedde sandstone and fine-grained sandstone to shaly siltstones, with partly intensive bioturbation towards the top. 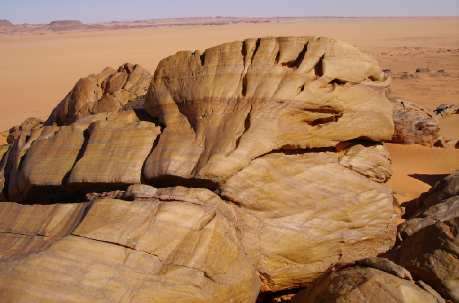 Locally, a subfacies of well-sorted, fine-grained sandstone exhibiting horizontal and low-angle cross-stratification with parting lineation occurs. 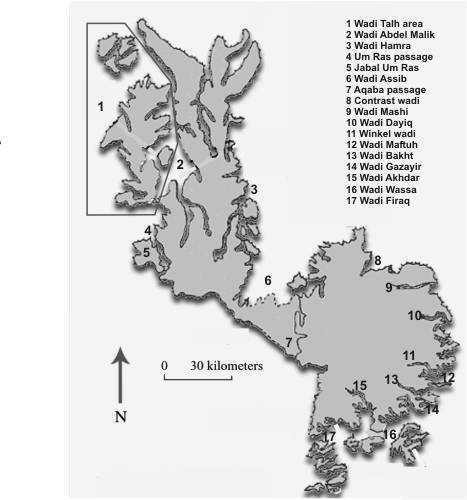 This subfacies indicates upper-flow conditions within the nearshore environment. 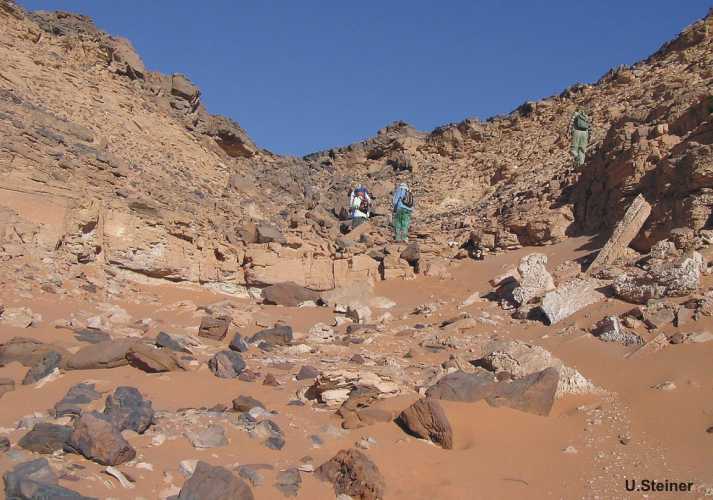 The shallow marine intercalations can be traced to the area of Aqaba passage (Gilf Kebir)." 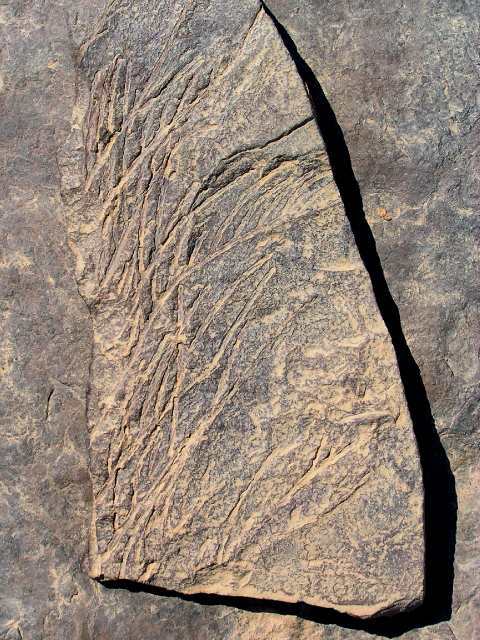 The Um Ras Formation is typical for the interface of fluvial and very shallow marine environment near the edge of the Silurian marine transgression. 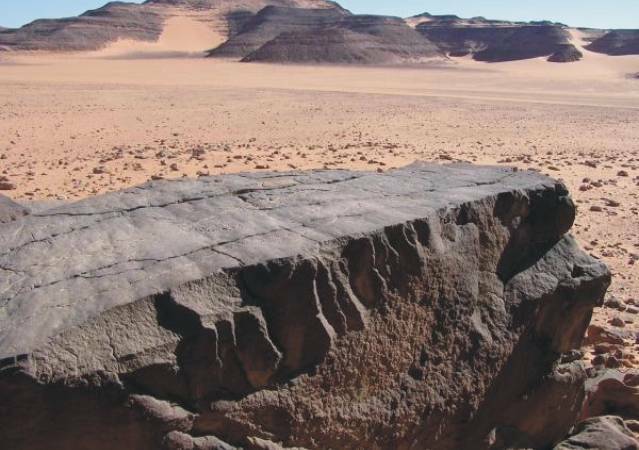 It has a thickness of approximately 75-80 meters. 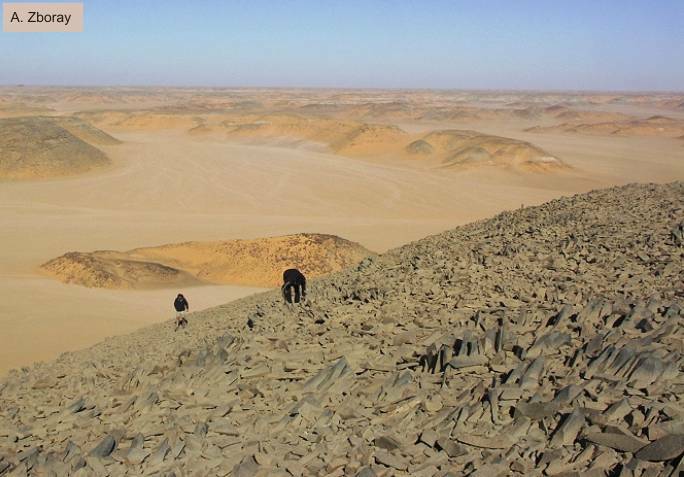 "The deposits of the Um-Ras Formation are descrided as non-cyclic, braided fluvial systems. 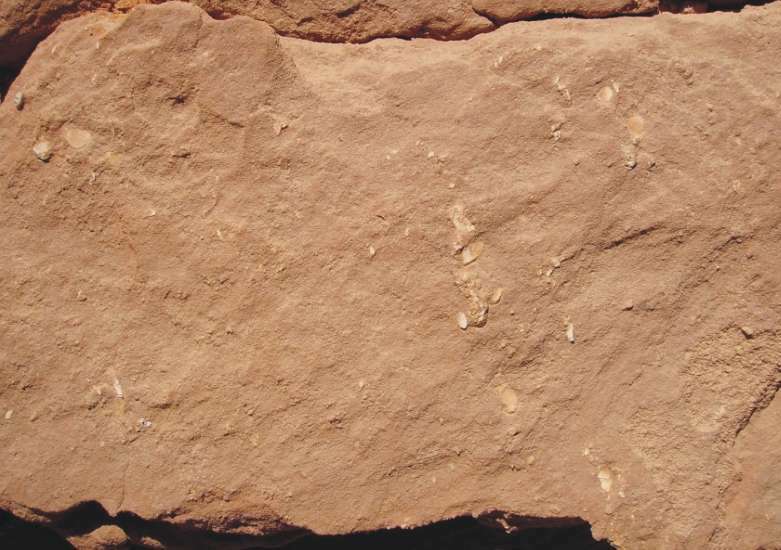 This sheet-like, medium- to coarse-grained sandstone is moderatly sorted and exhibits small- to large-scale tabular cross-stratification. 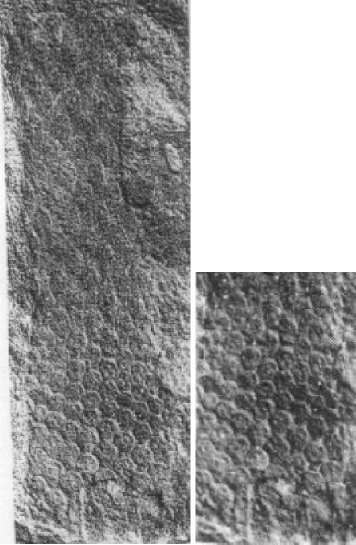 Grouped sets of omikron crross-stratification alternate with a minor facies of horizontal stratification, and low-angle cross-bedding and single pebbly layers. 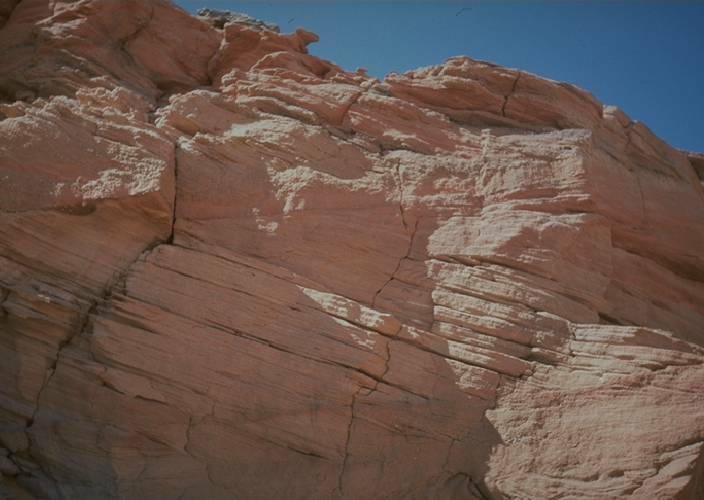 Deformed cross-bedding is frequent and may occur in successively superimposed sts. 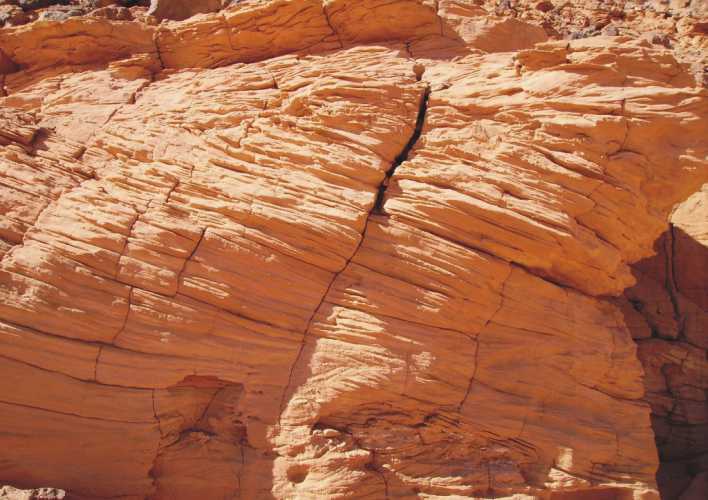 The style of deformation ranges from buckled to overturned and convolute foresets. 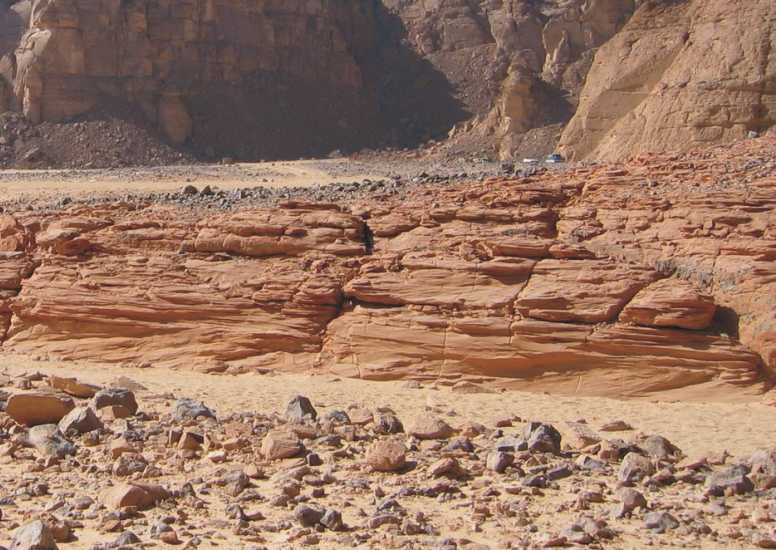 Braided fluvial systems are subject to rapid fluctuations in flow velocity and cause the sediment to be deposited mainly in the form of channel bars. 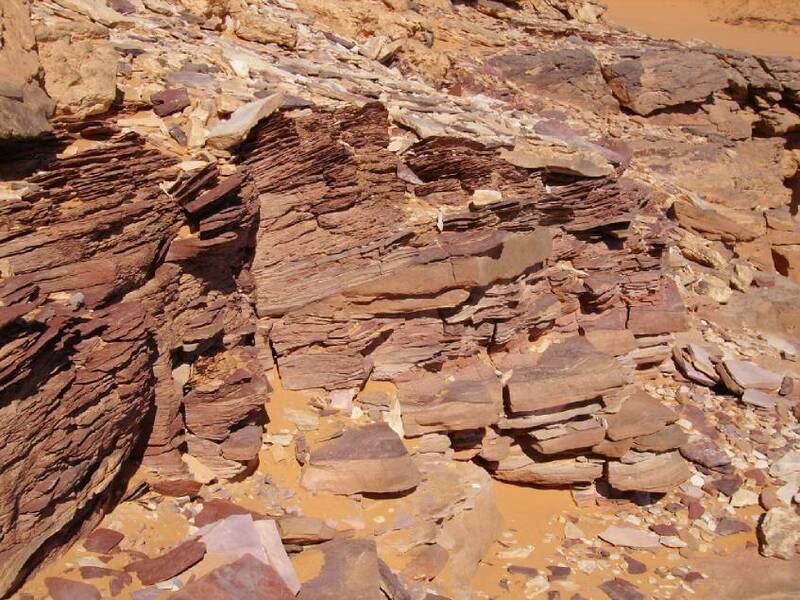 The planar stacked cross-bedded sandstone is attributed to high-stage deposition within transverse bars by straight-crested megaripples. 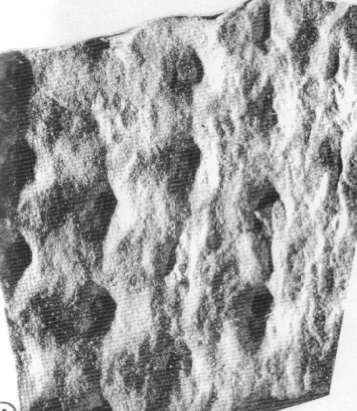 The facies association corresponds to rivers of low sinuosity with linguoid and partly transverse bars. 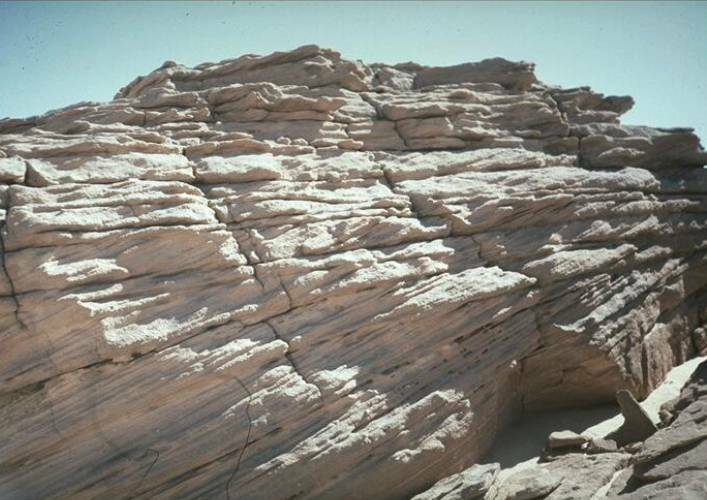 The abundant overturned foresets within this facies are attributed to the action of current drag on a liquefied sand bed. 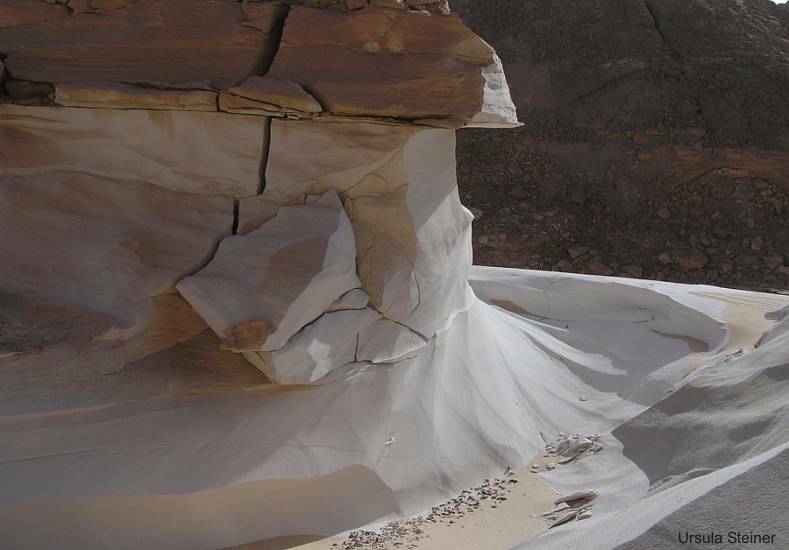 The coarse friable nature of the sandstone make internal fabric conditions an unlikely cause of liquefaction. 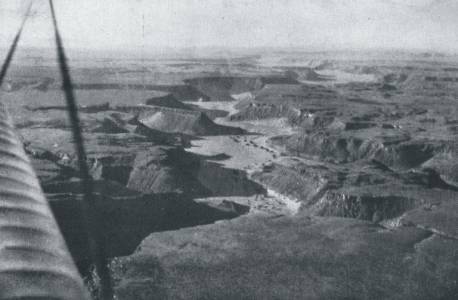 An external mechanism such as of tectonism must be sought." 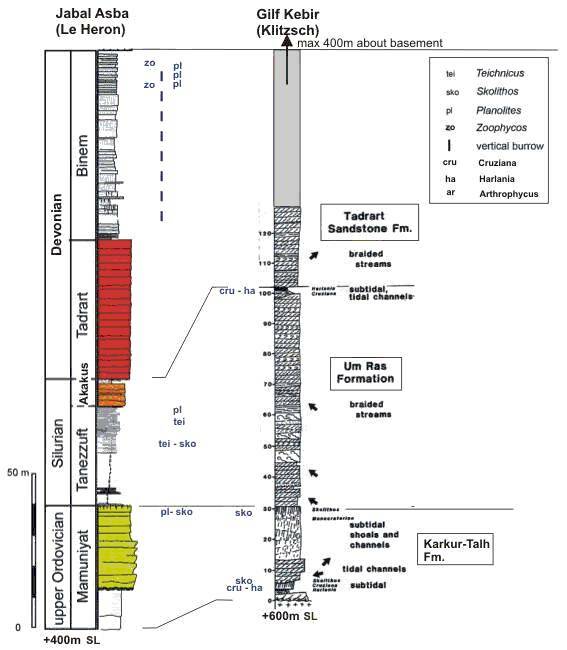 The Devonian strata of the Tadrat and Binem Formation have not been dated until now by fossils. 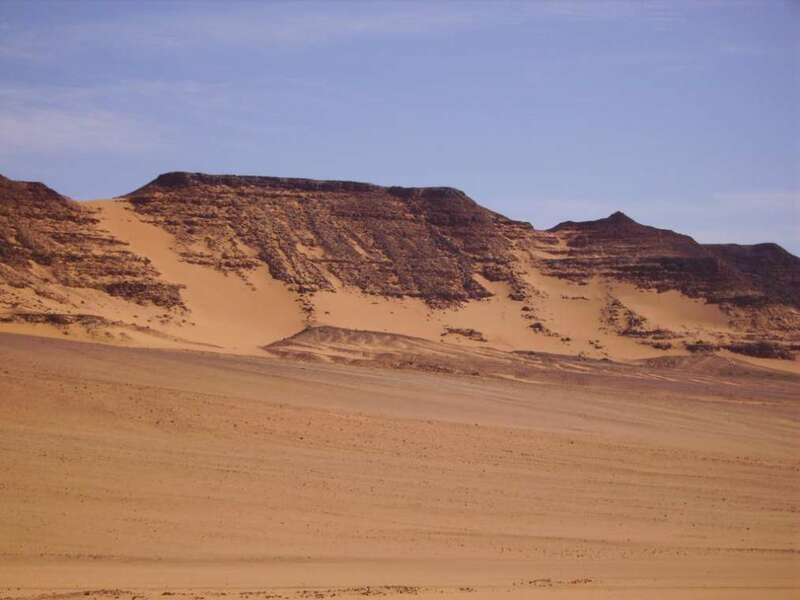 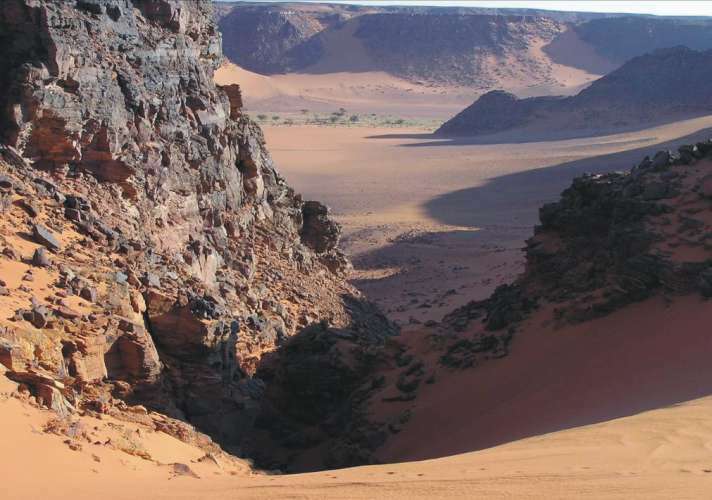 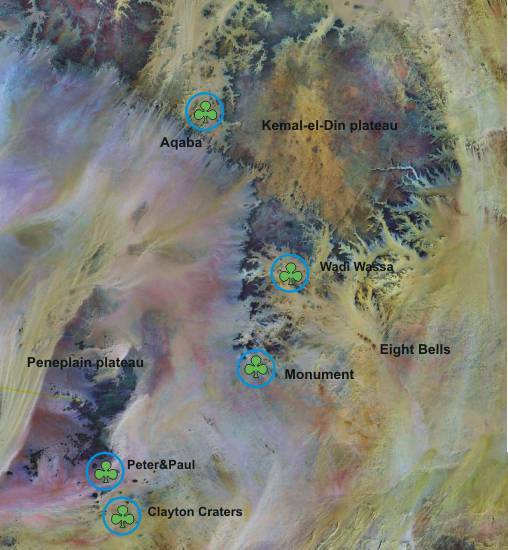 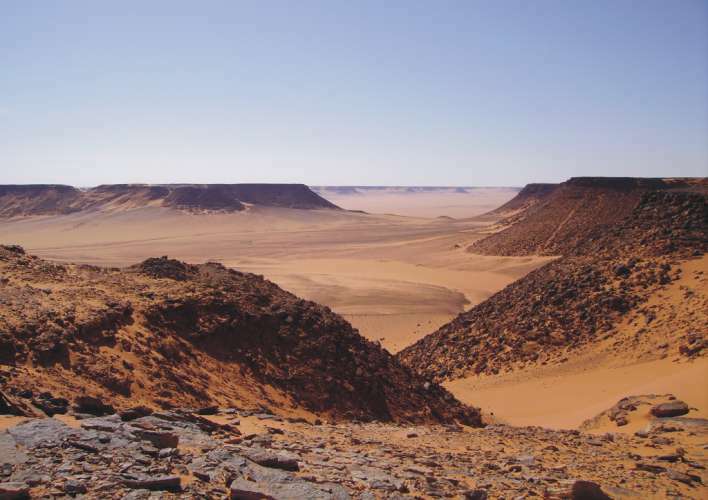 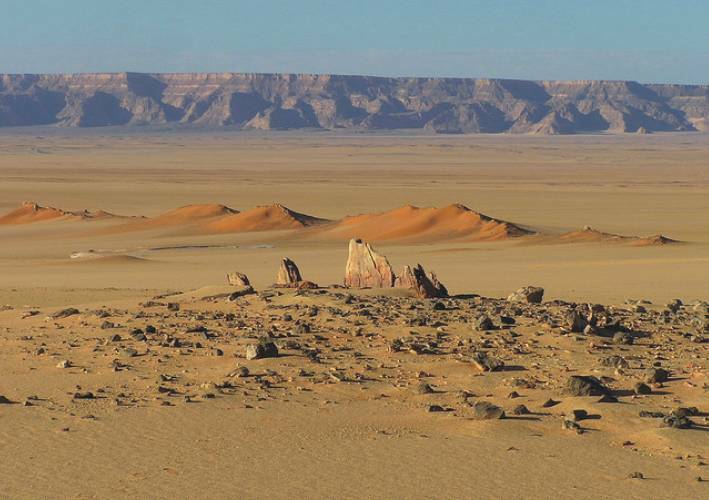 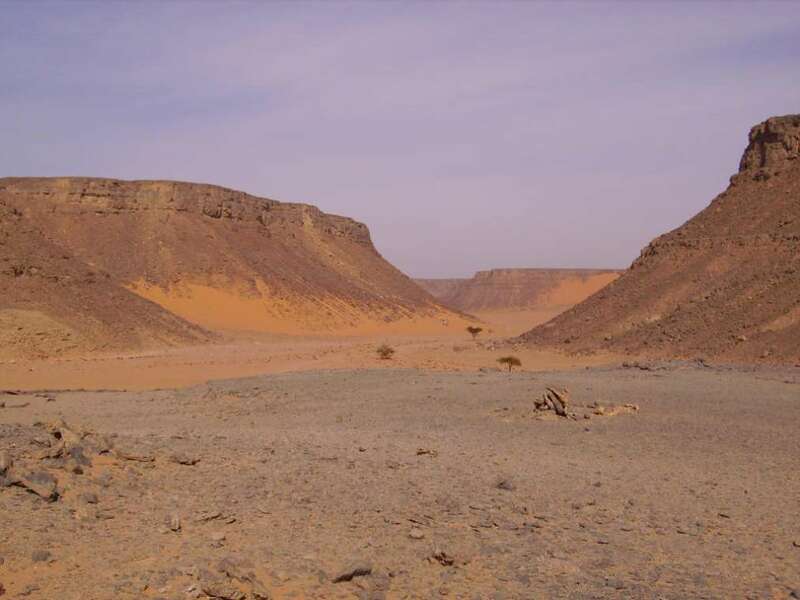 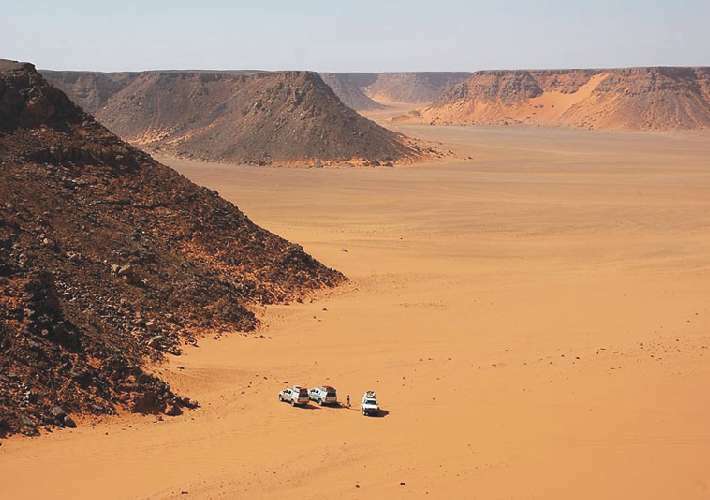 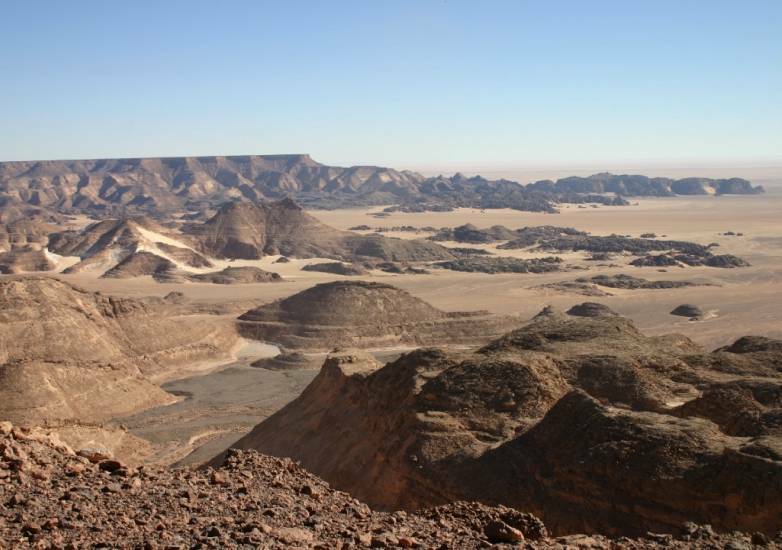 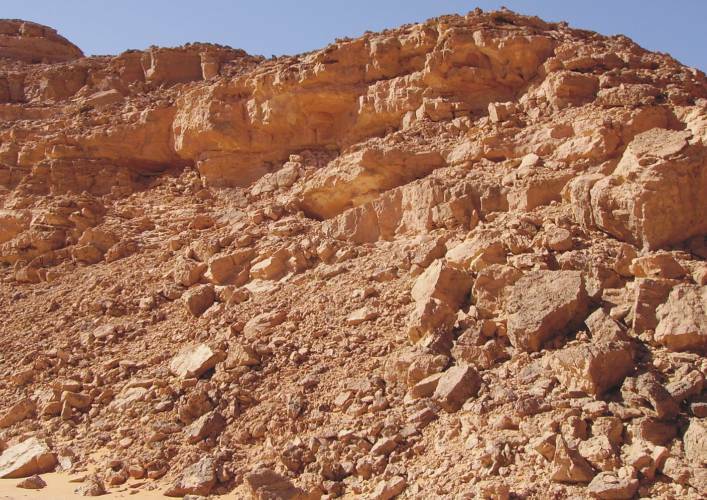 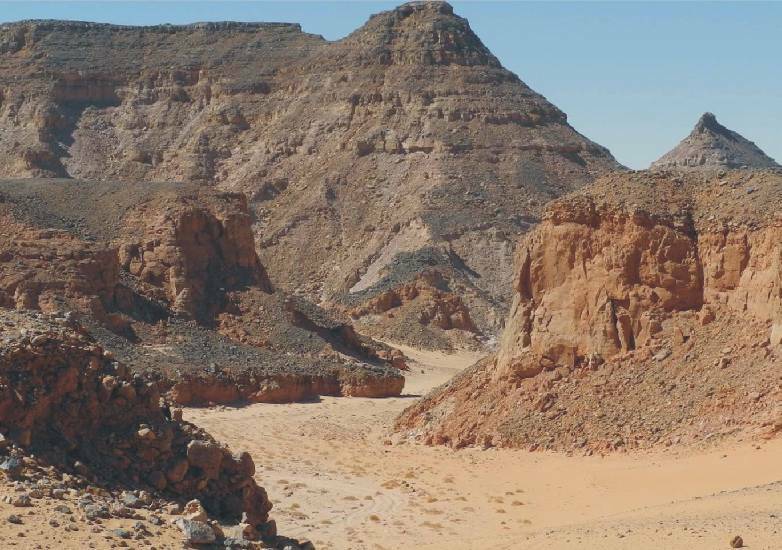 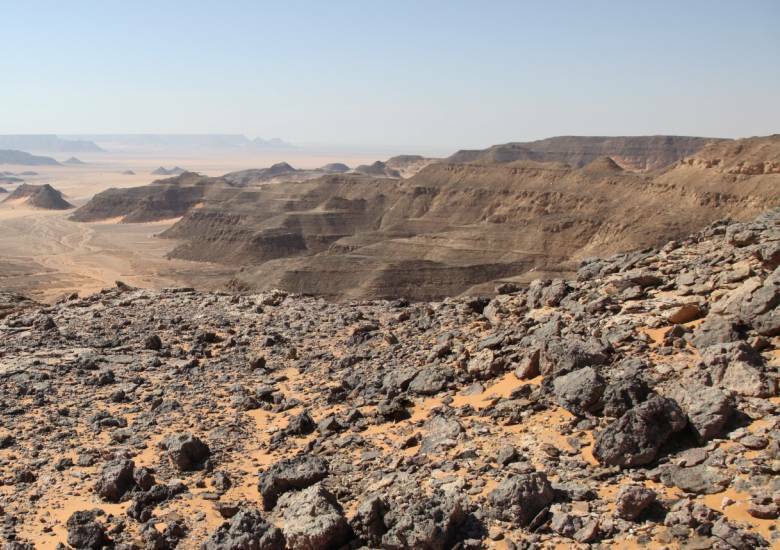 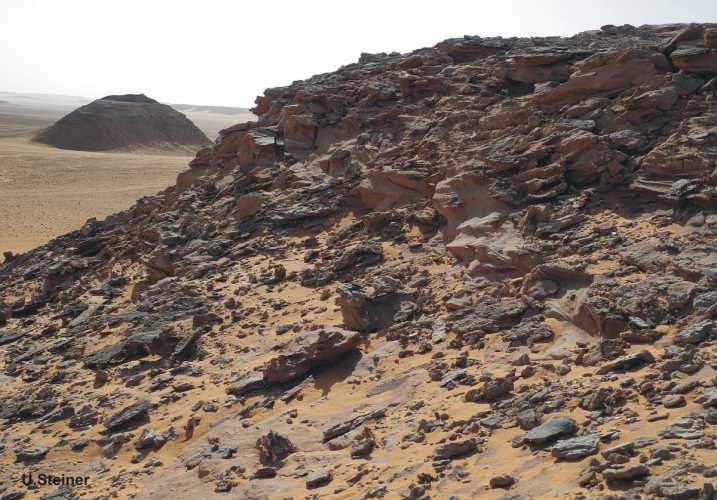 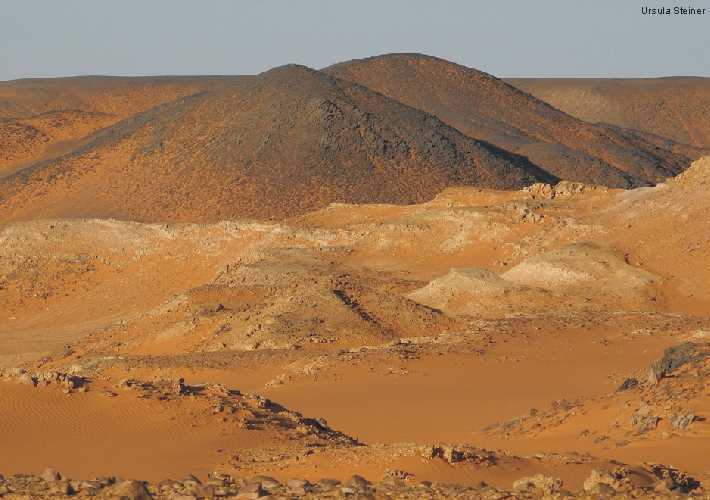 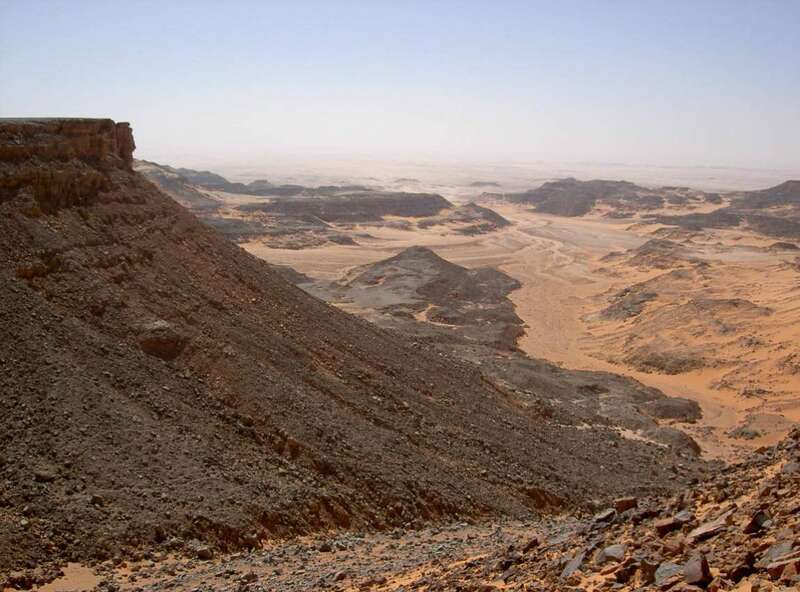 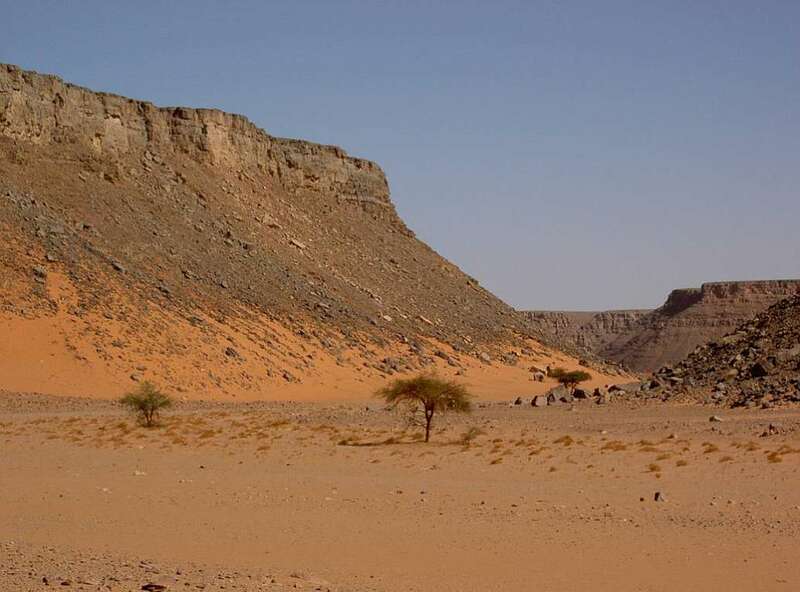 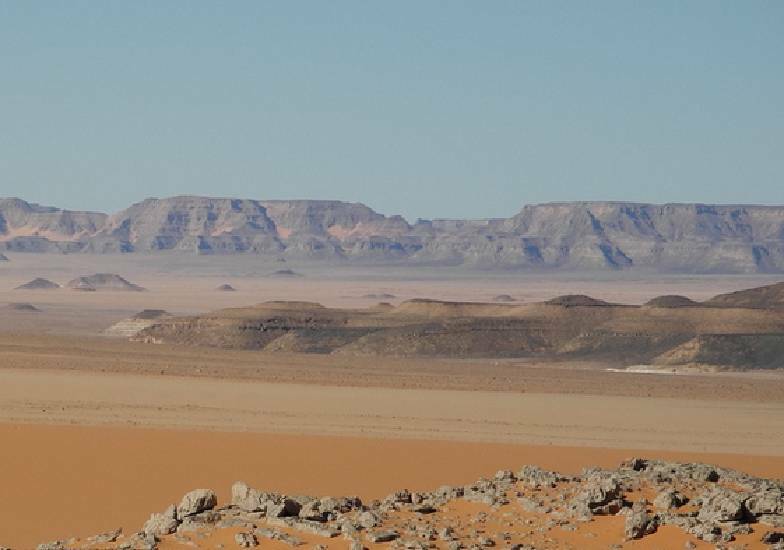 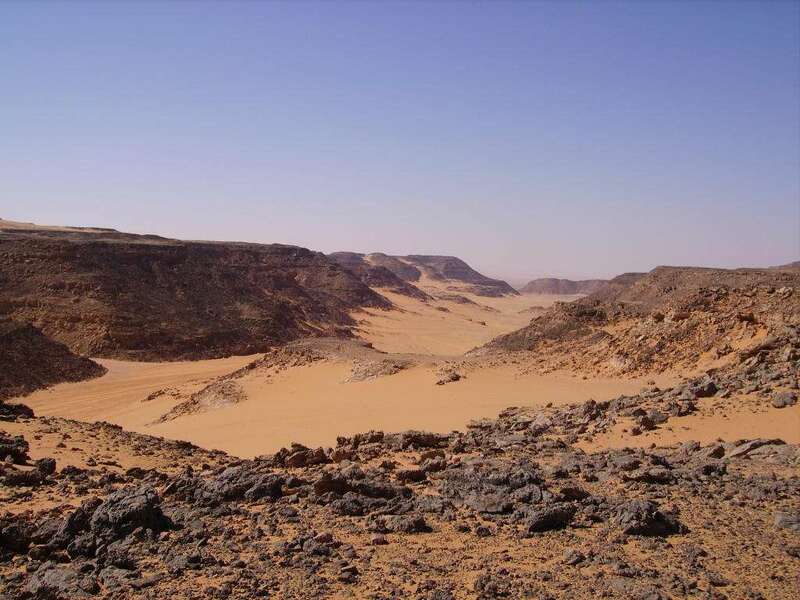 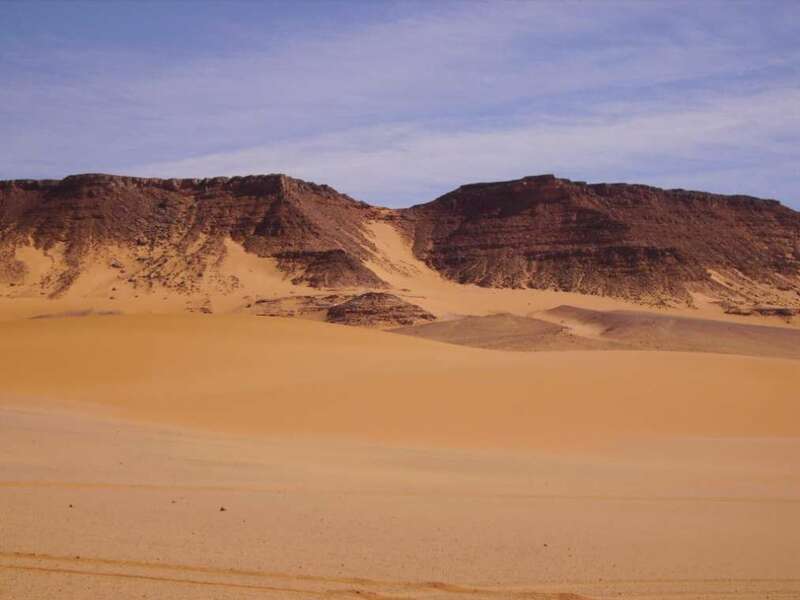 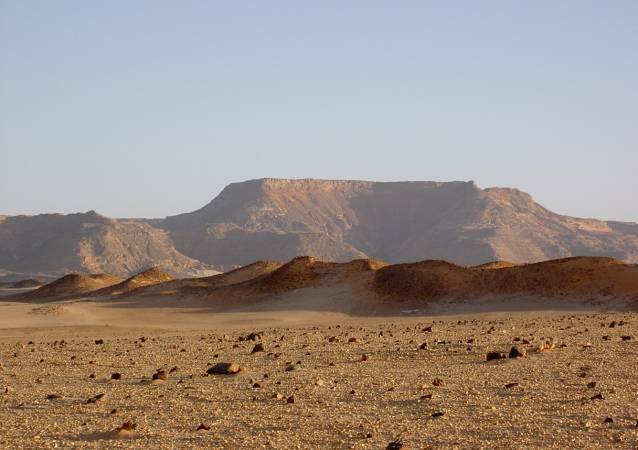 Lithofacies and stratigraphic comparisons with the corresponding sequences in th Kufra basin suggest a stratigraphic connection between the fluviatile deposits in the area of Jebel Uweinat und Gilf Kebir. 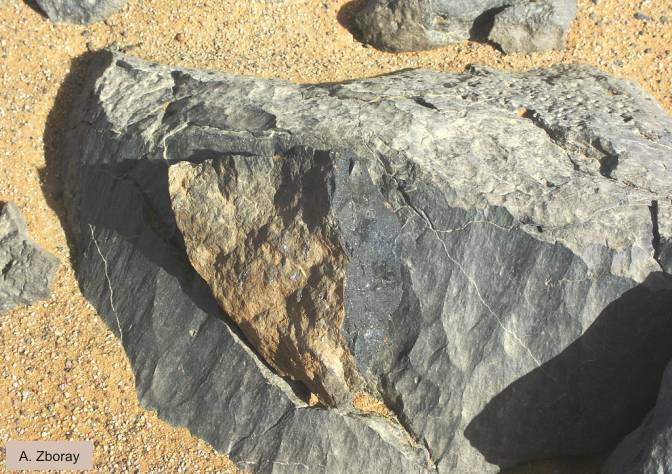 It has a thickness of approximately 300-400 meters. 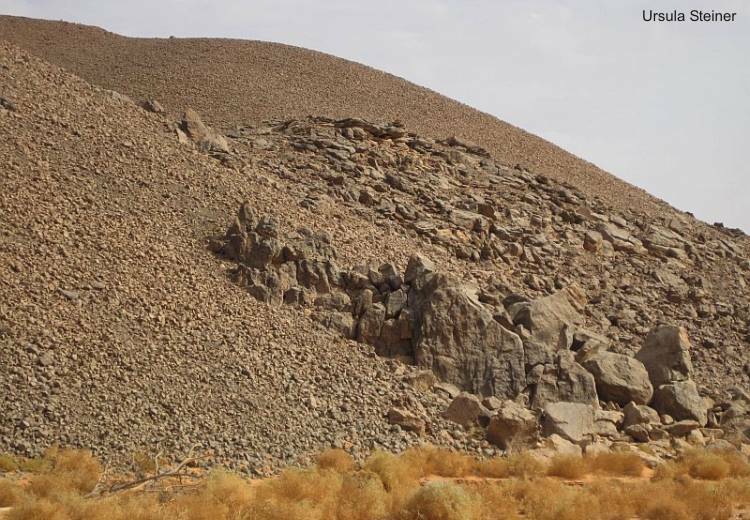 The occurrence of Ordovician deposits in the Gilf Kebir is only detected in local outcrops of paleosol layer with rich Skolithos. 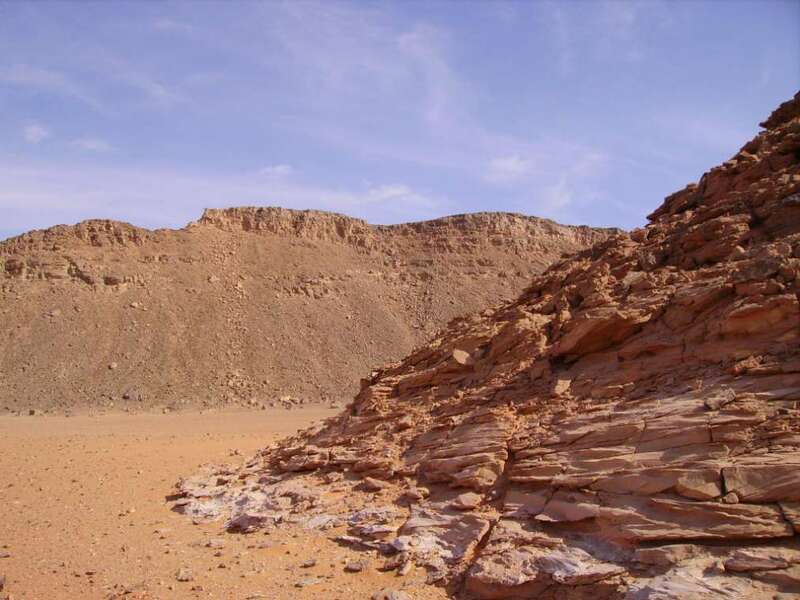 At the northwestern edge of the plateau, between the Um Ras passage and Wadi Sura, unusual features are observed especially in the Silurian strata. 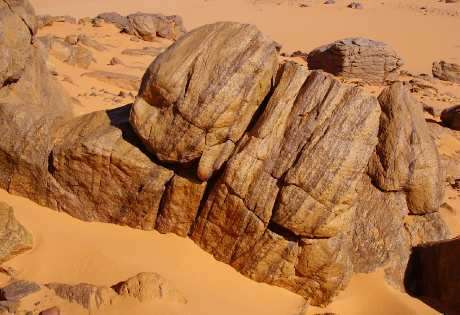 The sandstones are subjected to a so-called exfoliation (like the Navajo sandstone in North America). 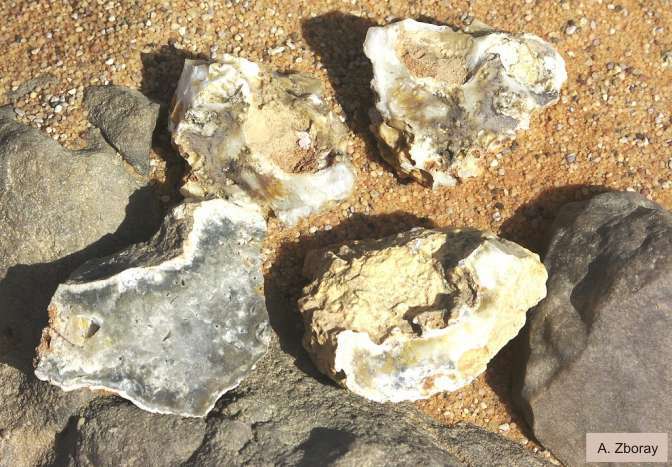 The causes of exfoliation (shelled weathering) is not explored. 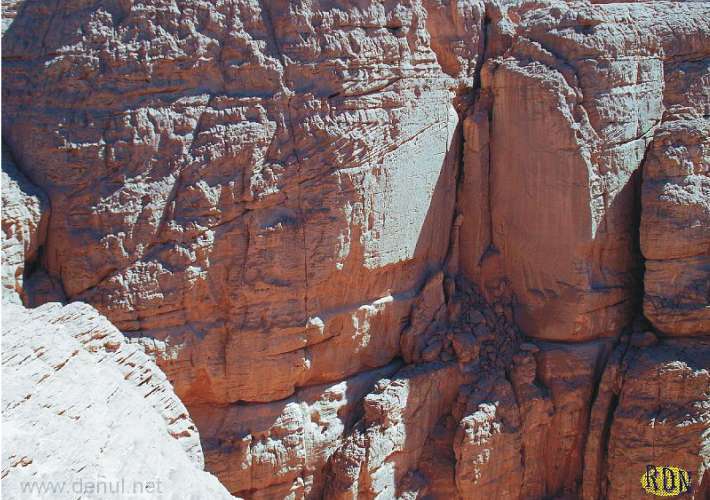 It is believed a tectonically induced stress effect (uplifting process?). 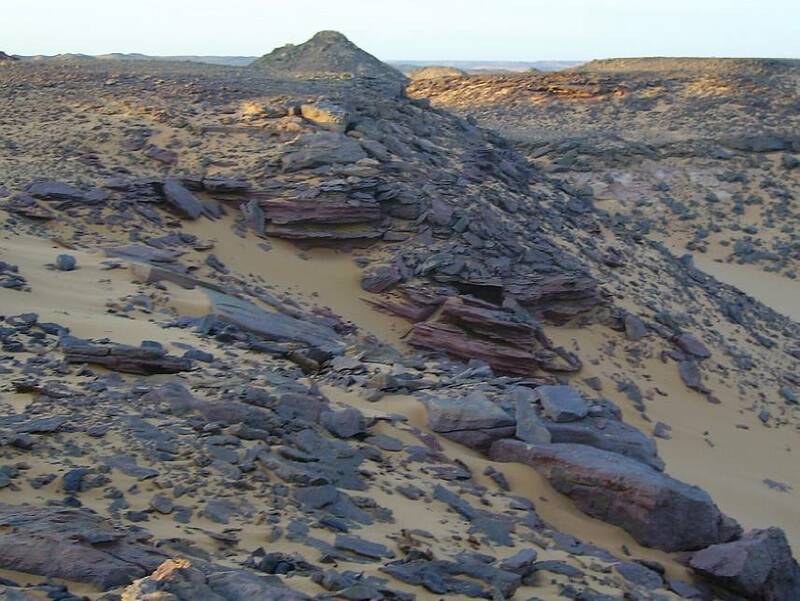 In the Gilf Kebir can be determined, in principle, the stratigraphic boundary between Silurian and Devonian above the stressed sandstones (exfoliation). 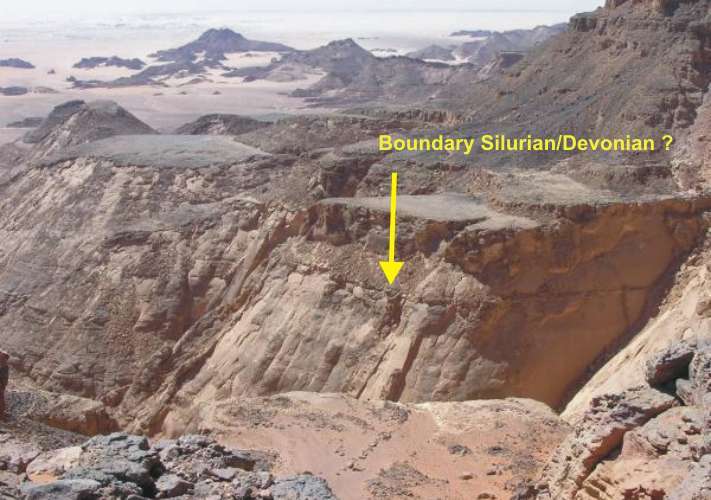 An iron-rich crust documented a time gap between Silurian and Devonian layer. 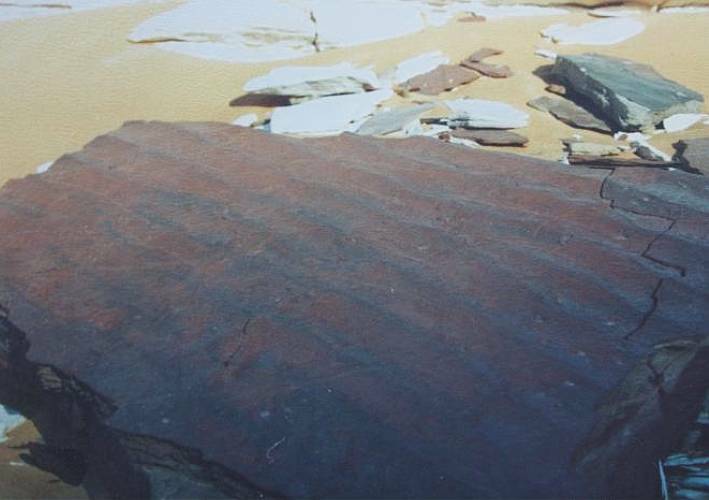 The Devonian sandstones are of fluviatile origin form a compact fine stratified serie. 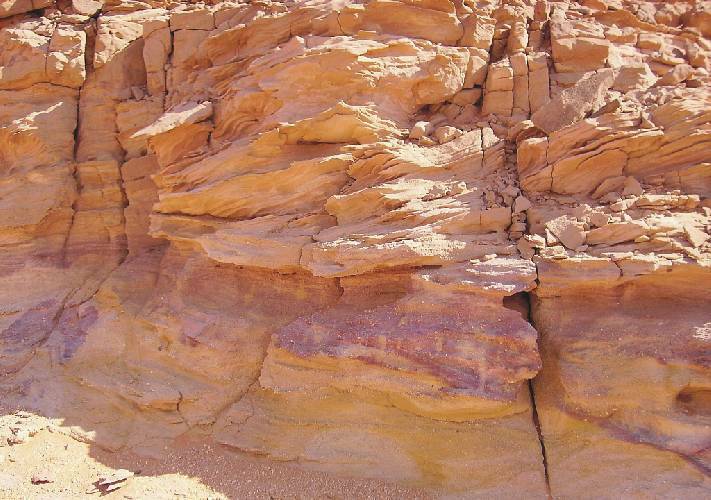 A separation of Tadrart and Binem formation is not yet possible. 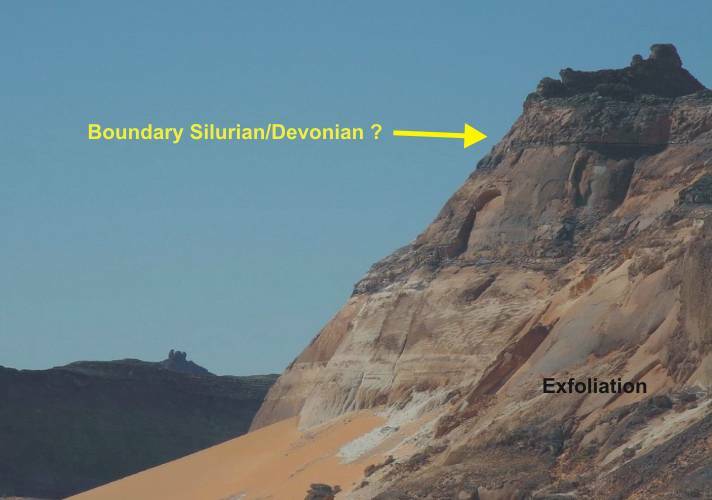 The boundary between the Silurian and Devonian layers is placed above the layers with exfoliation (if any). 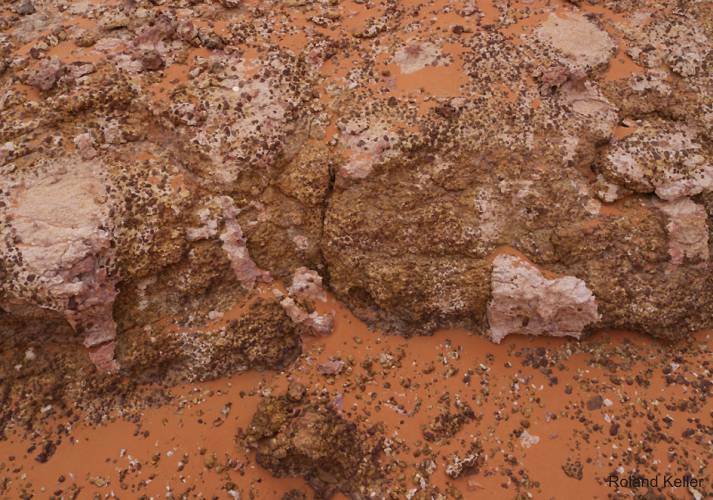 In between, there is a thin red-brown mudstone layer with bioturbation. 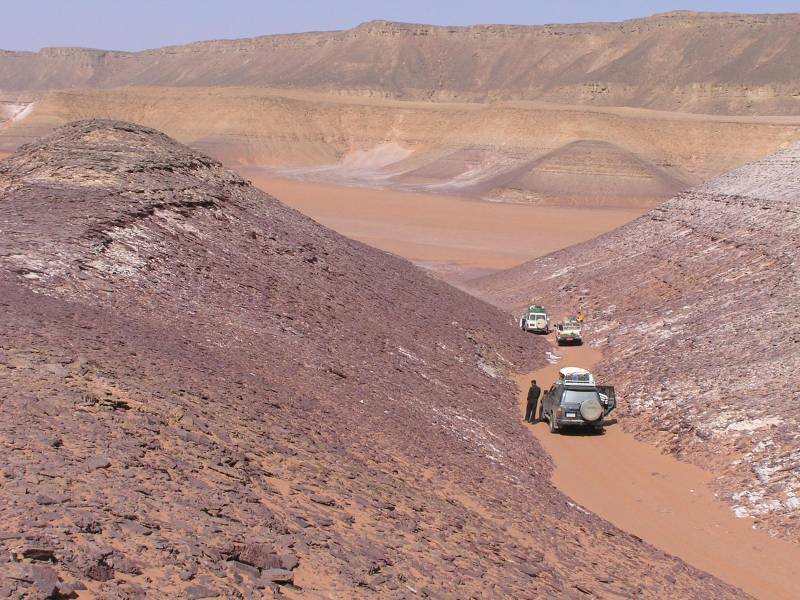 Carboniferous layers of the Wadi-Malik Formation (in sense KLITZSCH) more or less conformably overlies older Paleozoic beds (e.g. 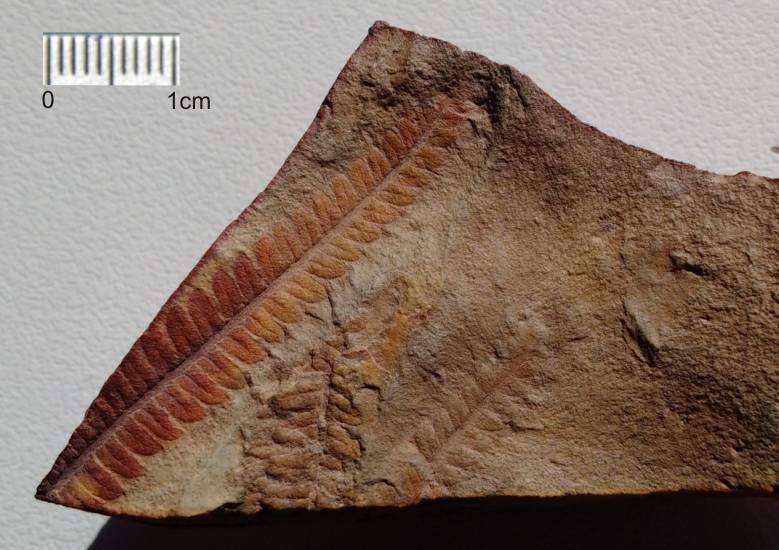 Ordovician Um-Ras Fm.) 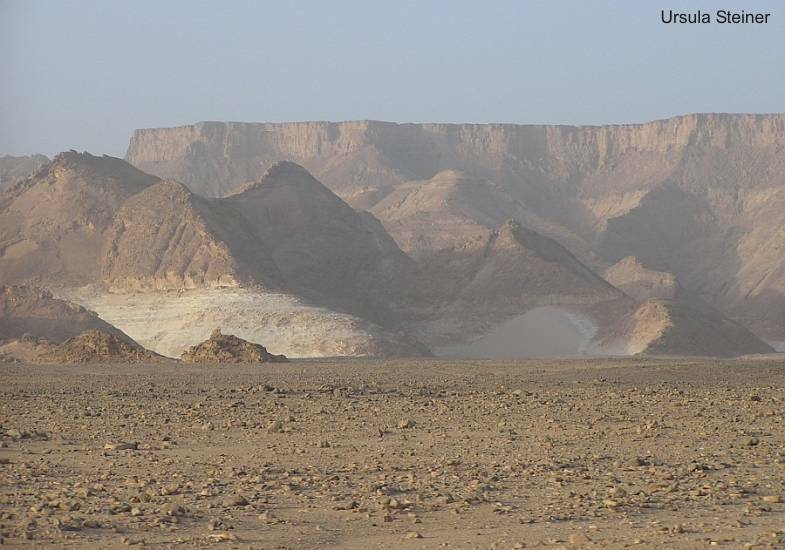 in the middle part of the southwestern and western Abdel-Malik plateau. 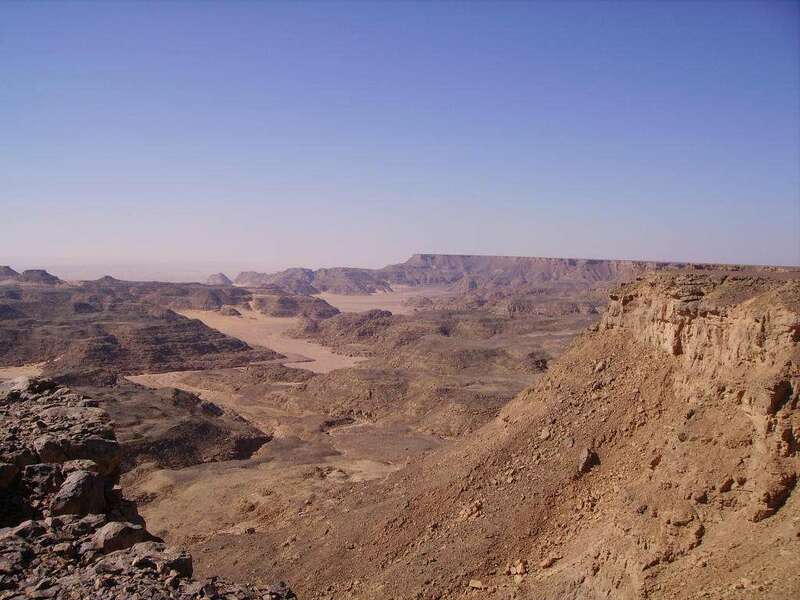 However, it is best exposed along the Wadi Abdel Malik and its side wadis in the Wadi Talh area which reach from the southern and southwestern part of this 40 x140 km large plateau towards its relatively flat northern end. 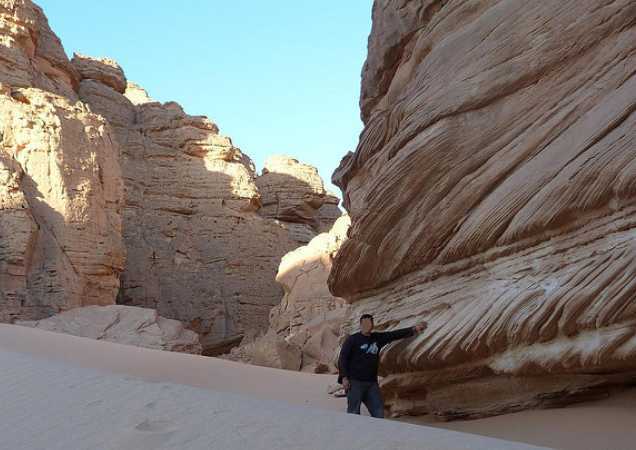 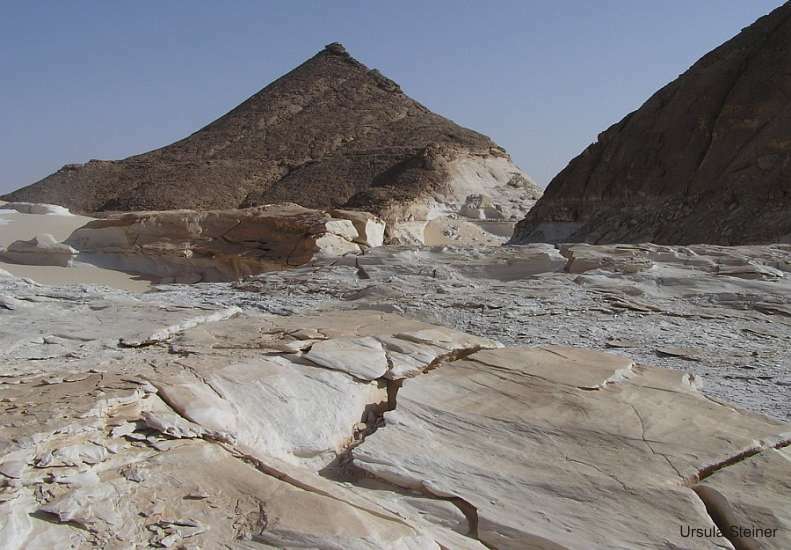 The 100 to 150 m thick Wadi Malik Formation consists of marine sandstone, siltstone and shale interbedded with fluvial, deltaic and tidal sandstone. 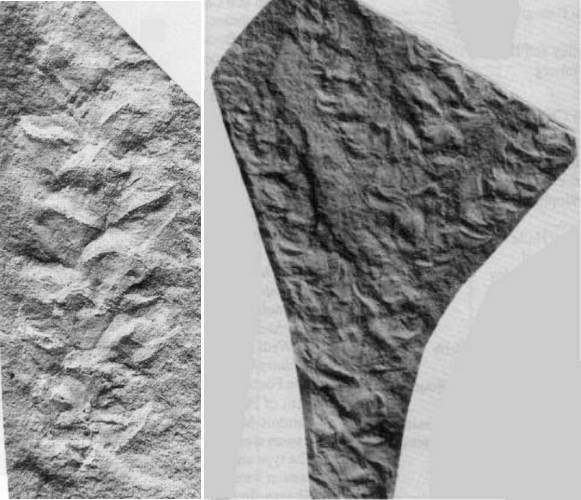 In marine beds are frequent brachiopods (Camerotoechia sp. 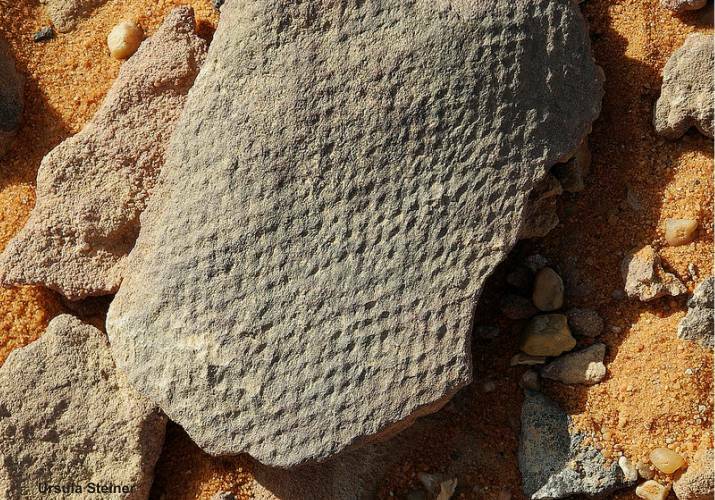 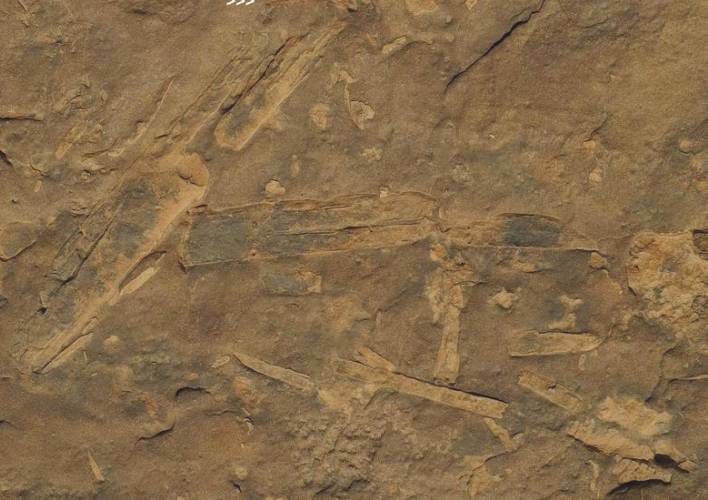 ), trace fossils like Zoophycus and Bifungitisas as well as small Lamellibranchiata. 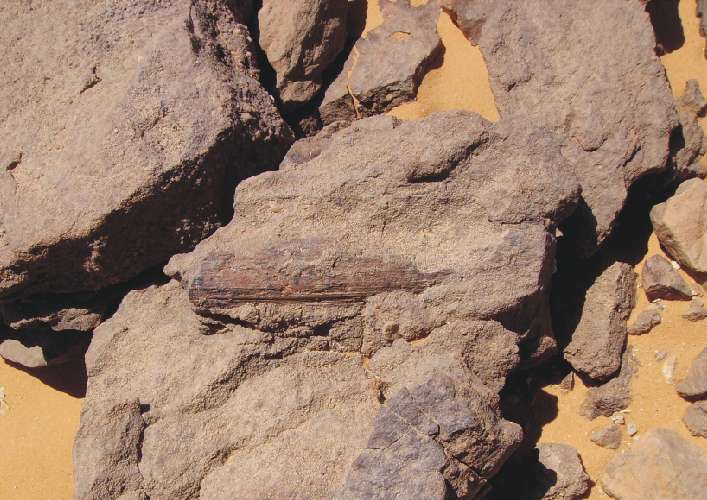 Several beds contain frequent plant remains including many different species. 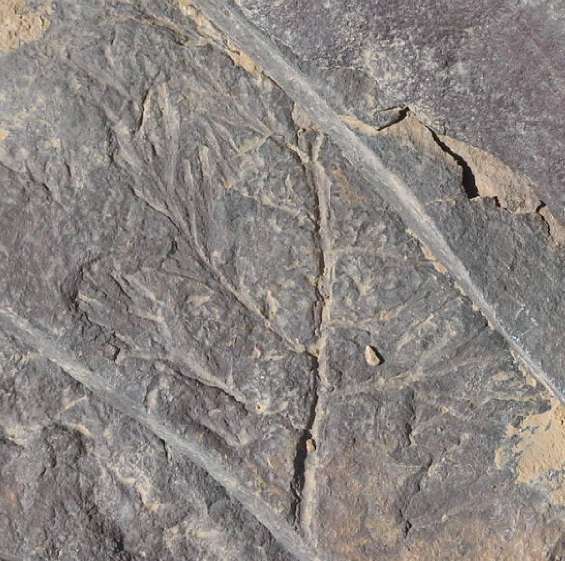 A rich flora was discovered in the Wadi Abdel Malik/Wadi Talh type area, including: Archaeosigillaria minuta, Lepidodendropsis cf. 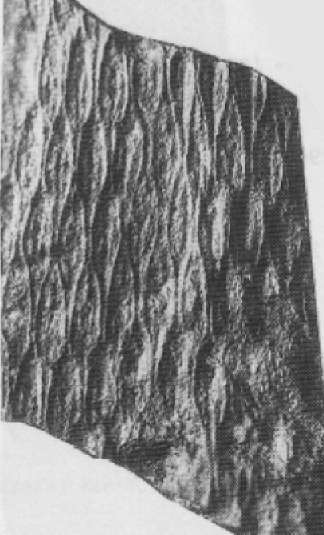 sinaica, Lepidosigillaria intermedia, Prelepidodendron lepidodendroides, P. rhomboidale, Rhacopteris ovata, Triphyllopteris gothani, Cordaites angulostriatus, Rhodea lontzenensis, Eremopteris whitei. 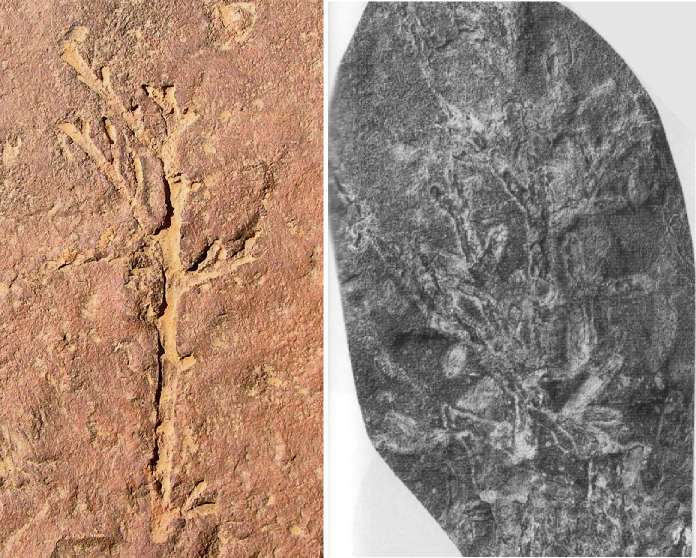 This flora proves a Tournaisian to Stephanian age of the Wadi-Malik Formation according to LEJAL-NICOL (1987). 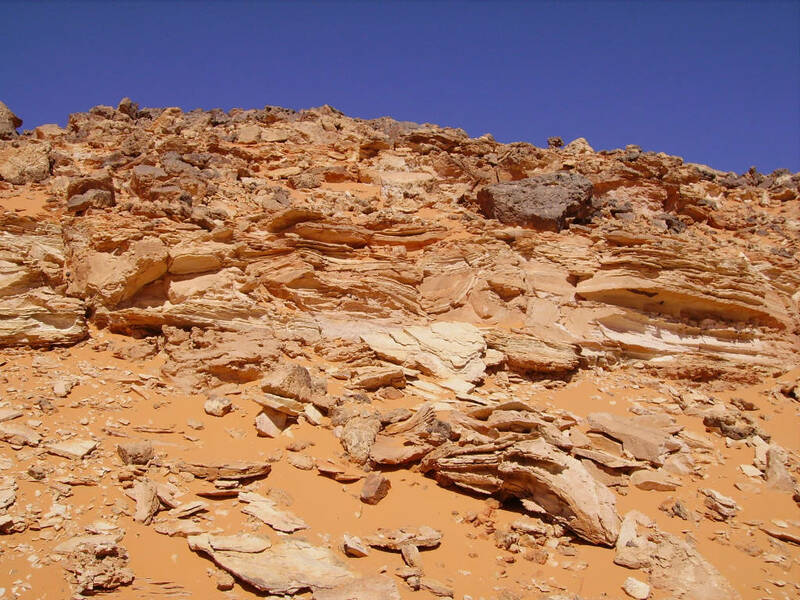 "The lowermost part consists of medium- to coarse-grained sandstone with grouped sets of small- to large-scale planar cross-bedding alternating with horizontally bedded medium-grained sandstone. 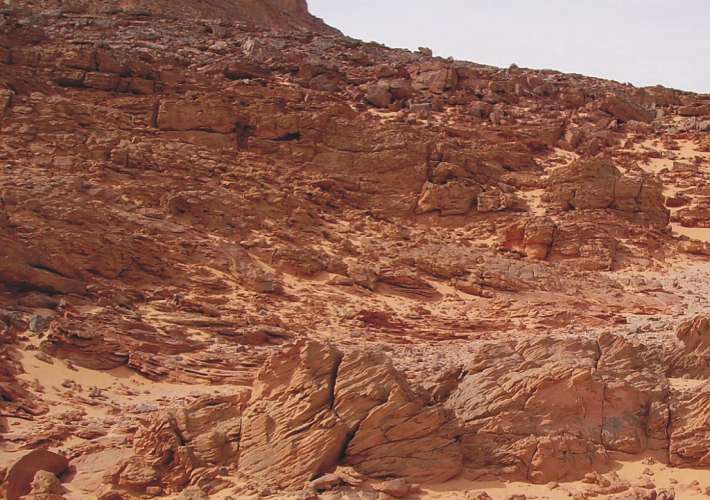 The percentage of horizontally stratified sets increases towards the top. 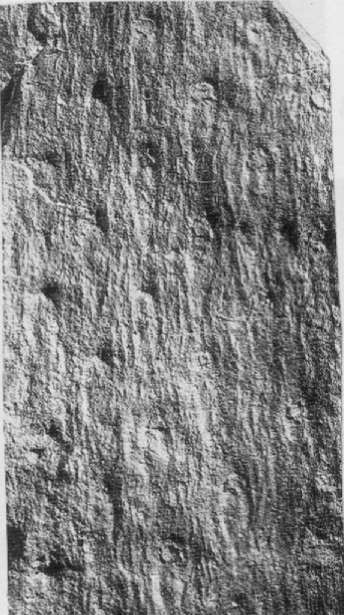 Overturned cross-bedding is less frequent in this facies. 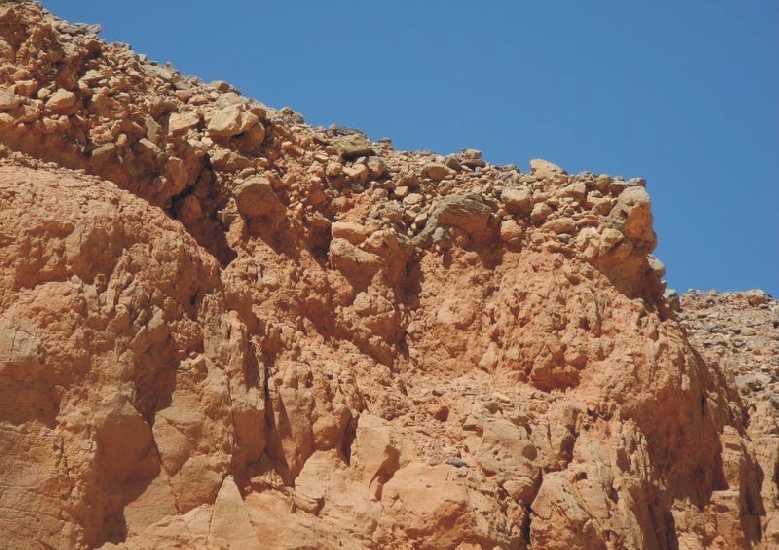 The facies type displays conditions of extensive deposits of braided river. 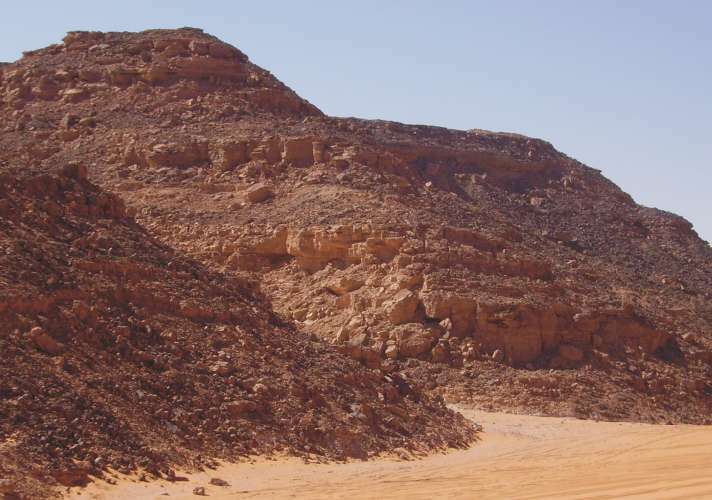 The second part of the succession shows a fining-upward sequence with a slighlty erosive base made up of medium- to fine-grained sandstone and intercalated thin laminated shaly siltstone. 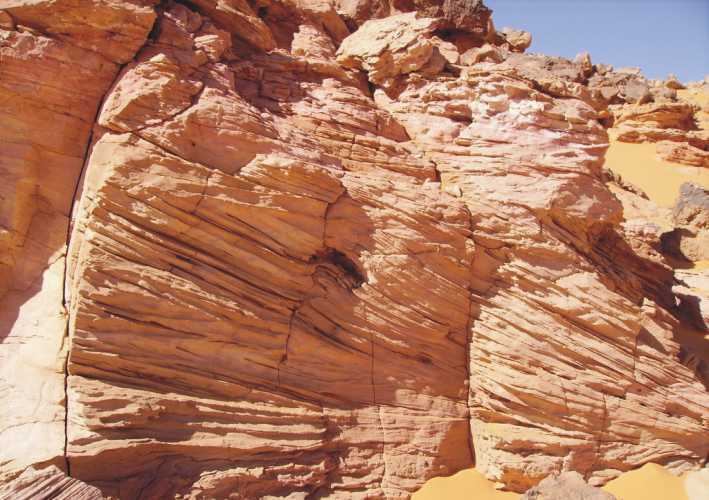 This cross-bedde pointbar sequence is 8 to 12m in thickness and is topped by fine-grained, partly even laminated overbank deposits, which lacally display pedogenetic features. 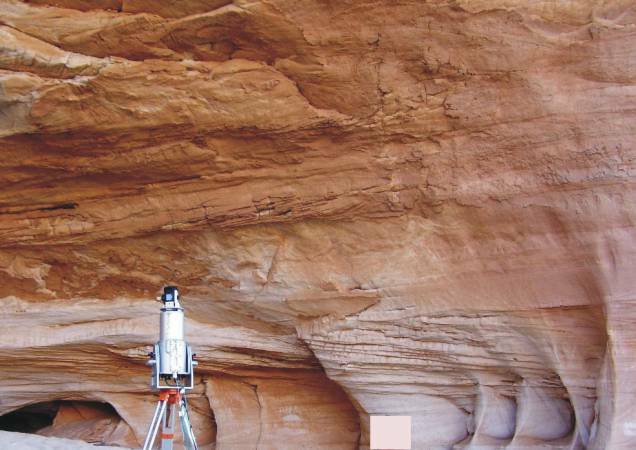 These facies represents deposits of high sinuosity rivers. 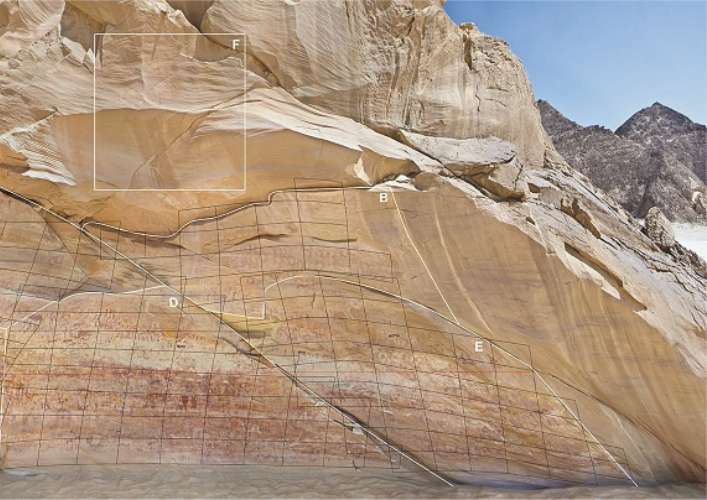 The third part consists of fine-grained sandstone with shaly siltstone intercalations and horizontal strata. 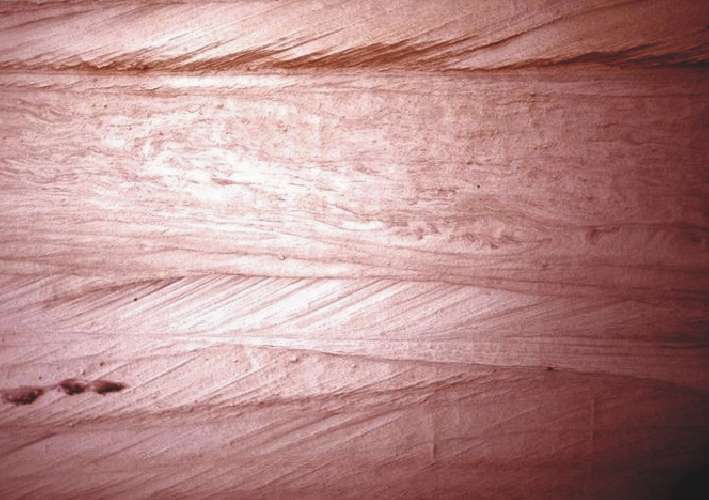 Main bedding types are ripple cross-lamination, even and wavy lamination and flaser-bedding. 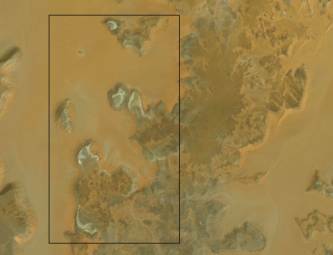 Parting lineation can be observed in the uppermost part of this unit. 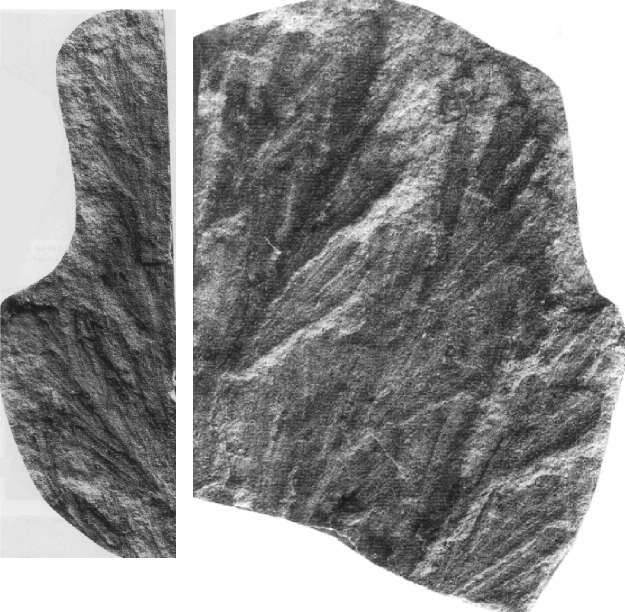 Ferruginous siltstone layers and reworked shale intraclasts within scour-and-fill structures occur. 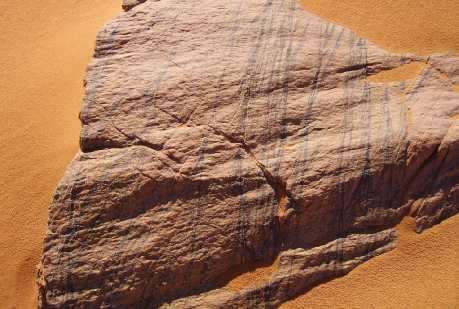 Asymetrical oscillation ripples are common on the bedding planes. 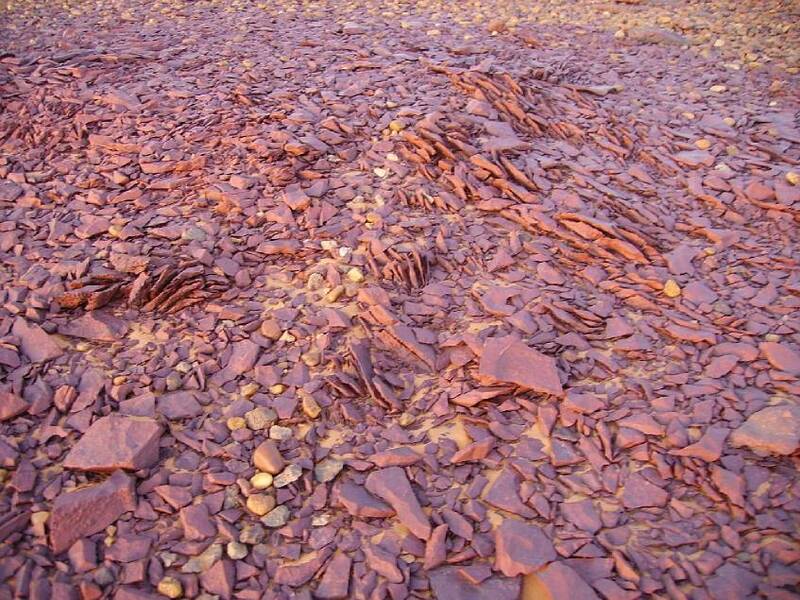 Tadpool nest ripples indicate shallow water conditions in a predominantly low energy wave-generated environment. 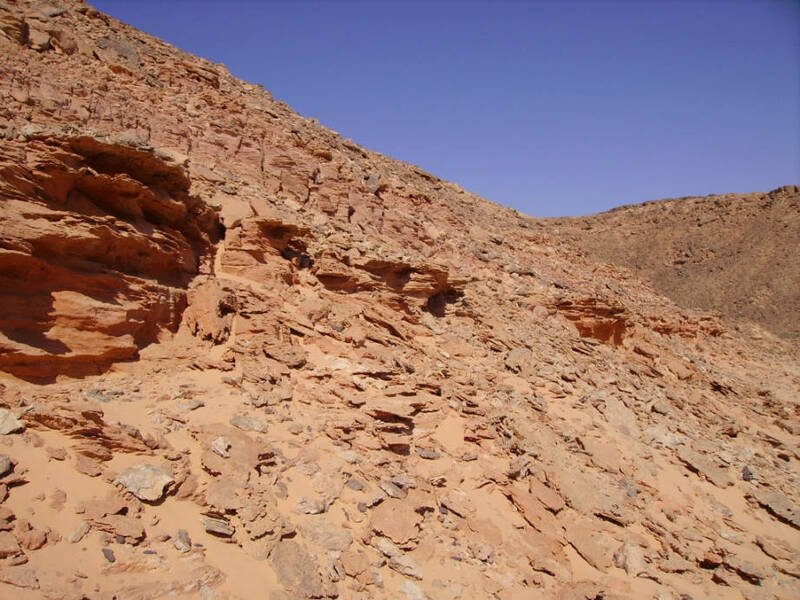 This facies can thus be considered as a marine influenced sedimentary environment in a transition zone from alluvial to coastal plains. 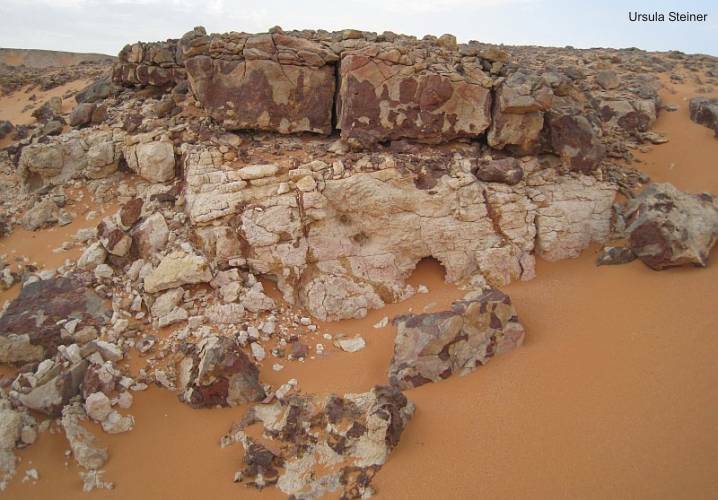 "The overlying strata are heterogeneous. 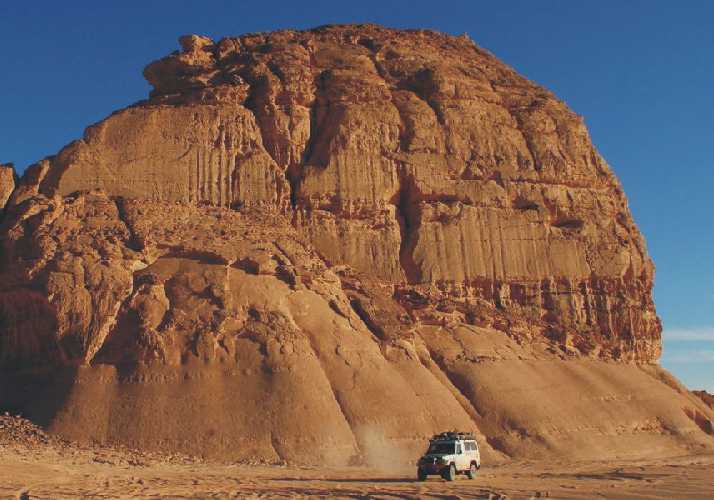 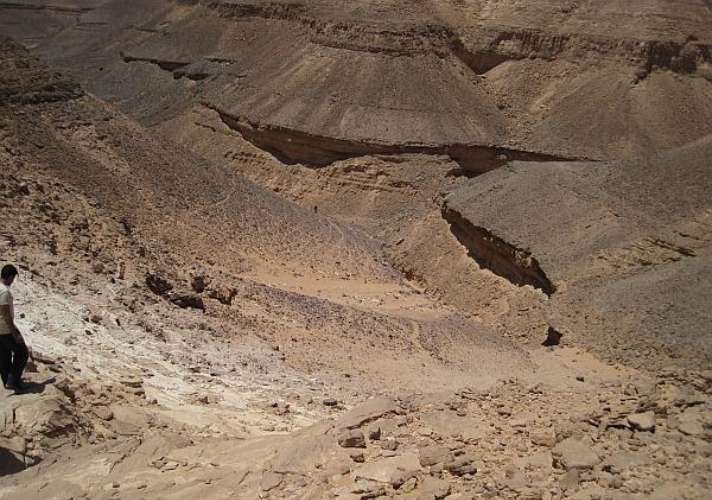 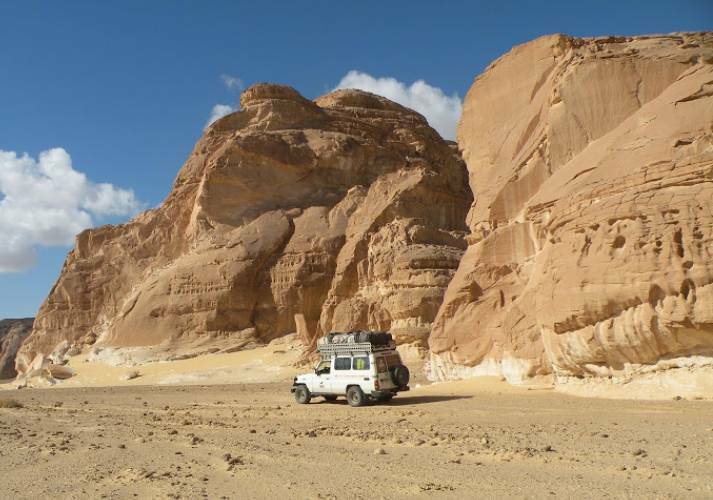 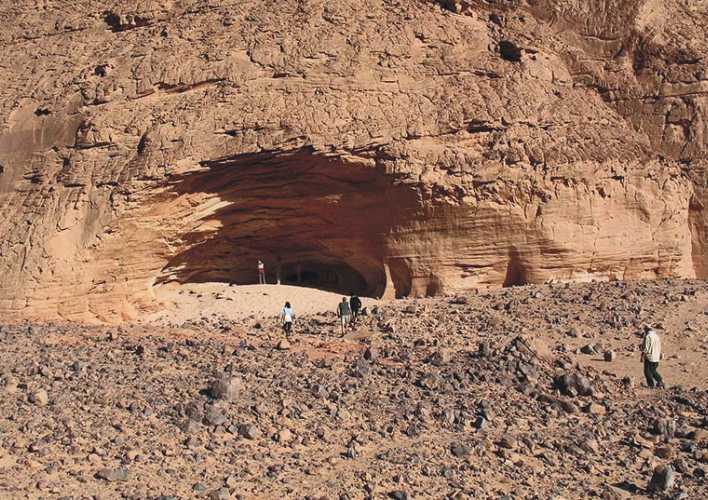 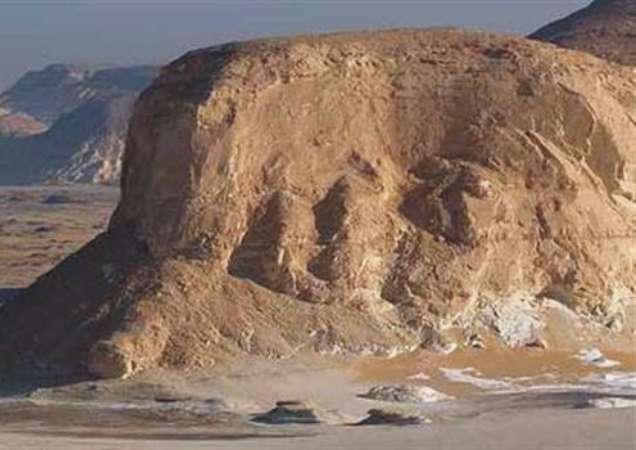 In north Wadi Abdel Malik, the Wadi Malik Formation underlies unconformably a 30 to 60 m thick bed of an chaotic sediment, consisting of clay, sand, gravel, blocks of older strata up to house size. 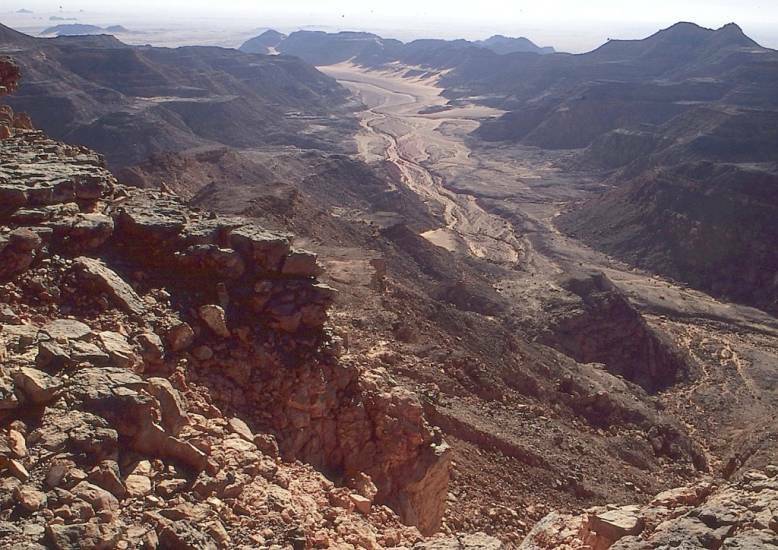 Southward, in the middle and southem parts of Wadi Abdel Malik and its side wadis, these strata are replaced by fluvial sandstone, conglomerate and sandstone with isolated blocks of older strata. 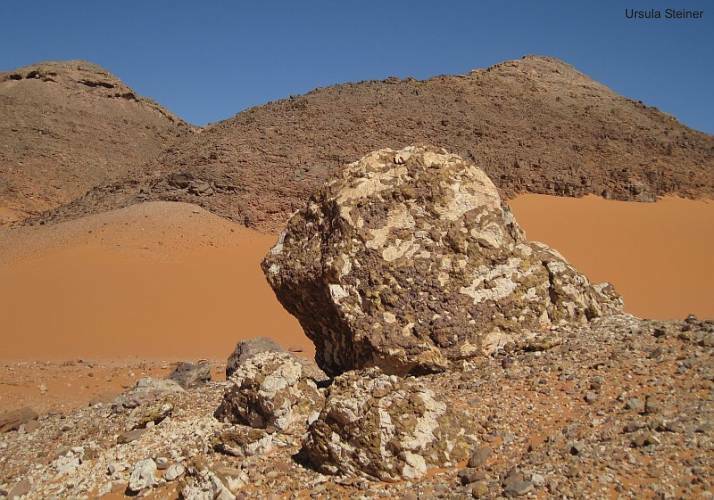 The thickness of this chaotic boulders (not glacigenic origin !) 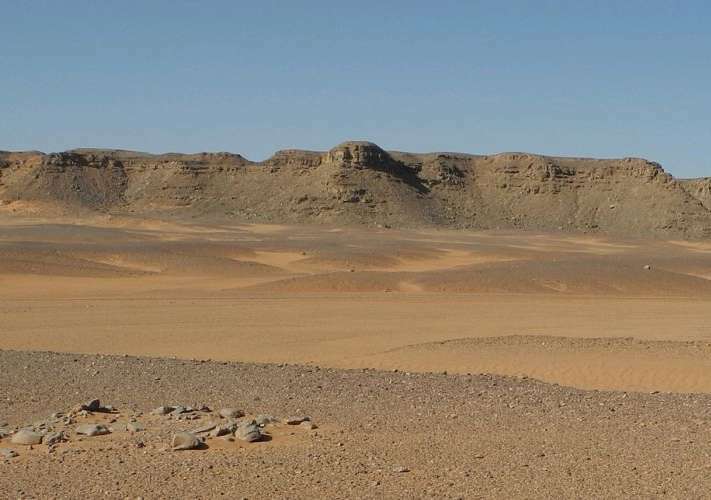 unit is several tens of meters. 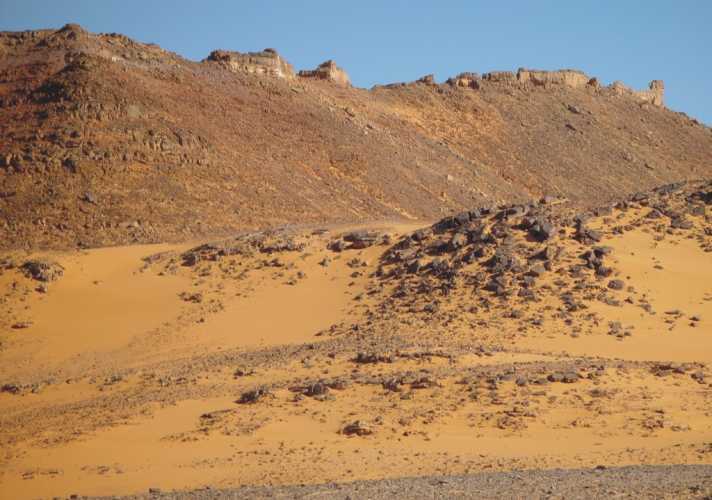 It is overlain by cross- and parallel-bedded sandstone and varve-type shales containing plants of Stephanian age in the central parts of the Abdel-Malik plateau, for example Cordaites angulostriatus GRAND'EURY, was found in sandstone directly overlying the erratic boulder unit." 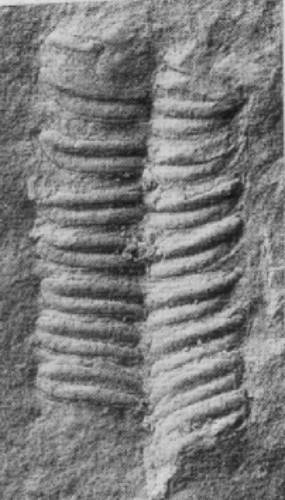 Weichselia -----> Paleoweichselia halfa n.sp. 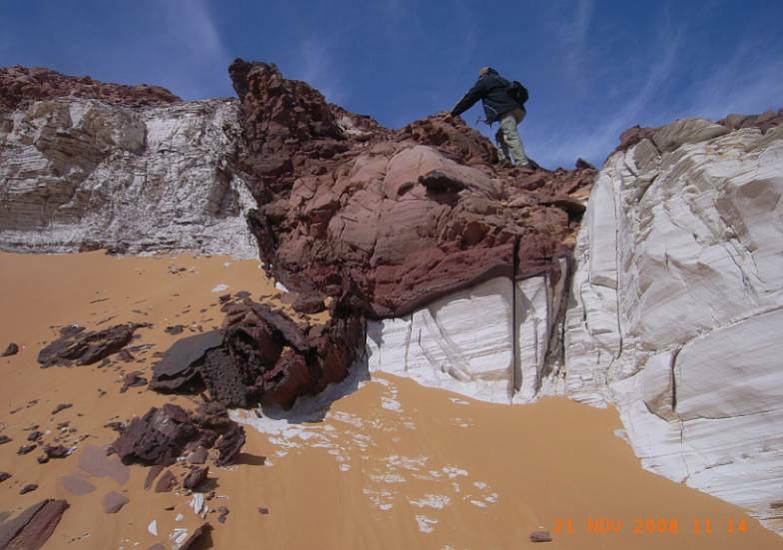 It looks as if at least the bleaching of the sandstones was caused by hydro-volcanic activity. 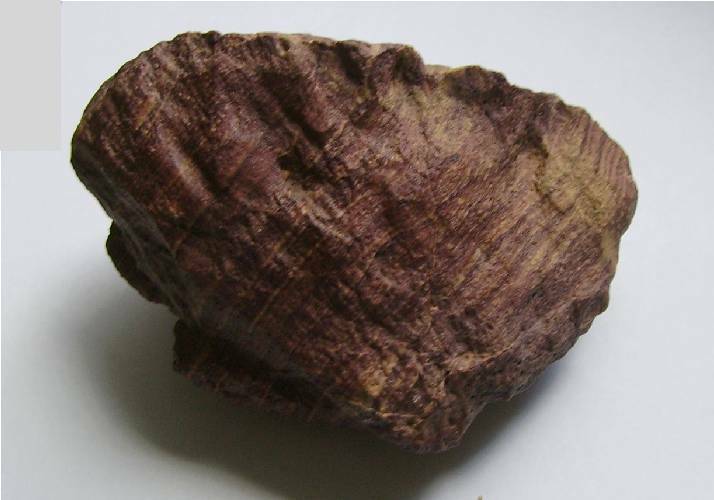 This occurs on injective and independent of the stratification. 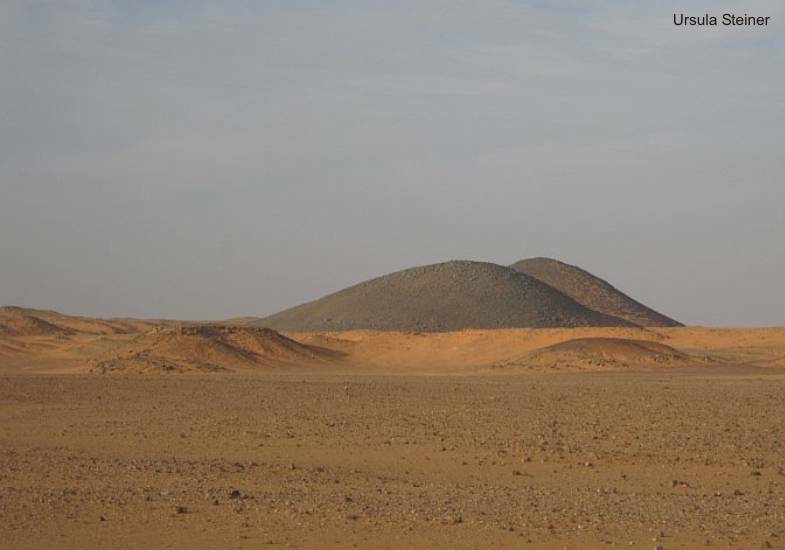 The Kemal-el-Din Plateau has a simple structure, but has a subvolcanic overprint that also spread is in the surrounding ranges. 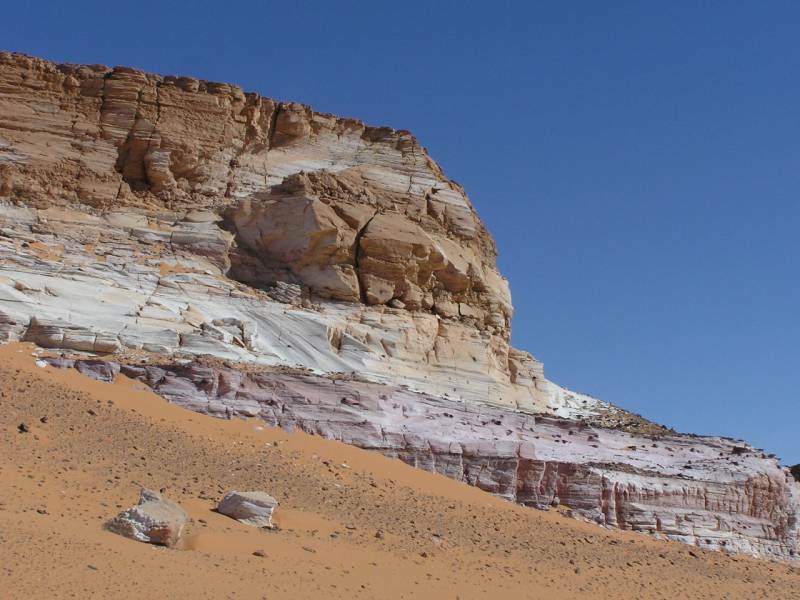 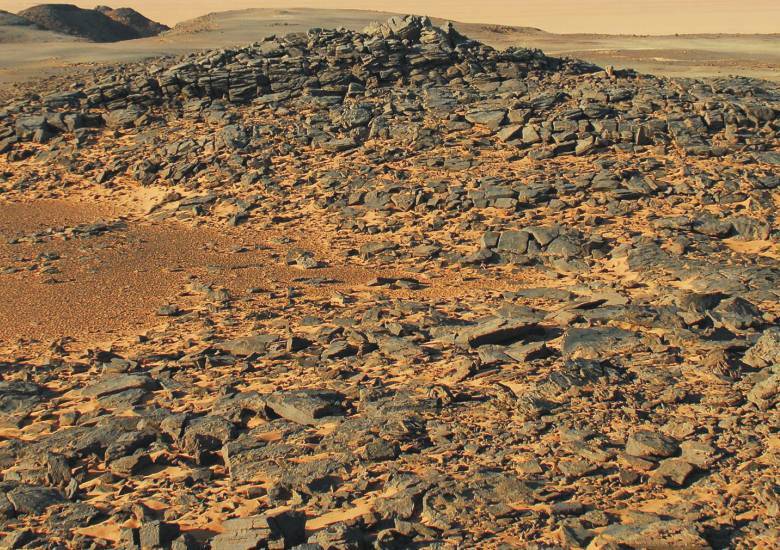 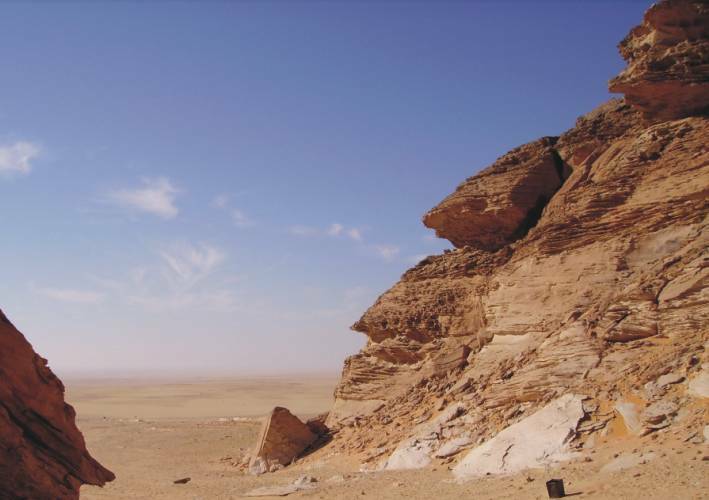 The structural-geological composition is similar to the northern Abdel-Malik plateau. 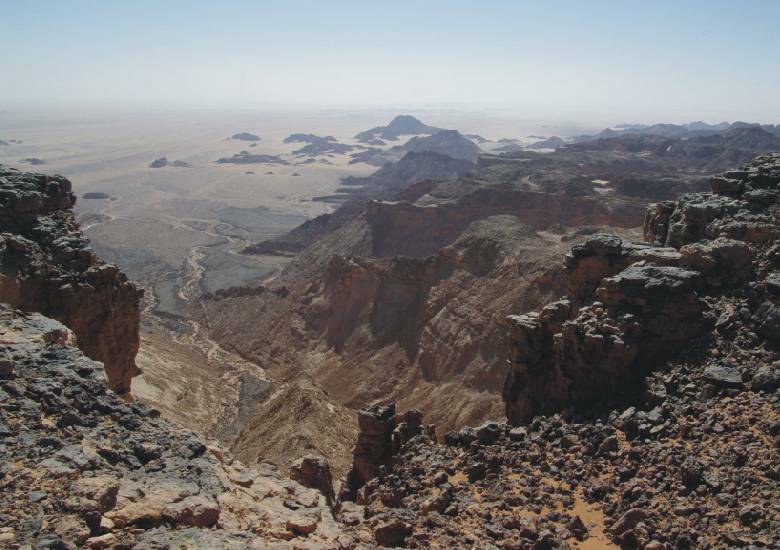 The towering plateau (+ 1000m SL or more) is bounded on the north by the Wadi Assib (with the Aqaba passage); in the east of the foothills of the Great Sand Sea and the south and west of the basement high position. 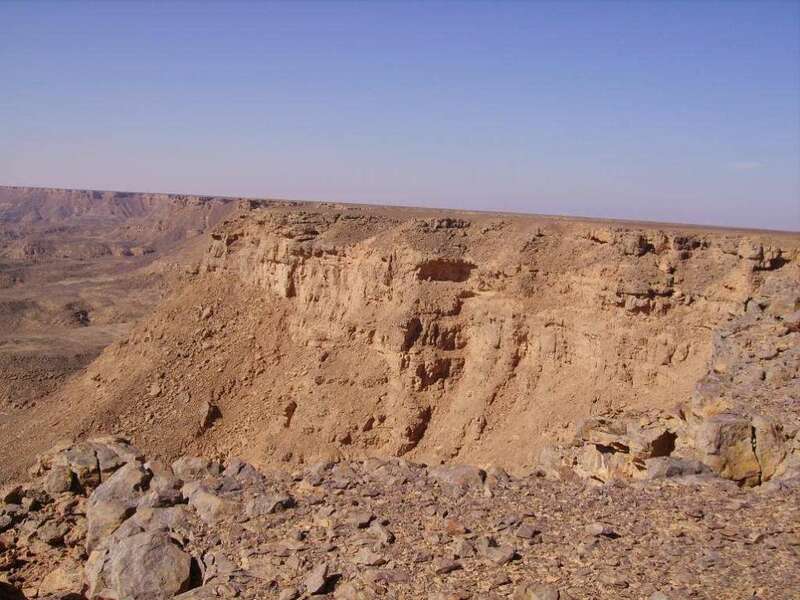 The eastern and southern edge of the plateau is cut by numerous deep wadis. 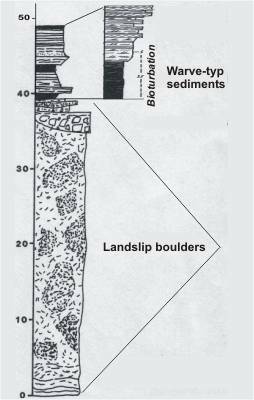 A stratigraphic assignment of up to 400m (or more) compact sandstone sequence is difficult, because no fossils are found. 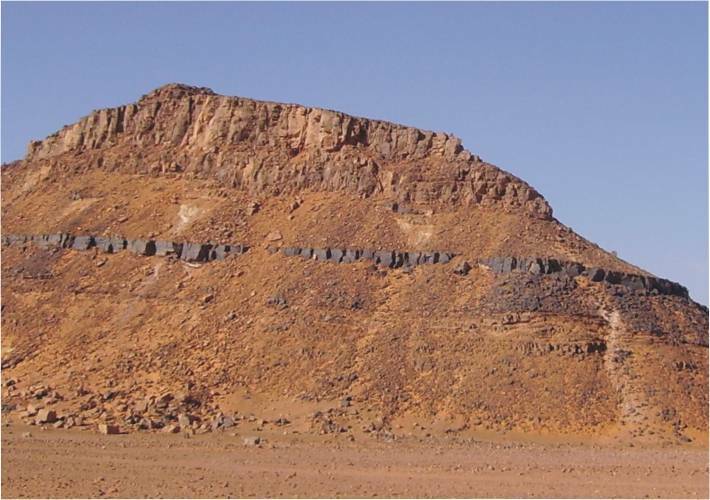 Significantly cross-stratified sandstones in the footwall of the sequence can be classified similarly to the northern plateau as Silurian. 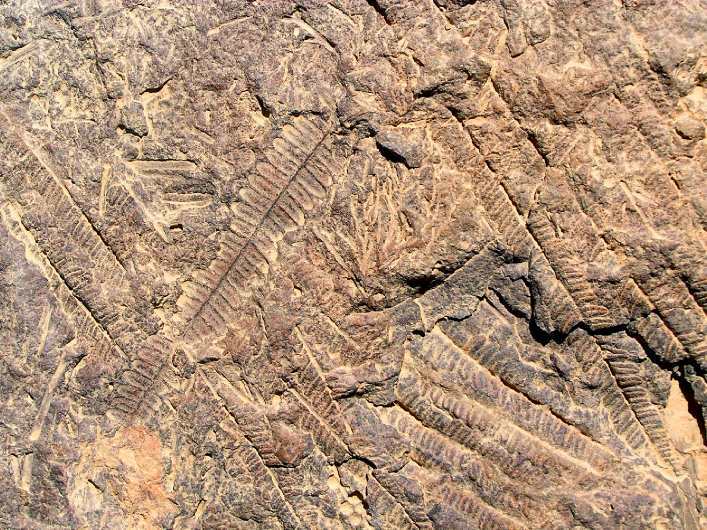 The most of the sequence should be Devonian. 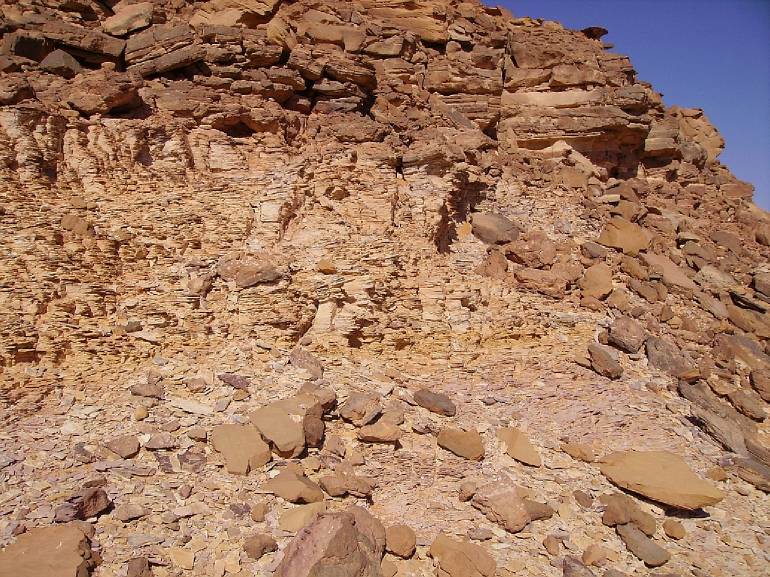 The postulated Cretaceous sandstones are it not, because in eroded deeper layers of the plateau (Wadi Wassa) there Carboniferous sediments. 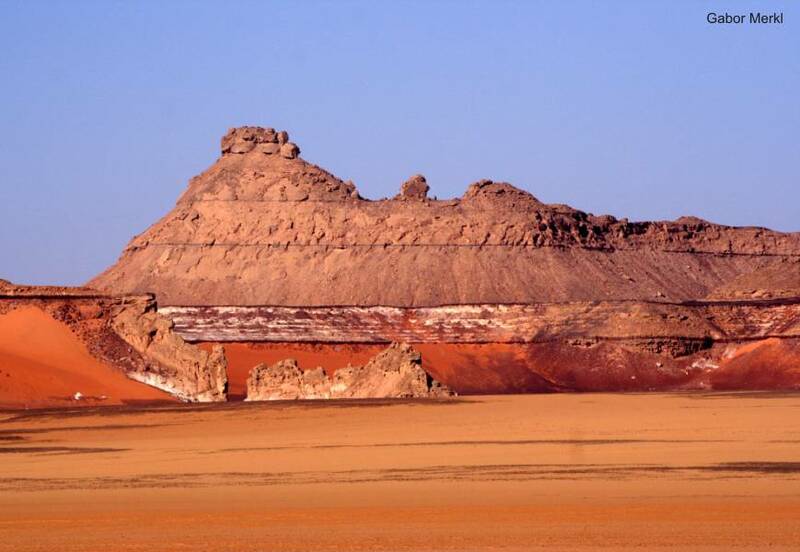 Questionable are sediments the so-called Gilf Kebir Formation (early Cretaceous age) in the Wadi Wassa and south of it (Kemal el Din monument and surrounding). 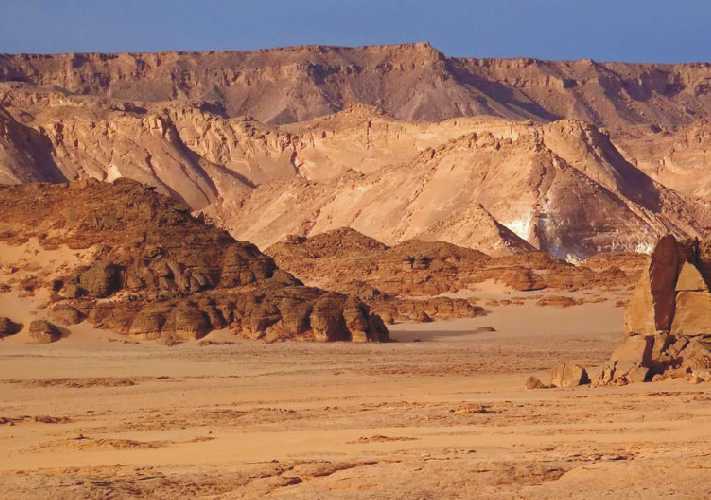 This also relates to corresponding sediments in Aqaba passage (see below). 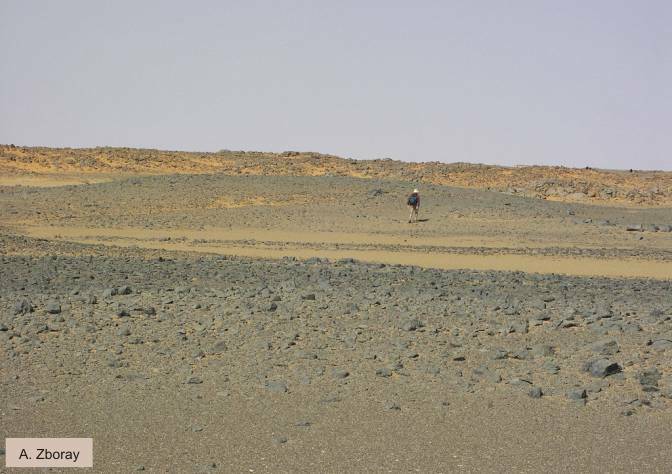 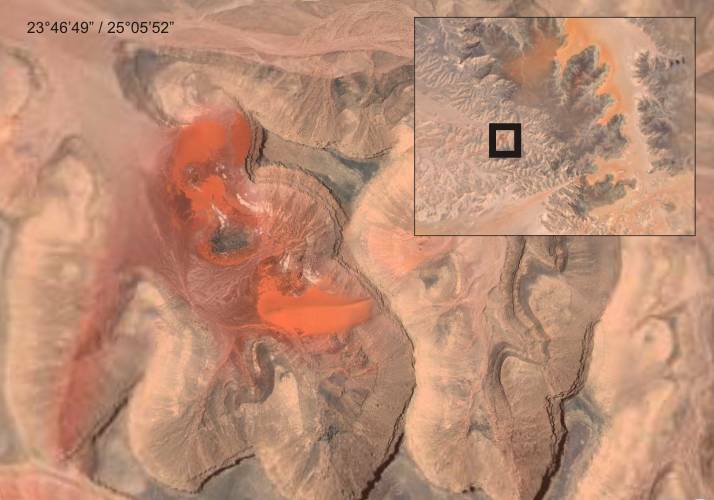 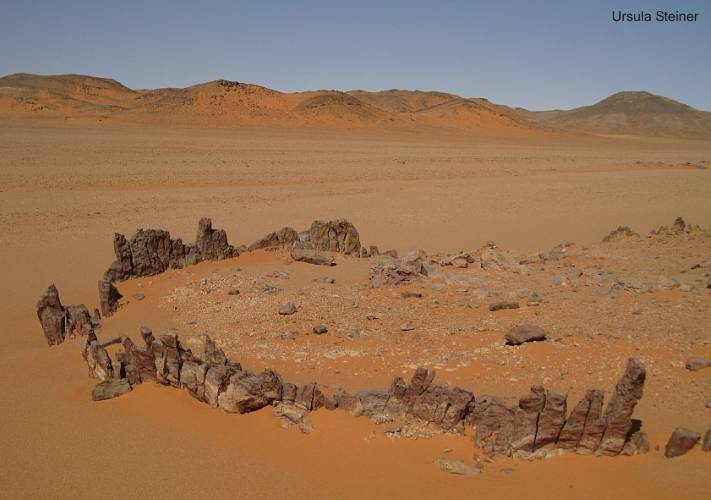 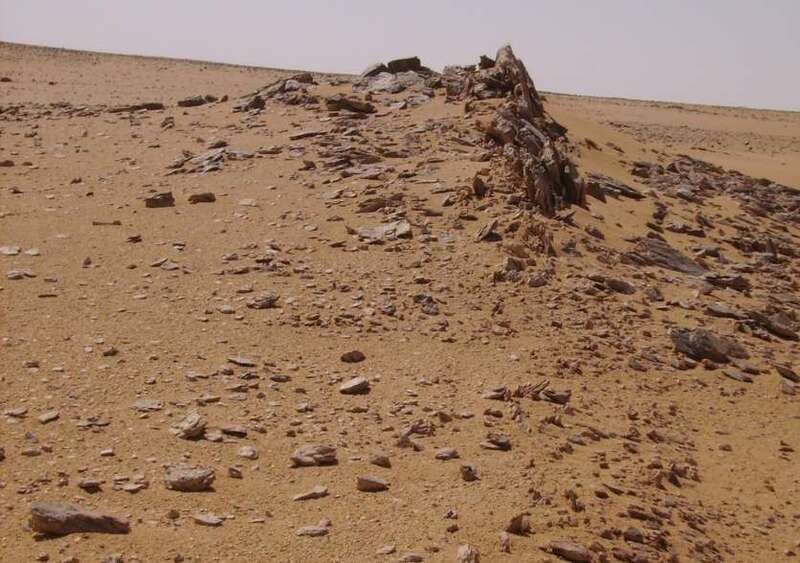 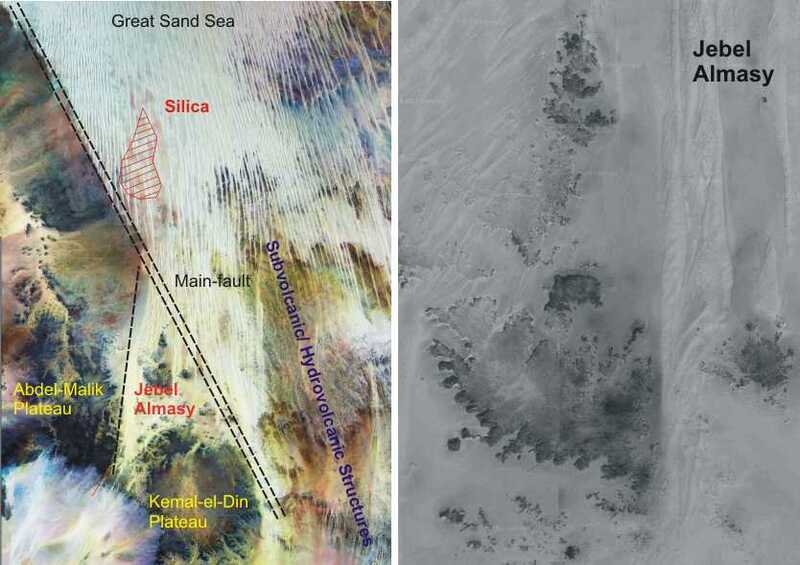 The basement of the "East Sahara Ghost Craton" is located very close to the surface. 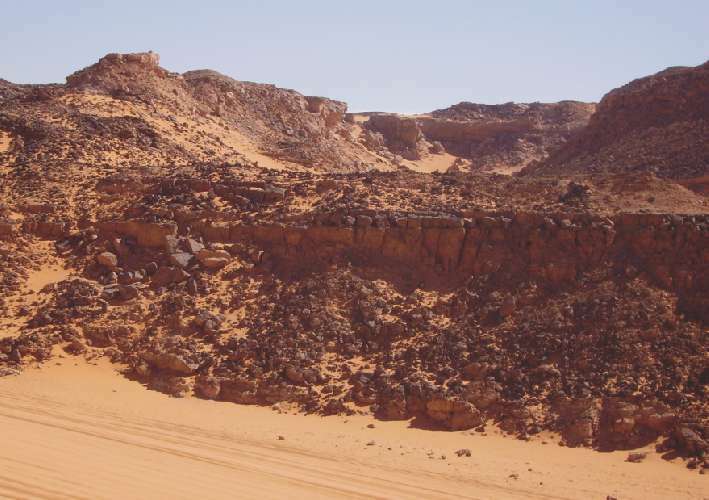 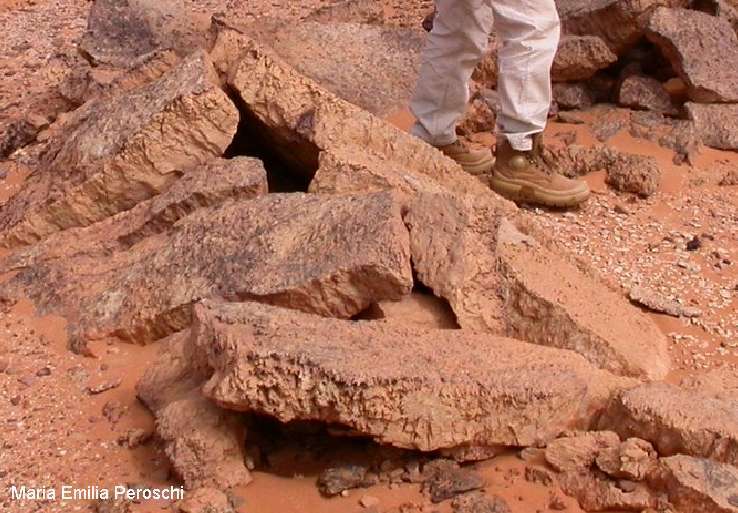 On the widespread erosion surfaces in the foreland but are outcrops very rare because it is covered by desert sand. 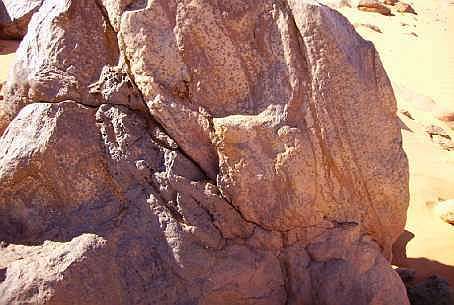 Important exceptions are observed at the structure "Eight Bells". 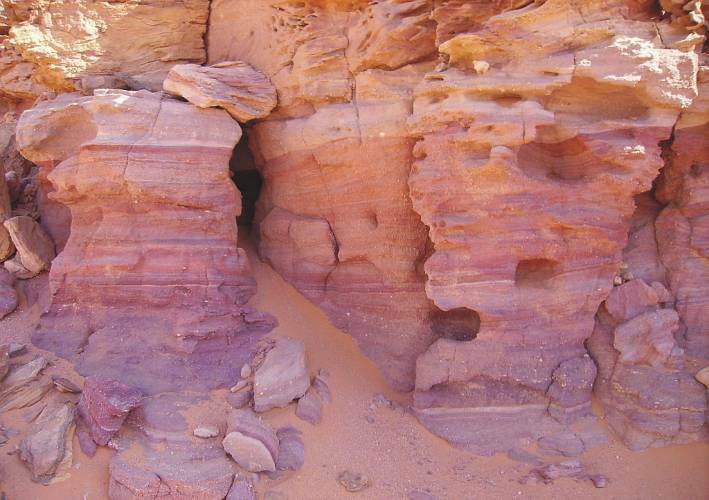 Typical are cross-bedded Silurian sandstones in the footwall of the thick sandstone sequence of the plateau. 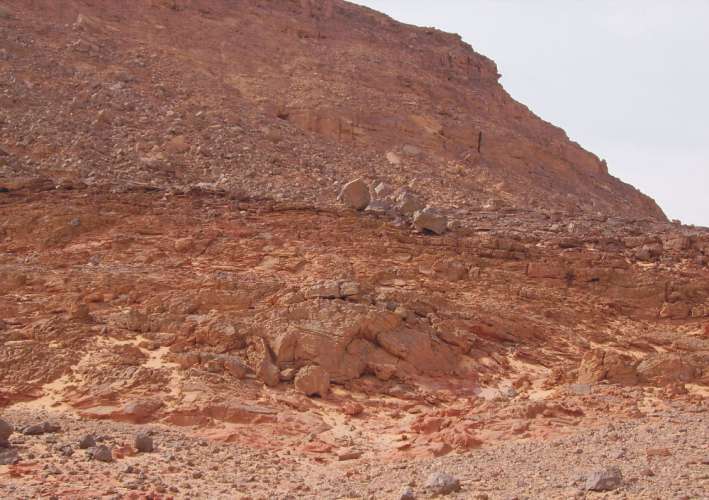 Devonian sandstones are in the Aqaba passage exposed. 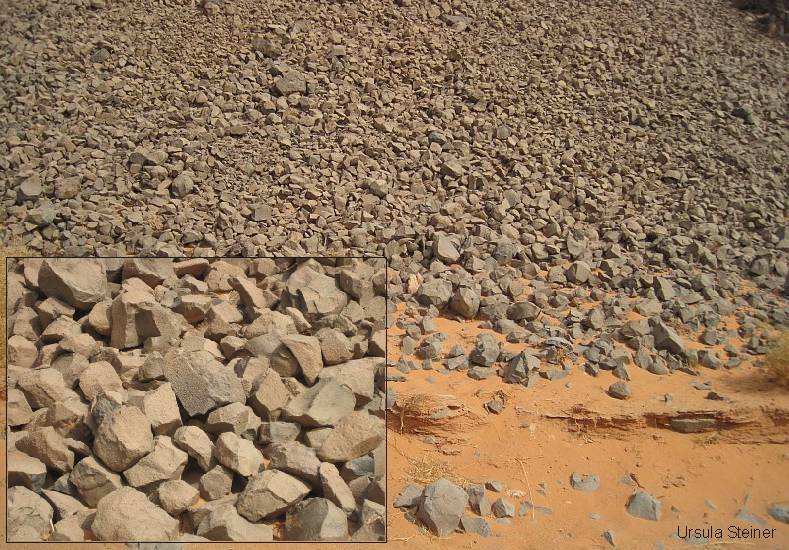 Some details on images, presented in the Internet, show sediments in a facies which comparable is with sediments which are demonstrated in the southern Clayton craters. 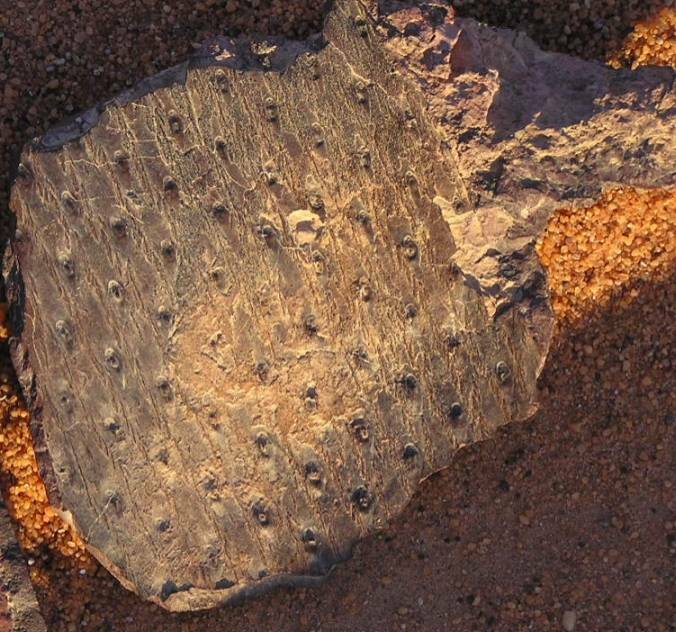 They contain abundant imprints of Carboniferous plants. 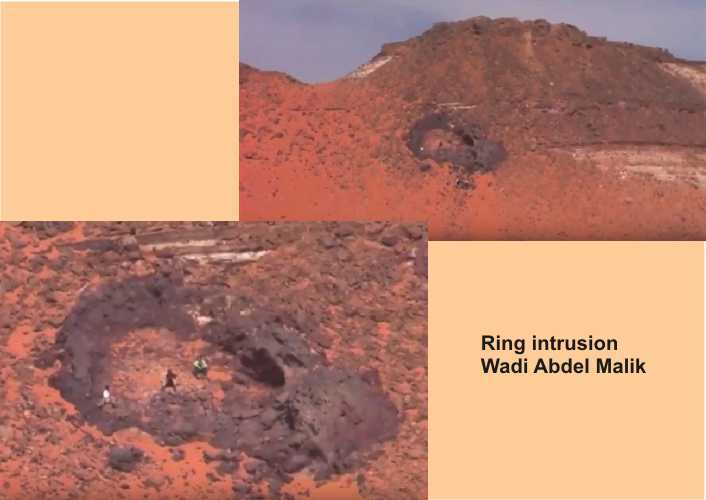 Since the latest discoveries of plant imprints (Ursula Steiner) is proved that in the Wadi Wassa actually exist Carboniferous deposits. 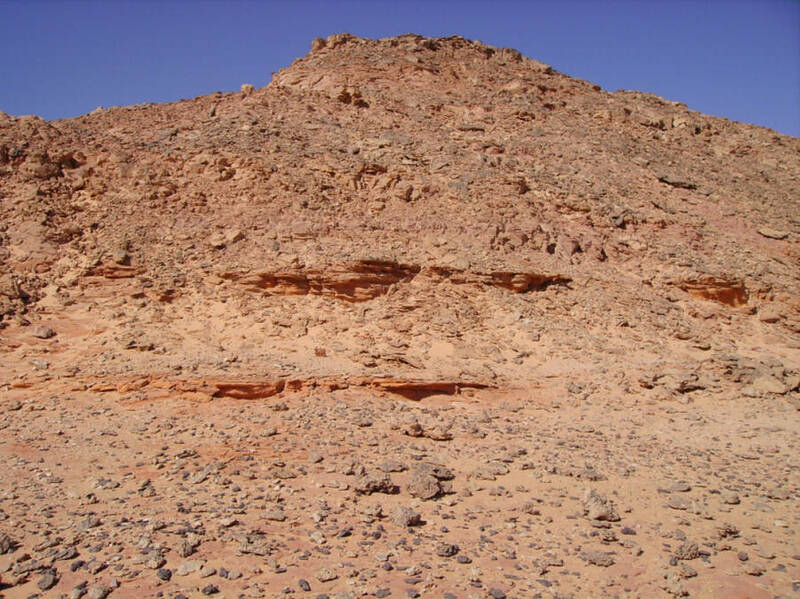 They lie above Devonian sediments on eroded slopes of the plateau or as debris on the bottom. 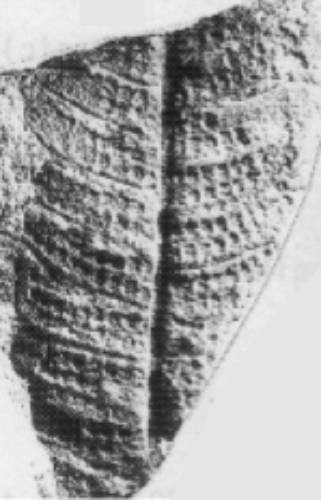 This relativized the few finds of Lejal Nicol from the 1980s, which were classified as early Cretaceous age (Phlebopteris, Podozamites). 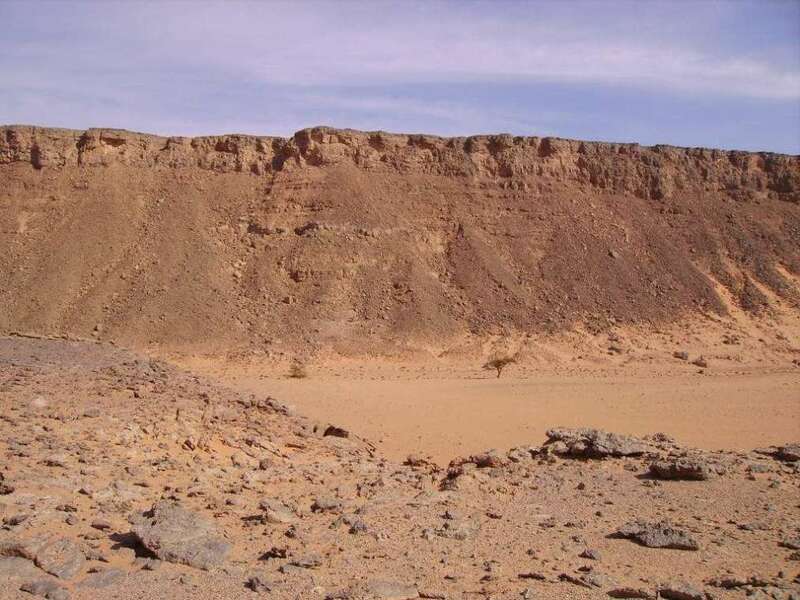 Another place with excellently preserved Carboniferous plants imprints is a large crater-like structure in the southern direction (Clayton Craters). 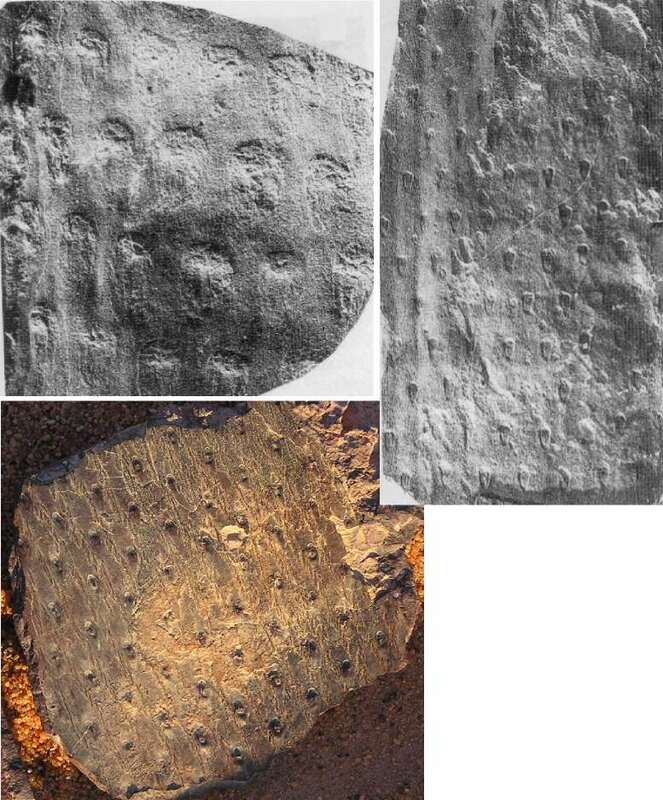 Such finds are also mentioned in the literature on the locality Peter & Paul, but not documented. 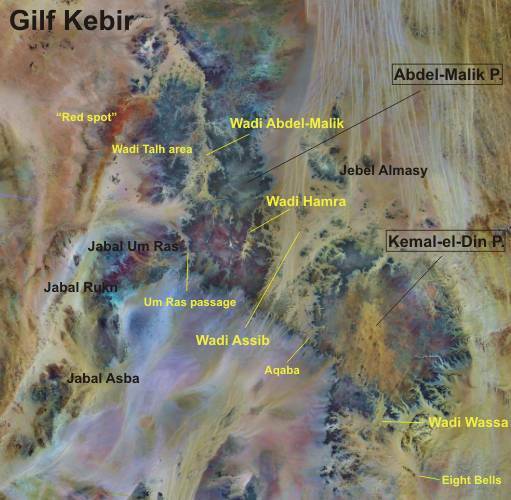 The Wadi Assib separates both Gilf Kebir plateaus morphologically. 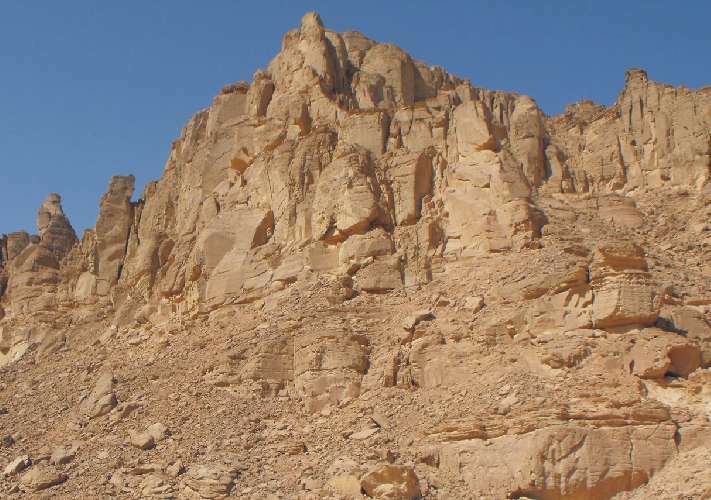 The Aqaba passage therein is an small eroded valley. 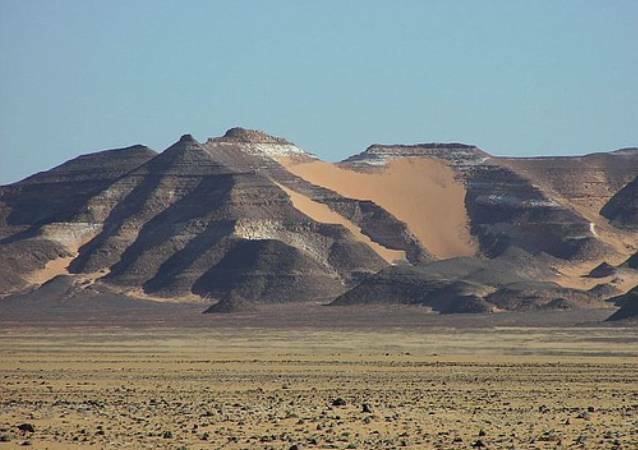 It should be filled with Early Cretaceous layers of the Gilf Kebir Formation. 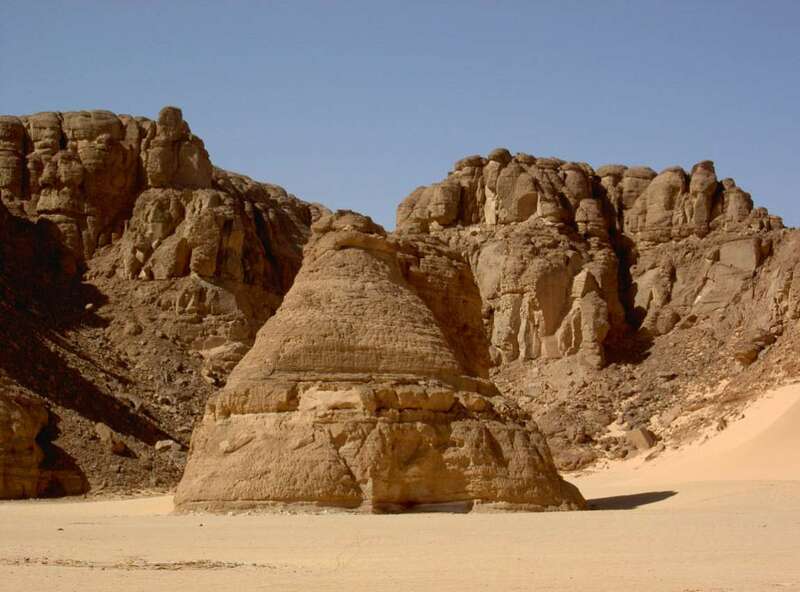 "The Aqaba passage is the type area. 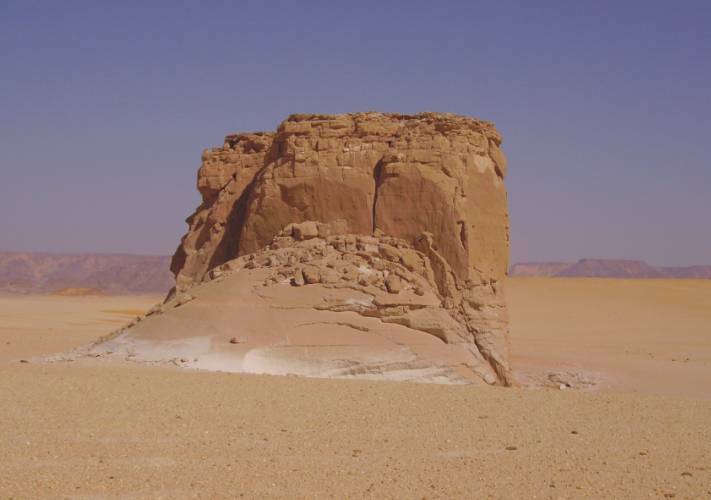 Here rests fluvial, deltaic and partly near-shore marine sandstone unconformably on an eroded relief. 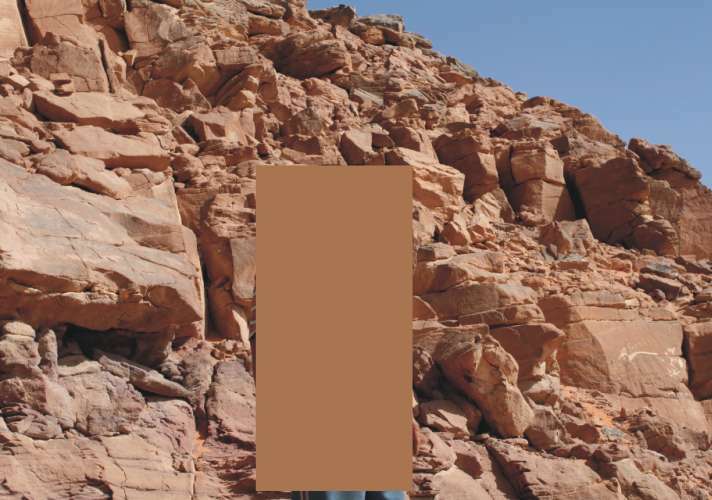 But, this unconformity between them is not detected up to now. 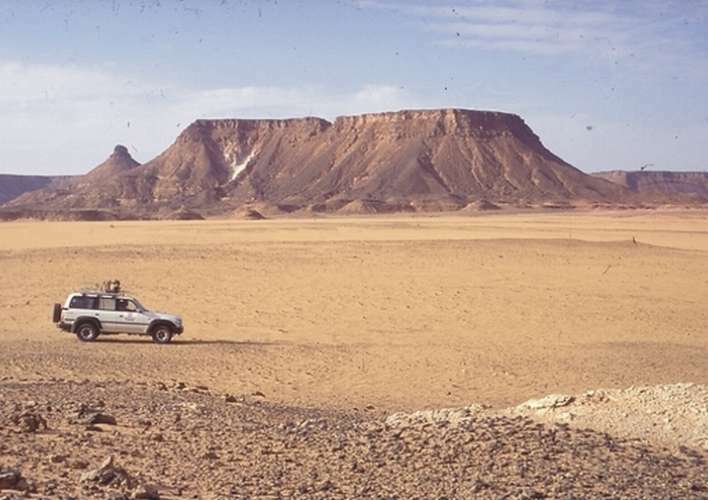 At the eastern edge of the Gilf Kebir toward the Abu Ballas area, the Gilf Kebir Formation interfingers with the shallow-marine Abu Ballas Formation. 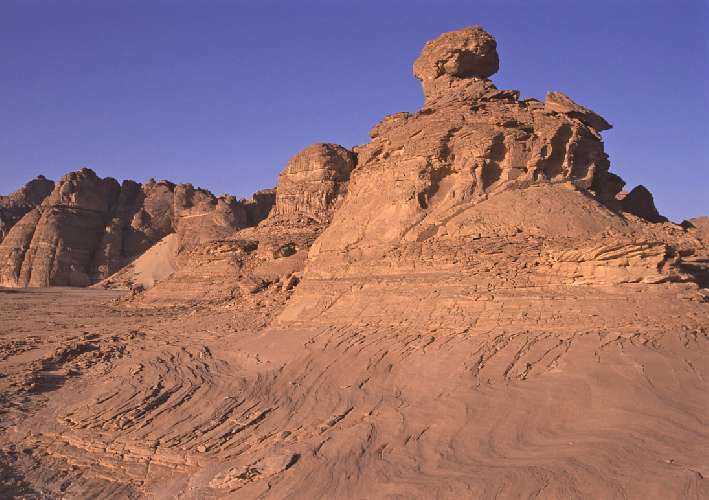 Within the Aqaba passage and directly north of there, along the northern edge of Abdel-Malik Plateau, northeast of the Wadi Abdel Malik as well as at the western end of Wadi Wassa, several horizons contains flora. 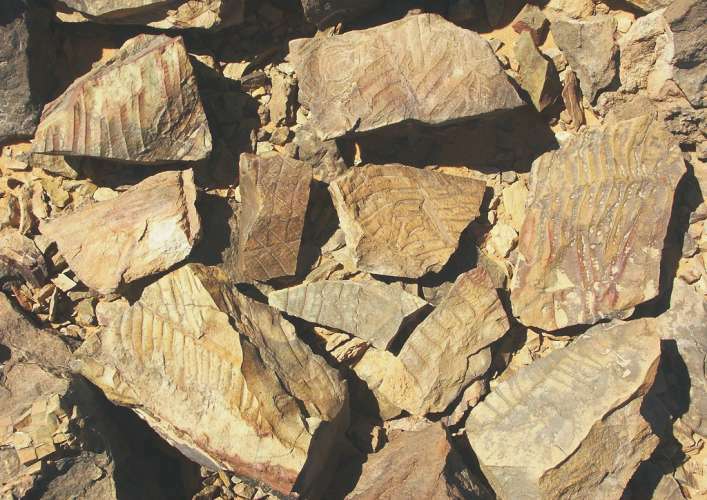 Fine-grained sandstone and siltstone locally contain an abundant flora of ferns and other plants of the Early Cretaceous age (among "Cladeophlebis", "Phlebopteris", and Weichselia reticulata STOCKES & WEBB)." 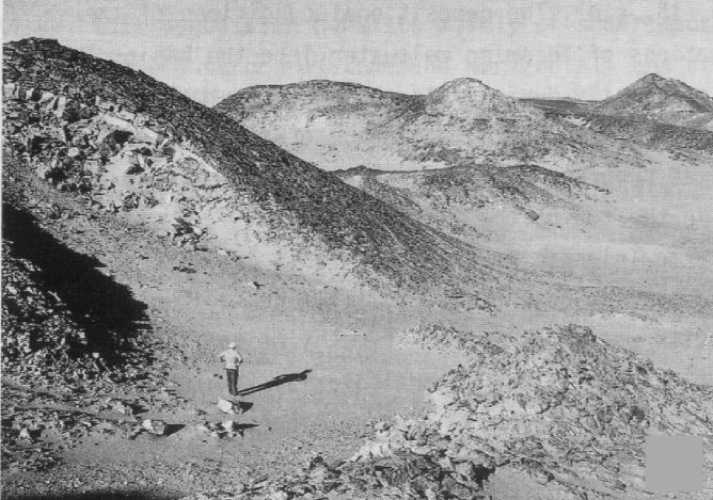 From the type area (Aqaba passage) and the other locations are available in the literature illustrations of plant-finds with the corresponding determination by LEJAL-NICOL, 1987. 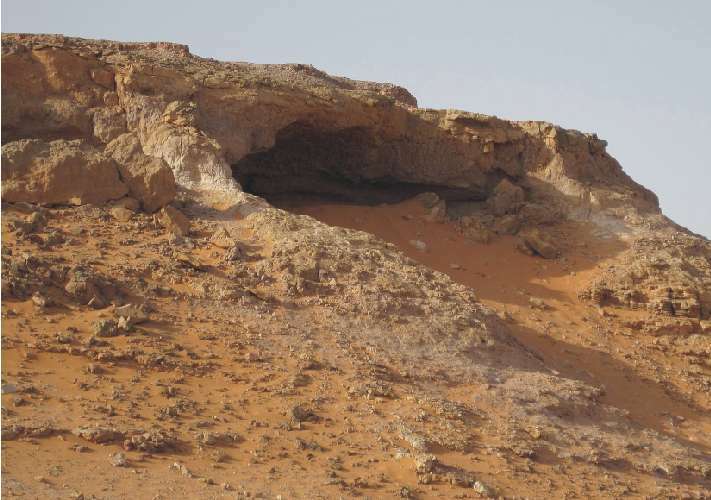 There is however unfortunately no exact statements to the places of the discovery. 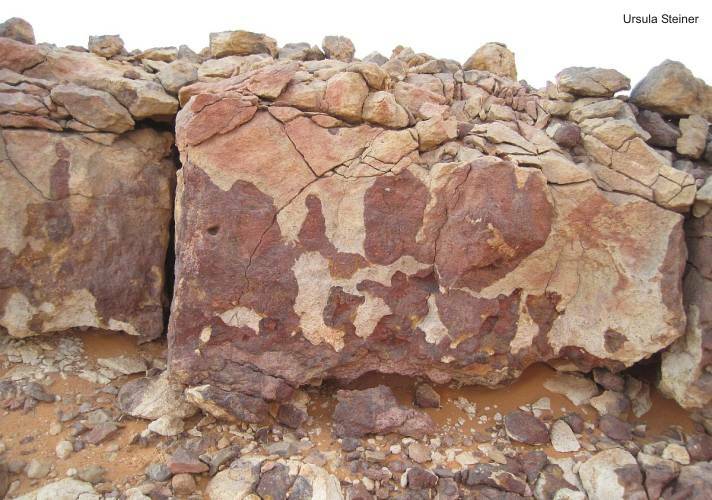 It also lacks verifiable lithostratigraphic profiles in the literature. 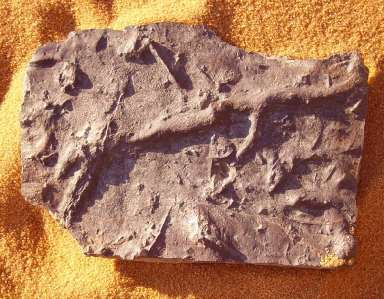 The plant imprints are in such poor condition that the determination and classification as Mesozoic fauna are questionable. 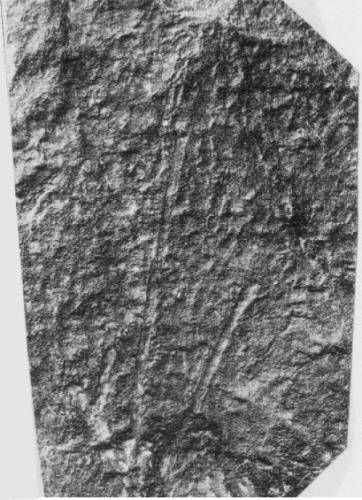 The determined Weichselia reticulata can also be the new Carboniferous Paleoweichselia halfa n.sp. 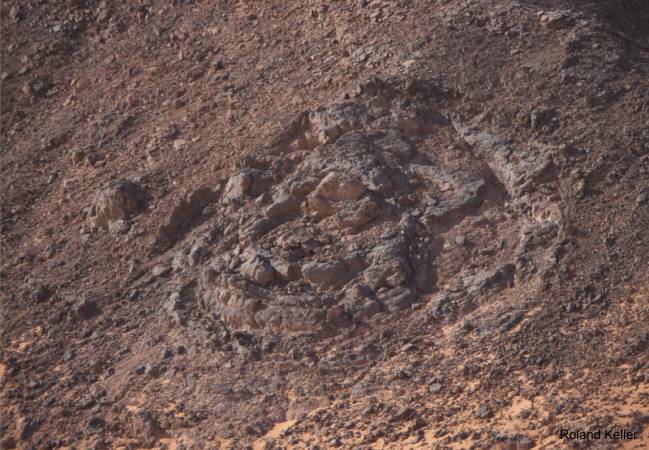 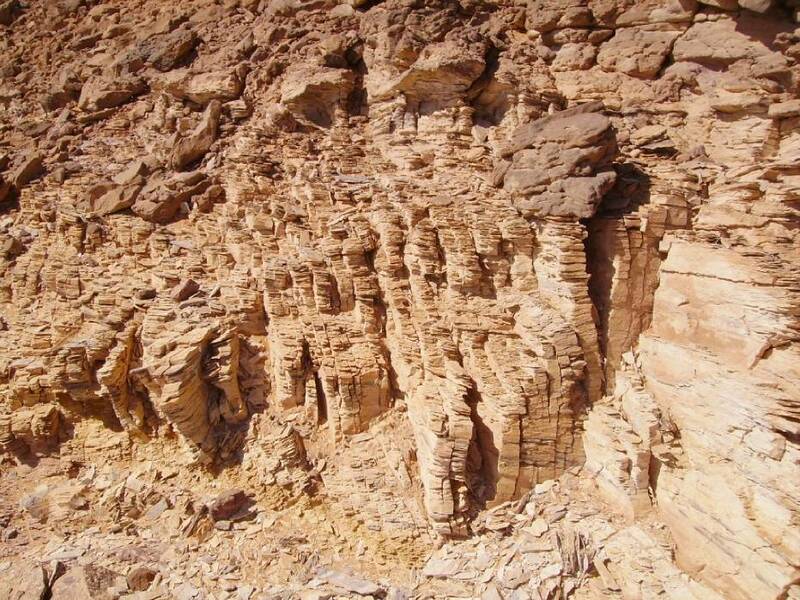 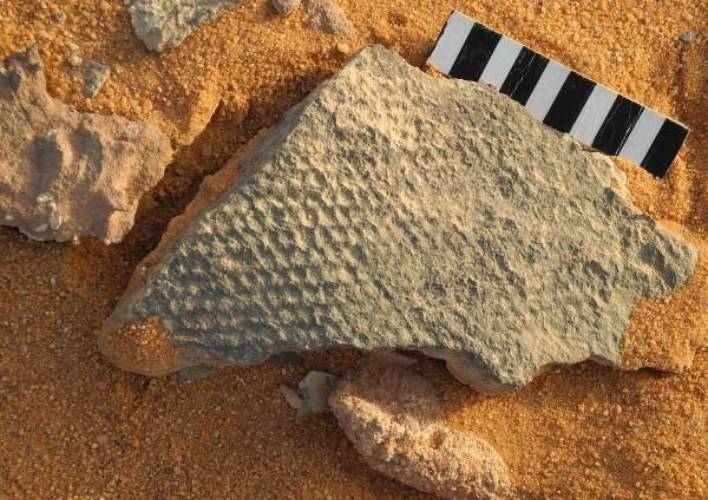 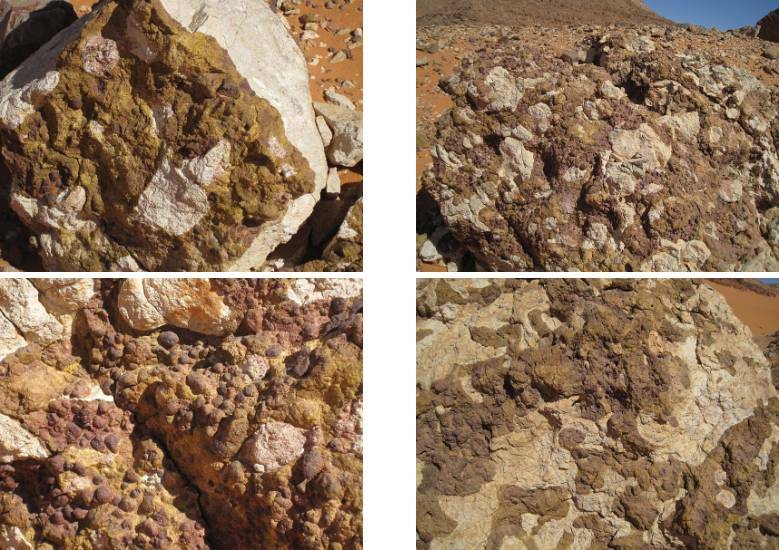 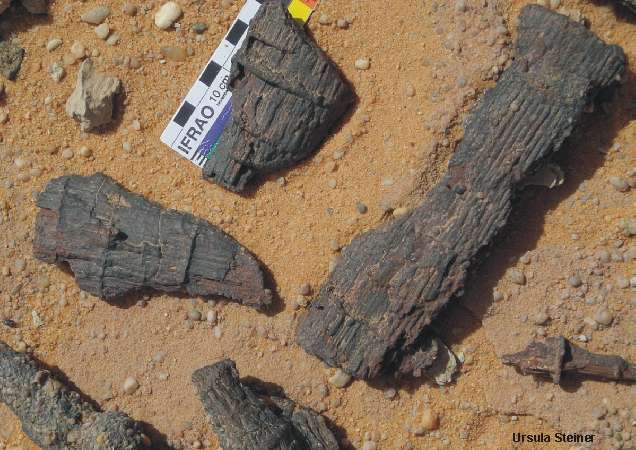 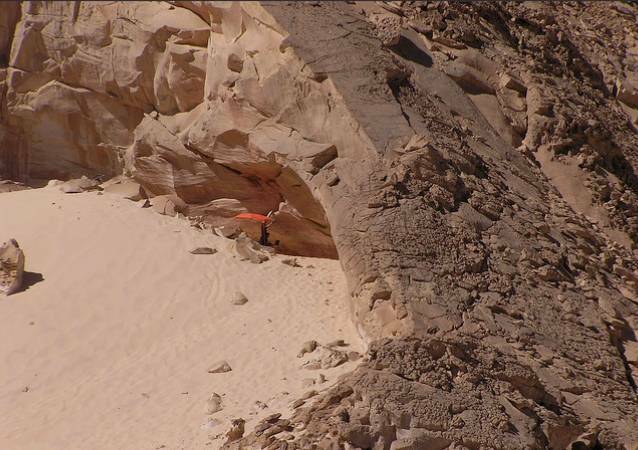 Aqaba: Are this the mysterious Cretaceous strata ? 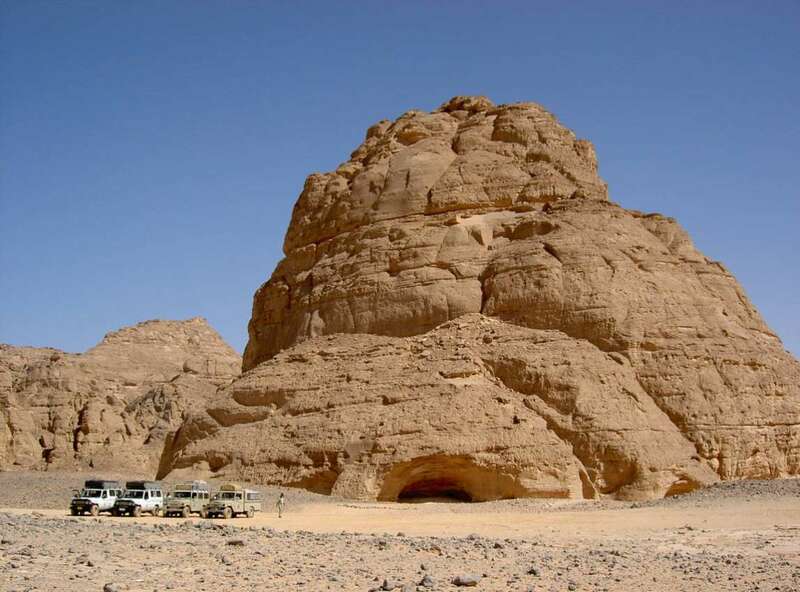 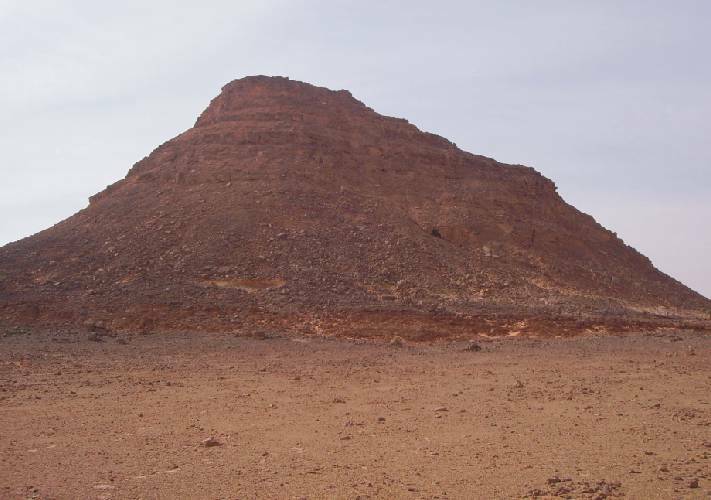 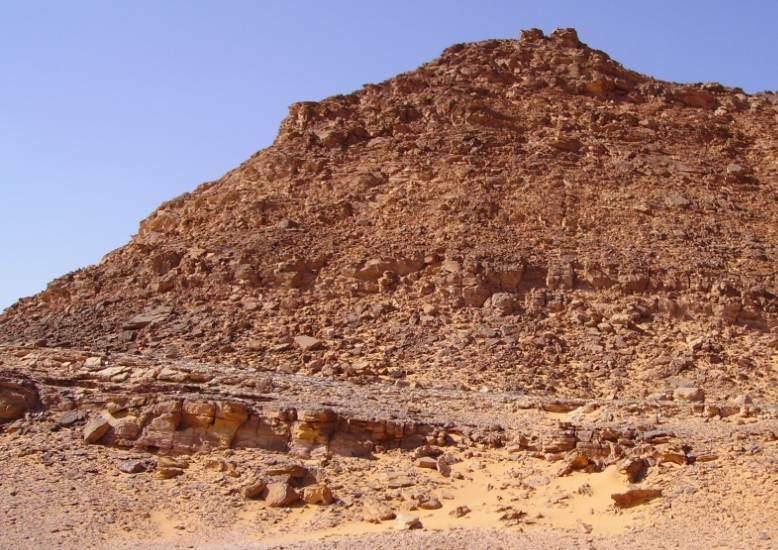 The Jebel Almasy is an isolated structure of the Gilf Kebir. 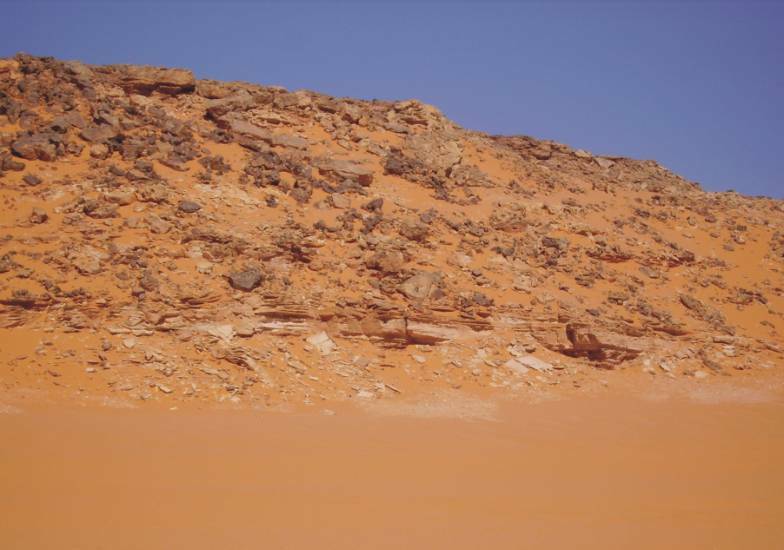 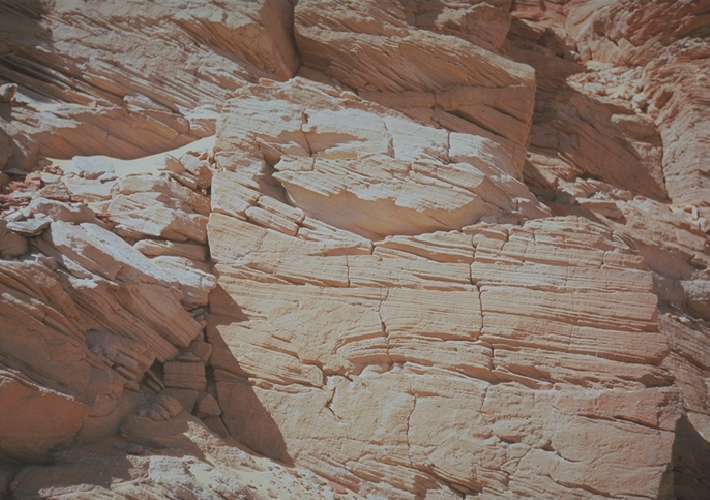 The sandstone sequence reaches a maximum height of about +870 m SL and exceeds the desert floor by about 150 m. Are this also strata of the Gilf Kebir Formation ? 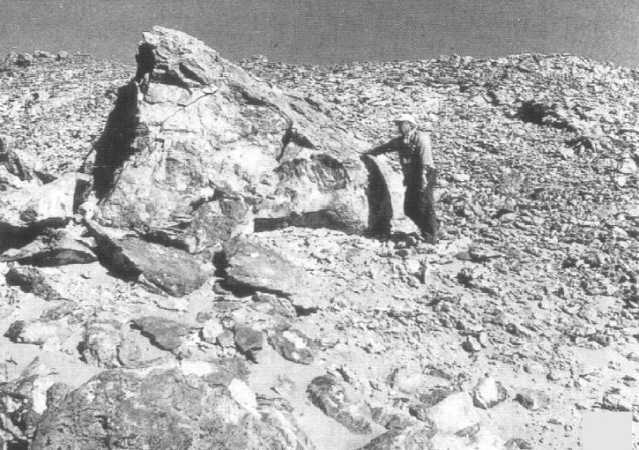 KLITZSCH, E. & LEJAL-NICOL, A. 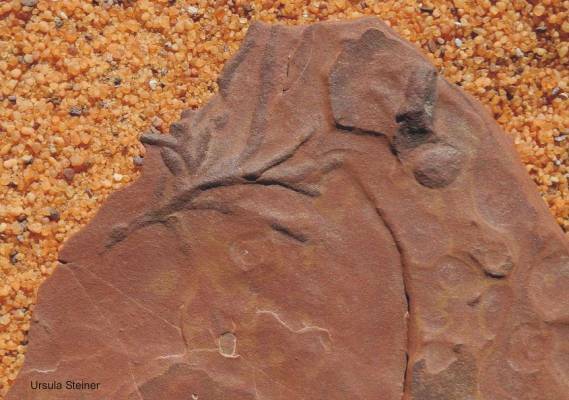 (1984): Flora and fauna from strata in southern Egypt and northern Sudan (Nubia and surrounding areas). 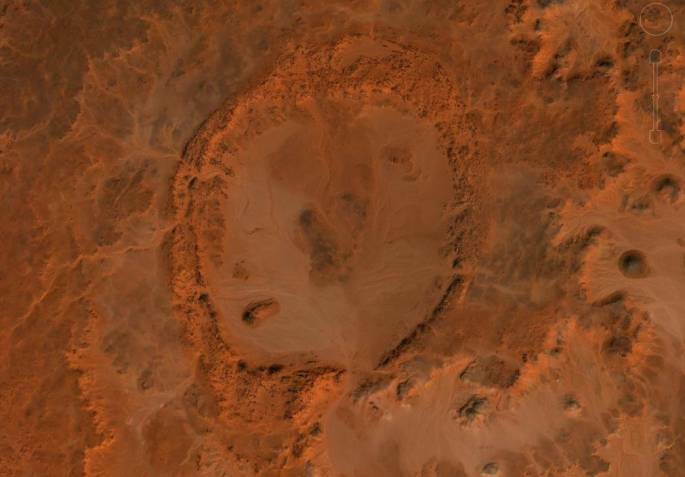 Berliner geowiss. 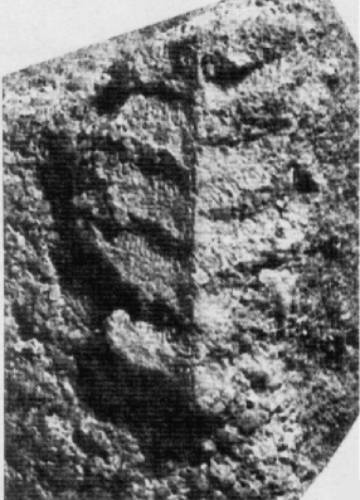 Abh., (A) 50, p. 47-79. 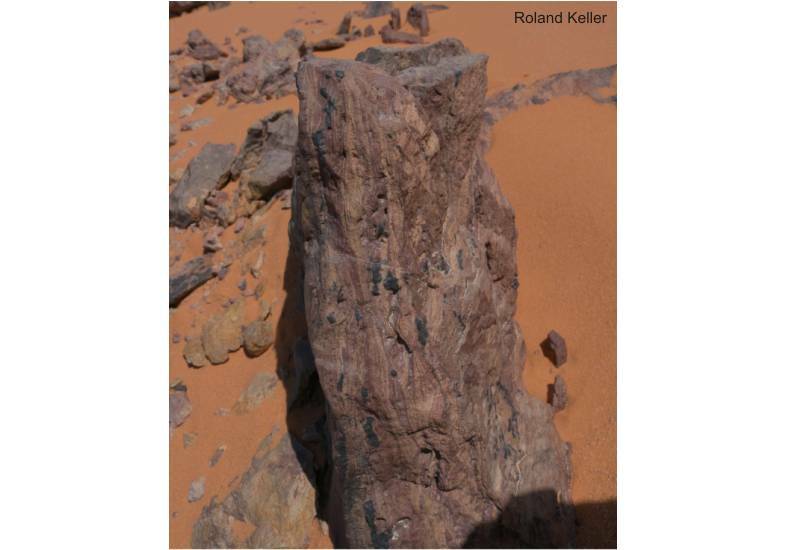 KLITZSCH, E. (1984): Northwestern Sudan and bordering areas: Geological development since Cambrian time. 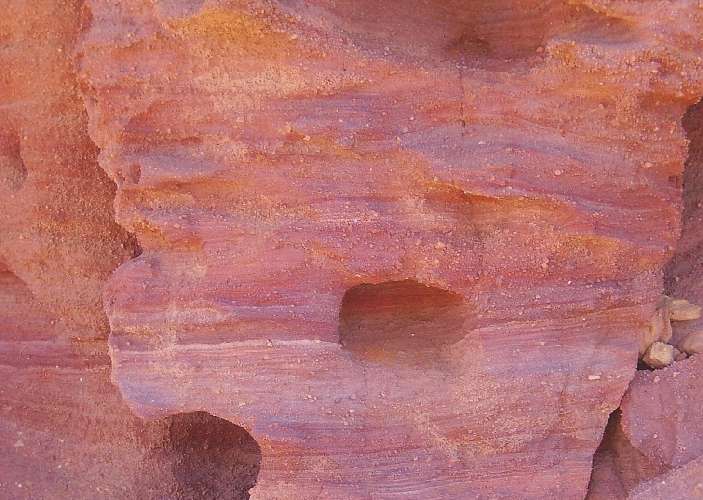 Berliner geowiss. 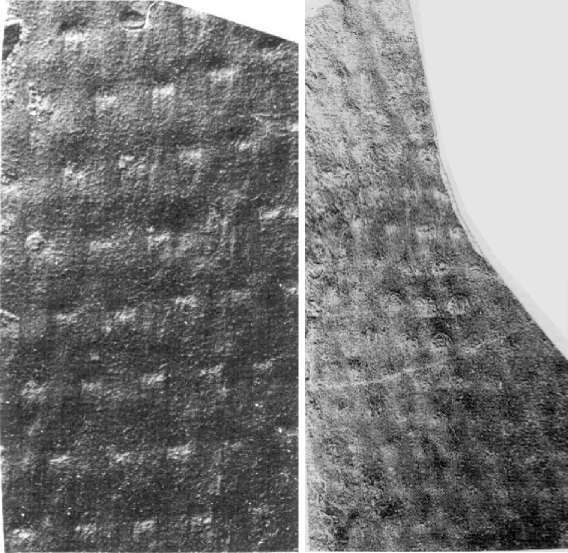 Abh., (A) 50, p. 23-45. 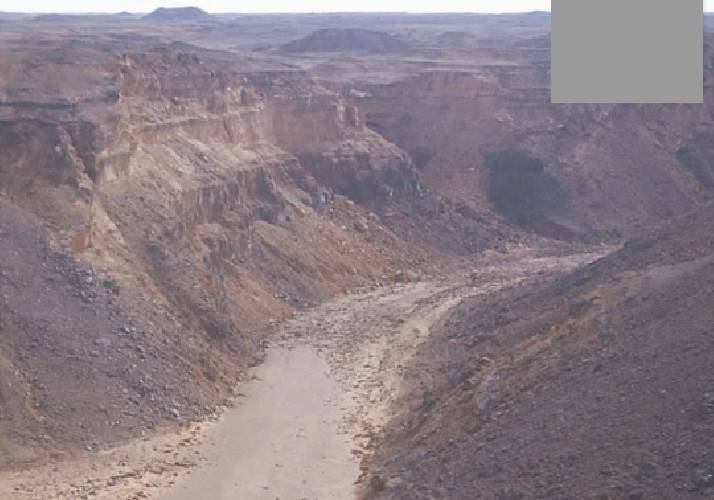 KLITZSCH, E. & WYCISK, P. (1987): Geology of sedimentary basins of northern Sudan and bordering areas. 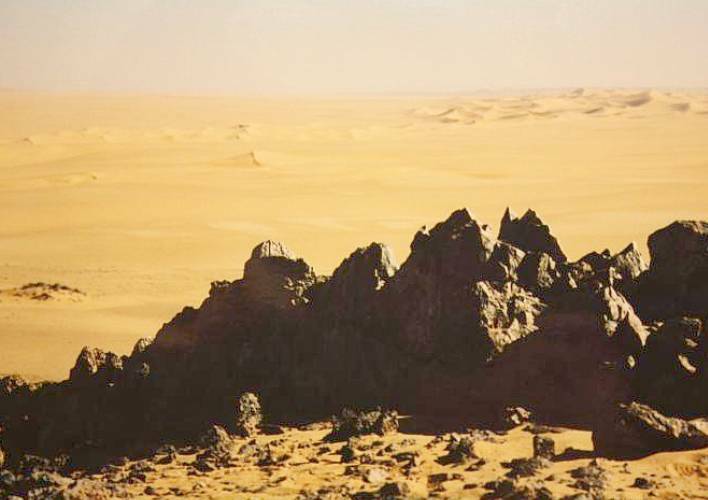 Berliner geowiss. 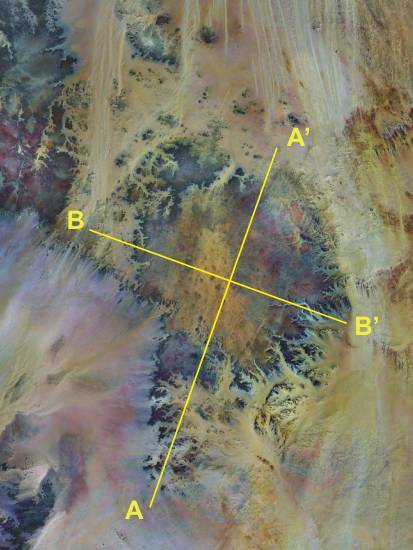 Abh., (A) 75.1, p. 97-136. 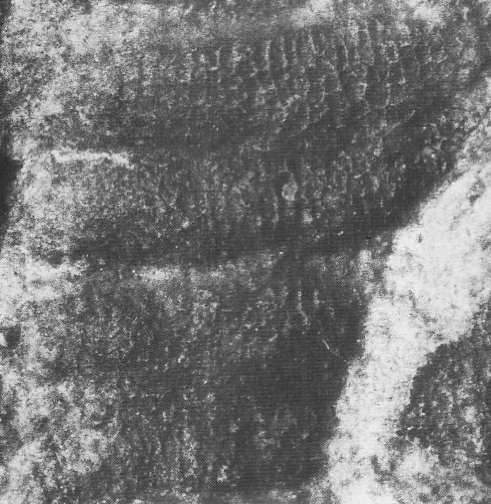 LEJAL-NICOL, A. 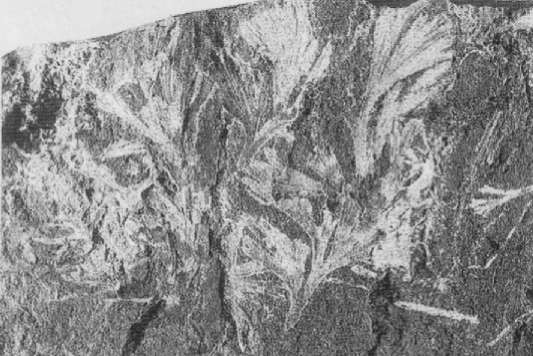 (1987): Flores nouvelles du Paleozoique et du Mesozoique d’Egypte et du Soudan septentrional. 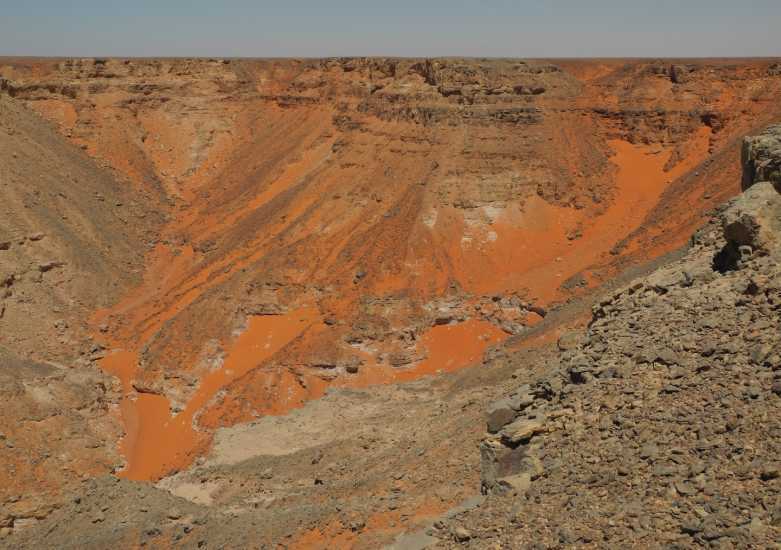 Especially the southern part of the Gilf Kebir as its surrounding (Clayton Craters & Gilf Kebir Crater Field) is extensively overprinted with subvolcanic intrusions. 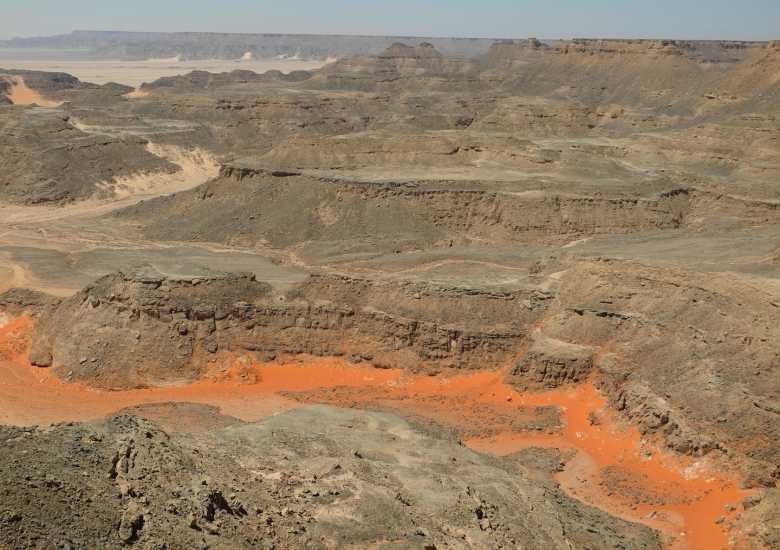 Across the entire plateau (including the wadis) are numerous basaltic plugs and crater-like structures distributed. 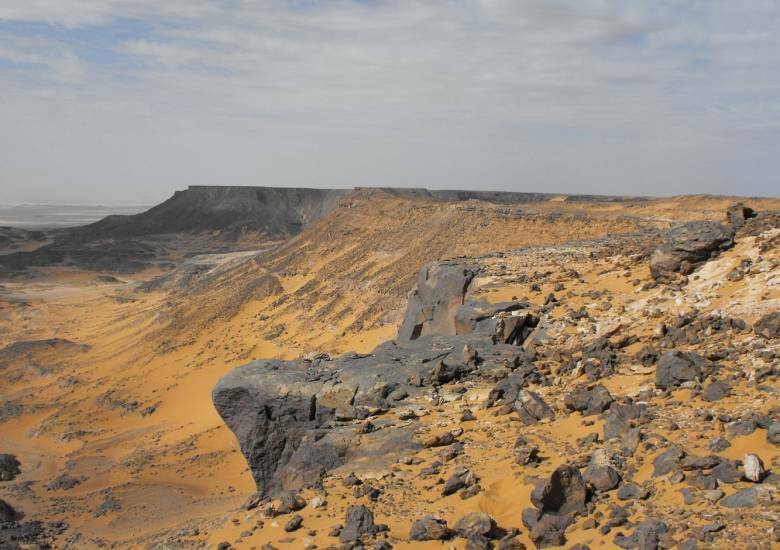 All things were made in the wake of igneous activities in the Oligocene age (Photo Gallery). 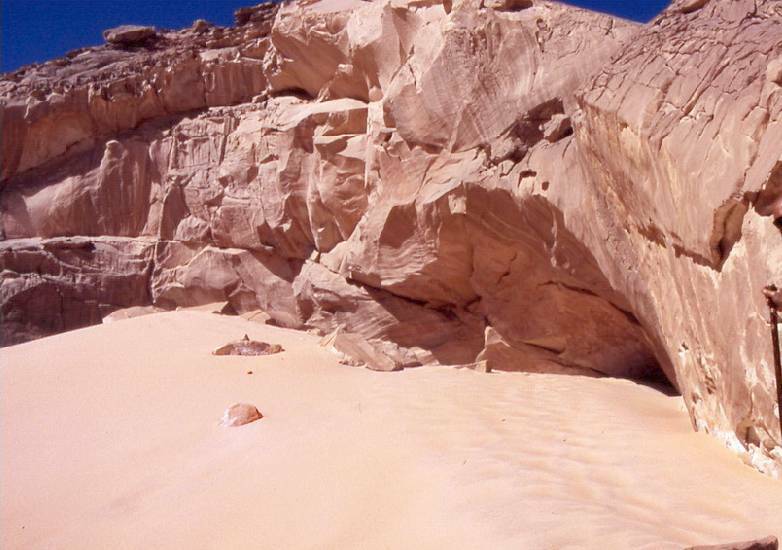 This is also the age of the Libyan Desert Glass (28.5 million years ago).